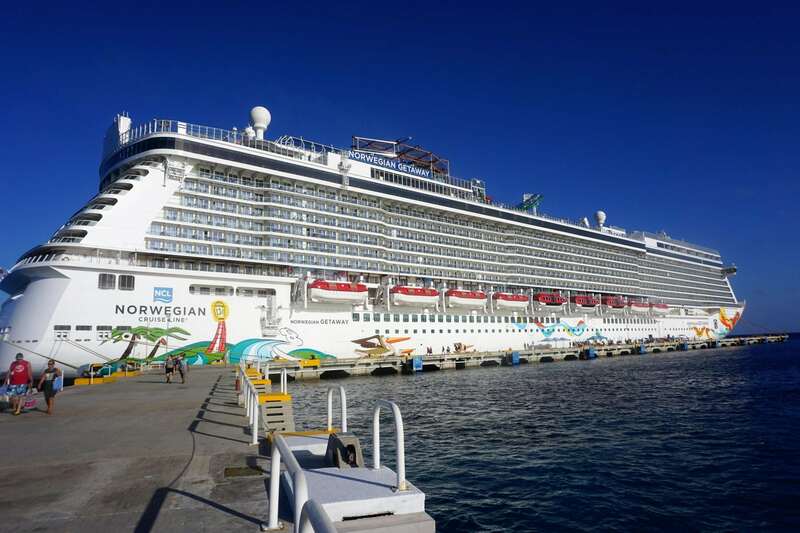 The second ship in the Breakaway-class, Norwegian Getaway burst onto the Miami scene in 2014. 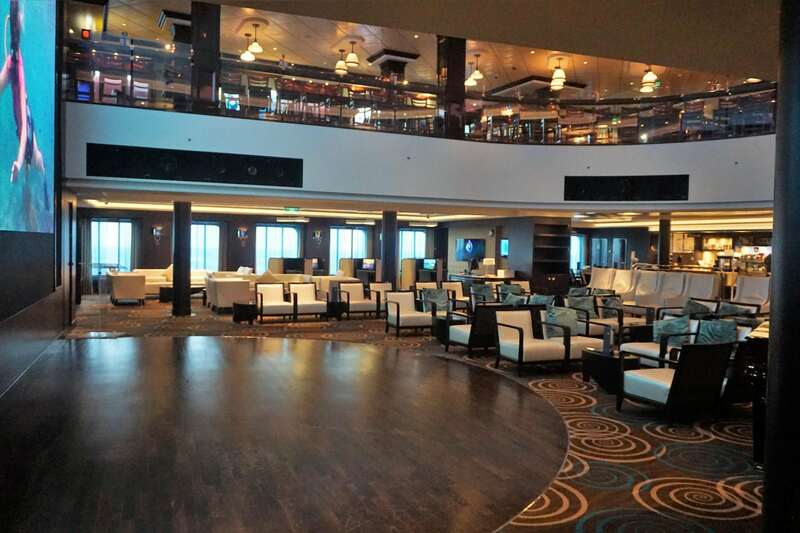 With signature venues that pay homage to her homeport city, the ship offers a unique flair separating it from the original Norwegian Breakaway. Still, this 145K gross ton ship is unmistakably a Norwegian Cruise Line (NCL) ship. 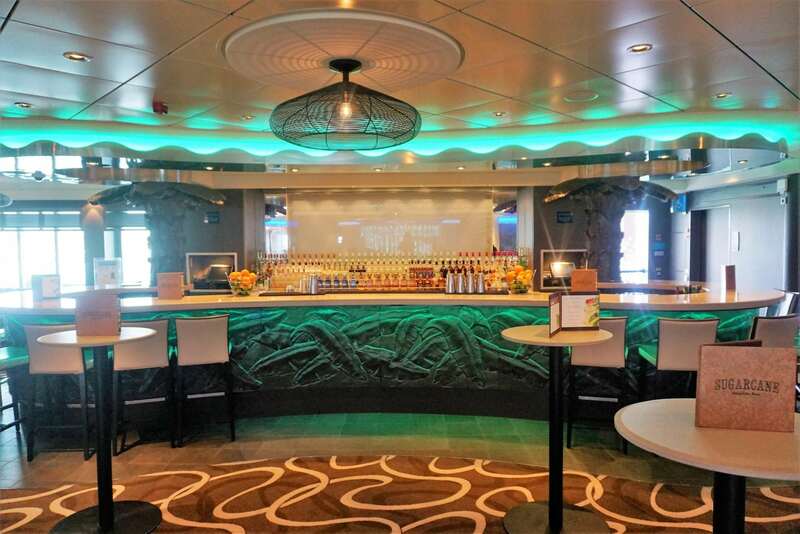 From the decor and styling of the public venues, to the freestyle approach to cruising, the ship fits in nicely with the brand’s other vessels. 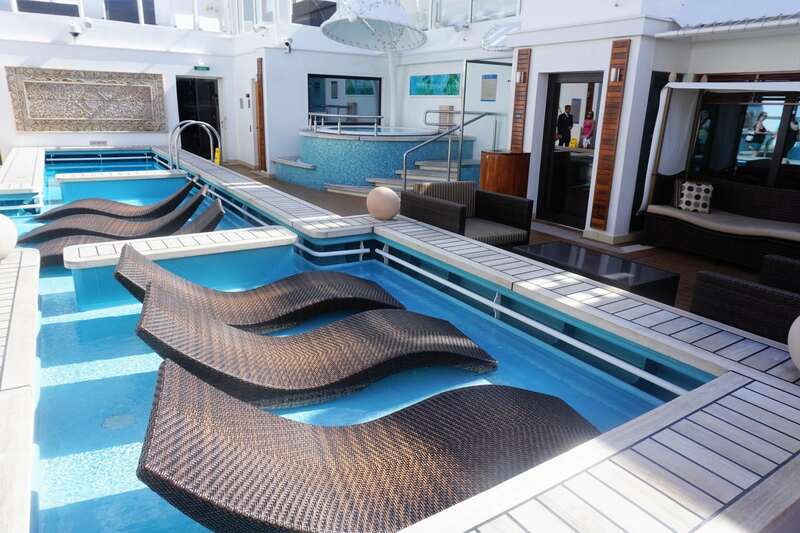 Having sailed on Norwegian Escape last year, we were prepared for many of the signature features of this ship. 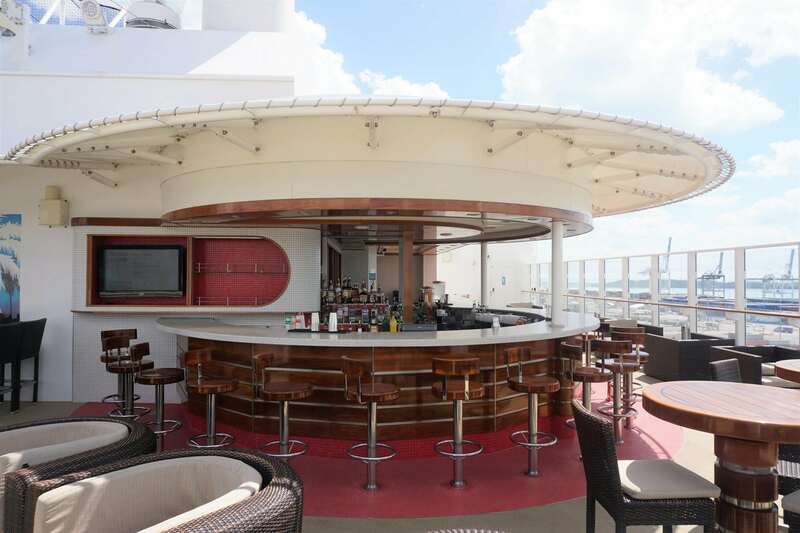 The open air Waterfront on Deck 8 is a nice outdoor place to grab a drink or enjoy the views with some al fresco dining in the evening. 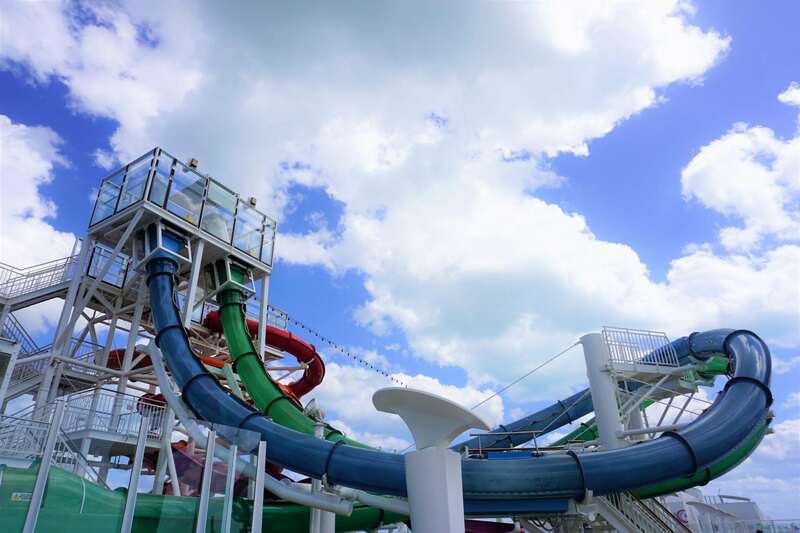 The waterslides and sports deck, as well as the adult only Spice H20 area, were among our favorite daytime locales. 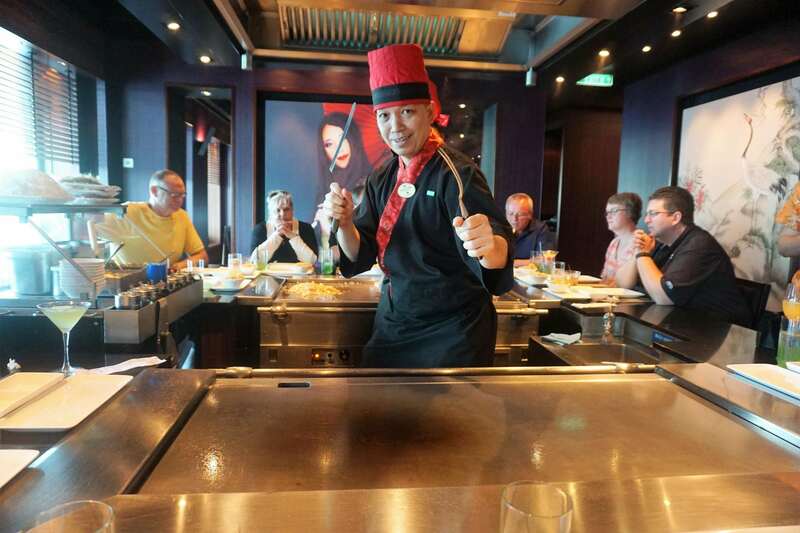 Several different dining options also offer flexibility and choice for a completely customize-able cruise vacation. 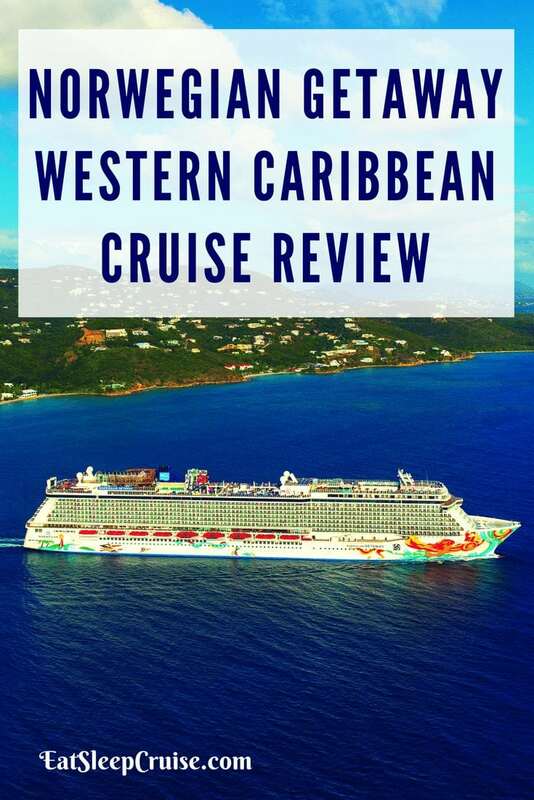 One of the draws of this vacation was the Western Caribbean itinerary. 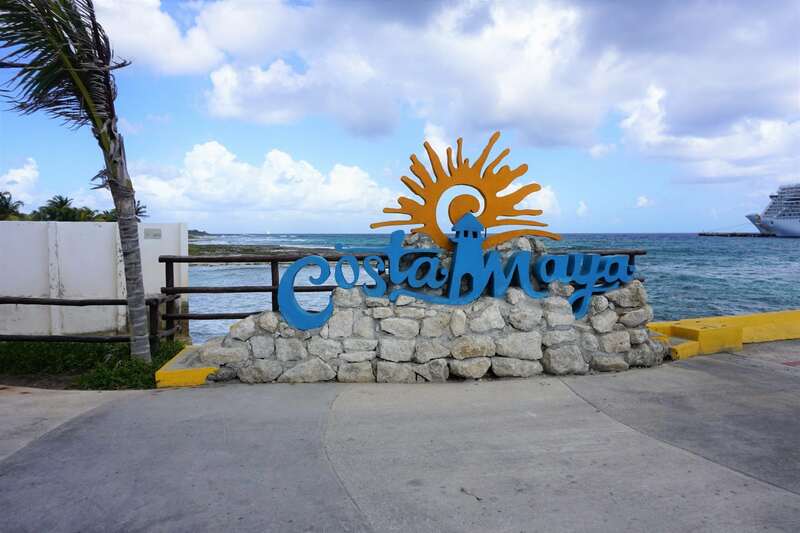 Along with visiting the popular Cozumel, Mexico, the ship was planned to make a stop in Costa Maya, Mexico. It had been 10 years since we visited this port, and we were looking forward to getting back there. 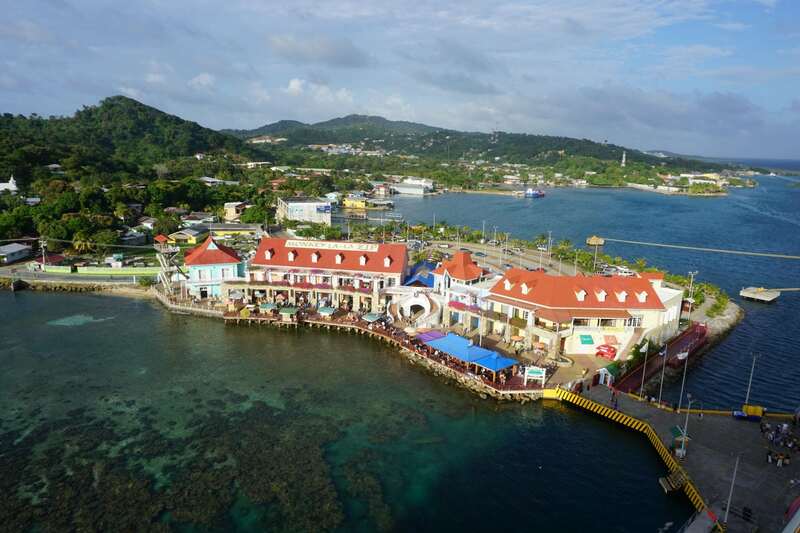 The ship was also set to visit Roatan, Honduras, a new port of call for us. This small island off the coast of the mainland offers some untapped adventures with jungle zip lines, animal encounters, and plenty of beaches and water-based activities. Of course, the biggest draw for us was the opportunity to visit Norwegian Cruise Line’s newest resort island, Harvest Caye, Belize. Perhaps the most exciting private island in the Caribbean, Harvest Caye boasts two zip lines, animal encounters, a massive resort style swimming pool with a swim up bar, as well as acres of beach. With a few restaurants, including a Landshark Bar and Grill, visiting this island alone was reason enough for us to jump at this cruise. Though yet again, Mother Nature had other plans for us. 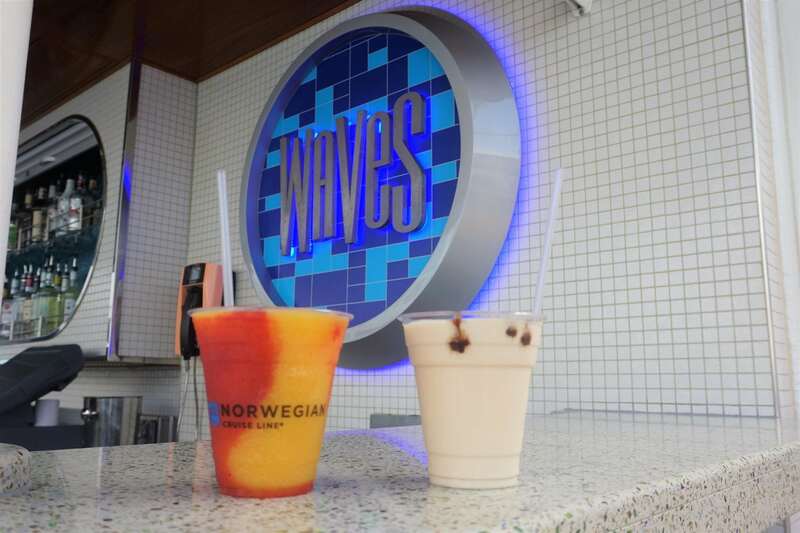 If there is one thing Norwegian Cruise Line knows how to do, it is deliver a unique dining experience. 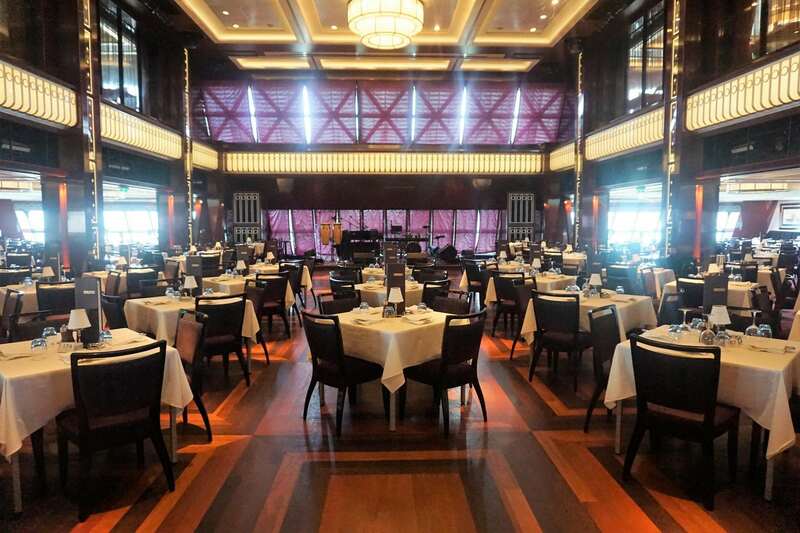 We always recommend cruisers get the specialty dining package as it is a necessity when sailing with this cruise line. We made good use of our package eating at 5 specialty restaurants. 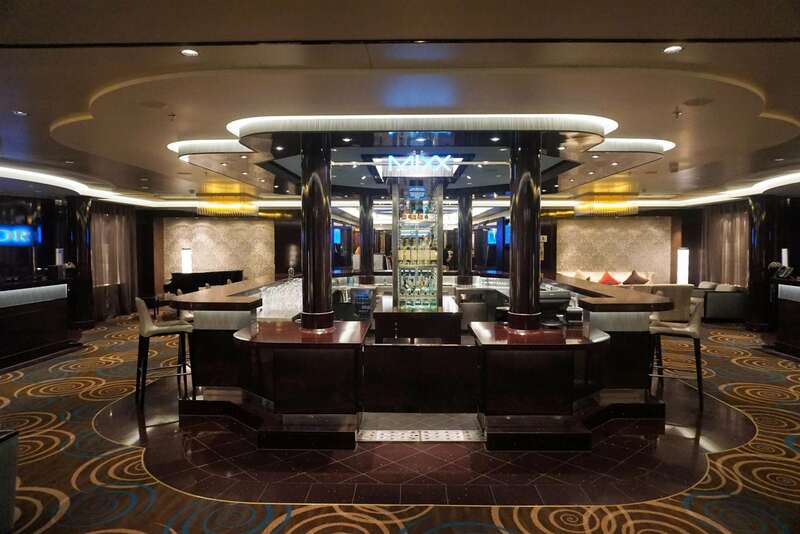 While the food in the main dining room is average, and the complimentary Shanghai Noodle Bar delivers superb Asian-influenced choices, the specialty restaurants are what separate the cruise line from other brands. The food was always cooked to order, service was solid, and the whole dining experience was a bit more sophisticated. 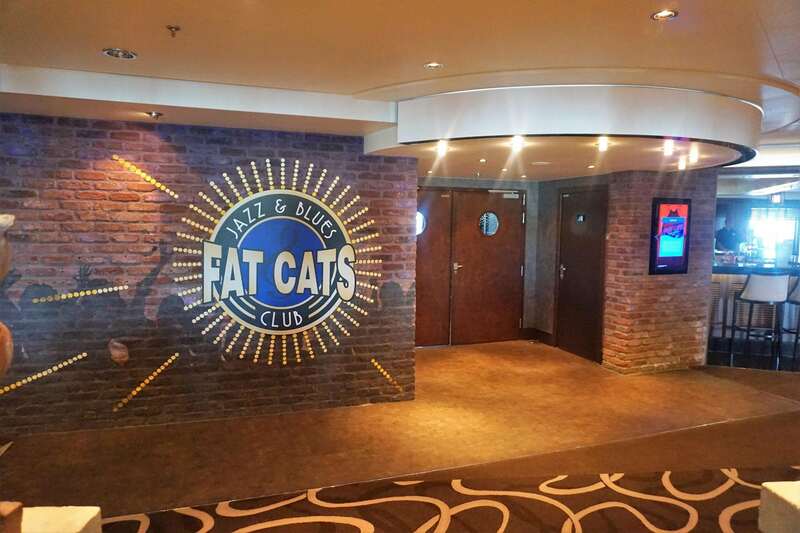 The cruise line offers a variety of night time entertainment, including the Headliners Comedy Club, which also doubles as the Howl at the Moon dueling piano bar. 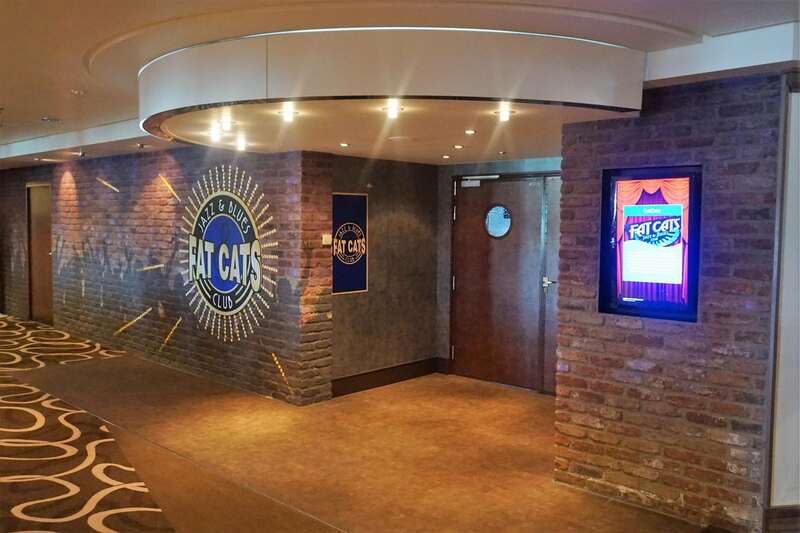 There is also live music in many of the bars, game shows, karaoke, and other activities. One of the drawbacks though is the entertainment in the main theater. While Burn the Floor was an excellent dancing spectacle, the other Broadway show, Million Dollar Quartet, was only so-so. We believe the ship could use a weekly headliner or another production show to round out the options in the main theater. Adding some diversity to the performances would really put the ship on par with other megaships which often offer several signature entertainment options in the main theater. After taking about 8 years off from sailing on Norwegian Cruise Line, this trip was our second cruise with them in almost a year. 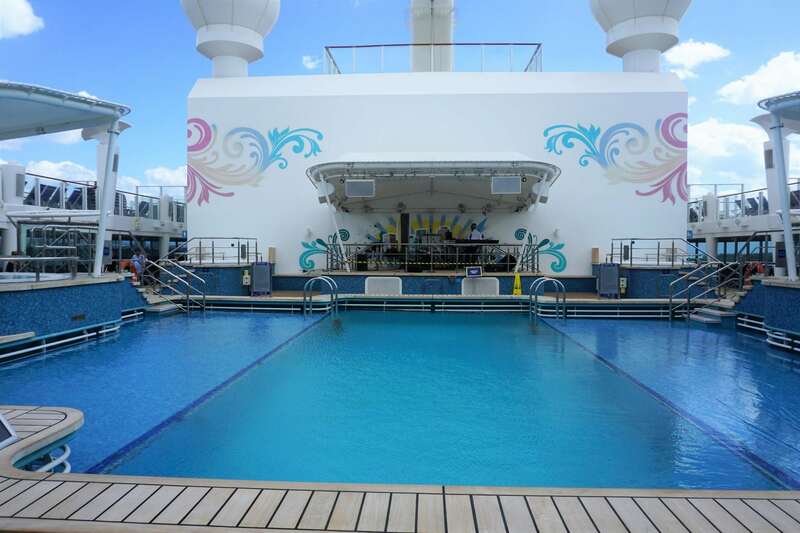 Given the overall experience, we can certainly see ourselves cruising with NCL again in the near future- in fact, May of this year. 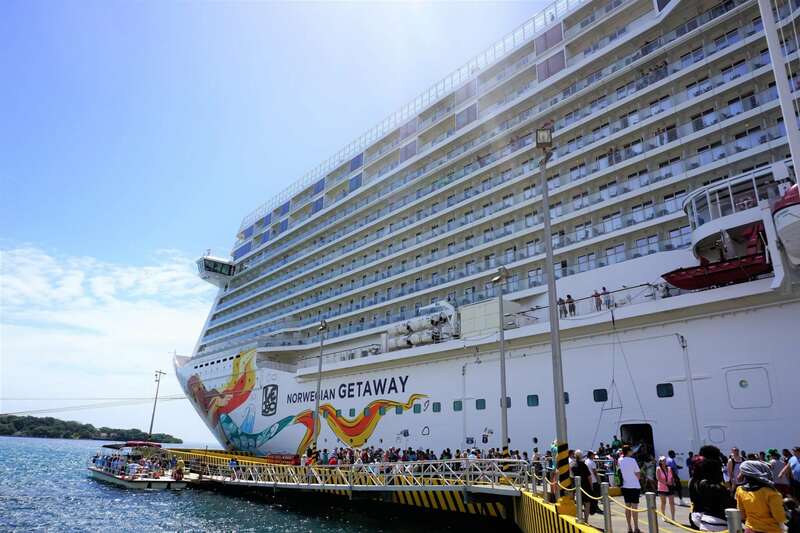 Norwegian Getaway appeals to all types of travelers, from families to couples, to more seasoned cruisers. 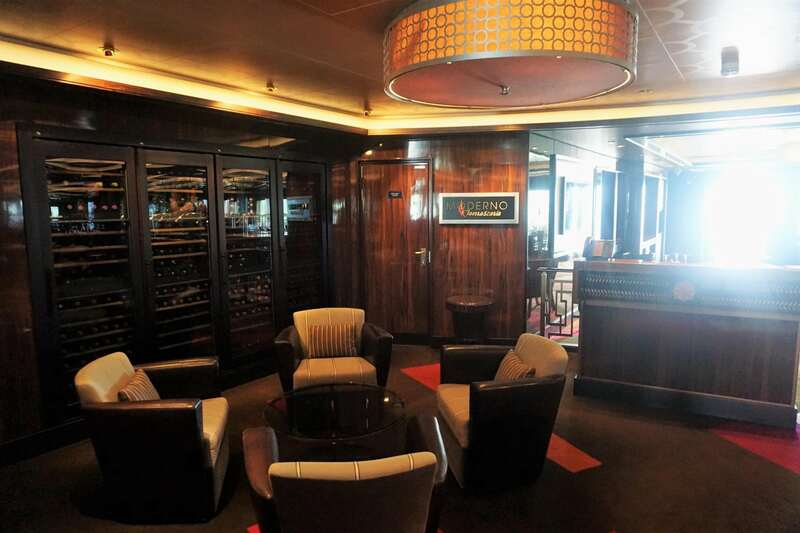 Dining was delicious, the onboard amenities kept us busy, and the staff was always there to provide excellent service. 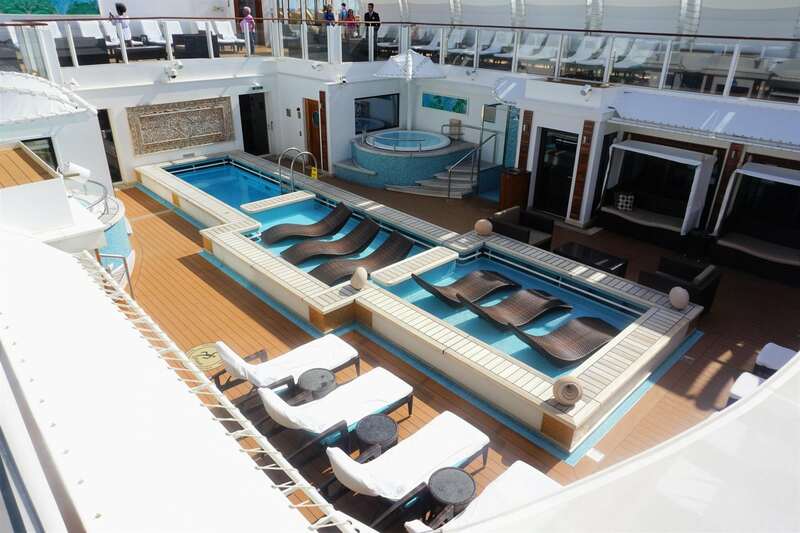 The ship was clean, well maintained, and provides a great value. 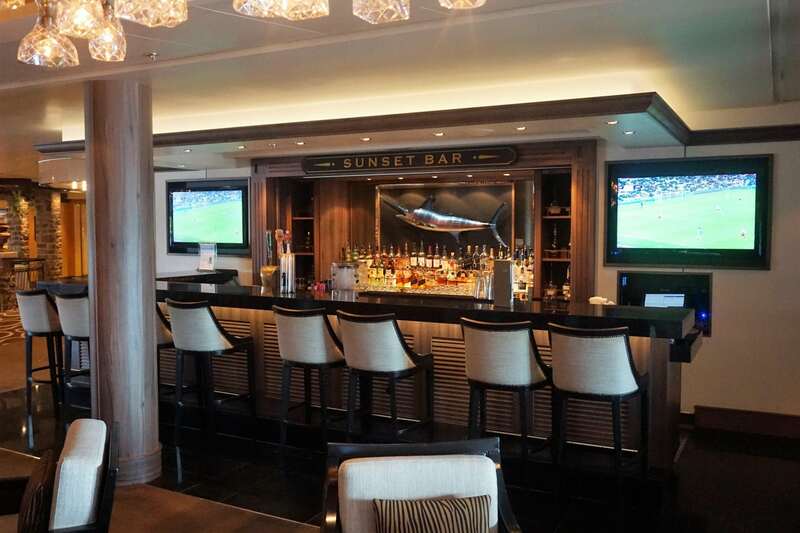 With the frequent Free at Sea promotions, where cruisers can often score a complimentary Ultimate Beverage Package, and sometimes even a specialty dining package or other perk depending on the room category, who could pass up such a deal? 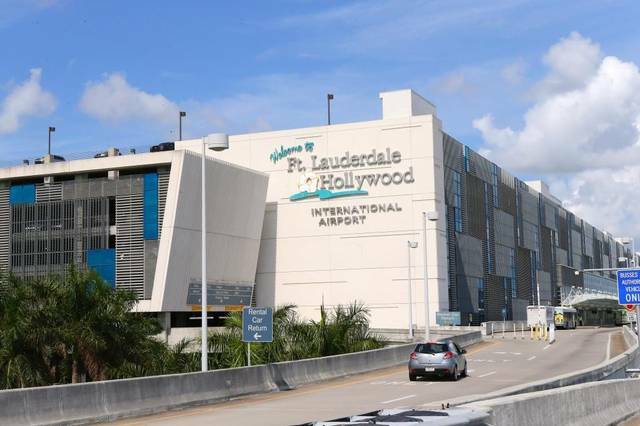 With our direct flight from Providence to Fort Lauderdale departing at 6:15am, it felt like we were just getting to sleep when the alarm went off at 2:00am. With our bags packed, cameras charged, and car gassed up the day before, we would not have a mad rush at this early morning hour. Like zombies, we rolled out of bed to get ready and were on the road a few minutes early, before 4am. It was a good thing, as we were going to need every minute this morning. Virtually empty roads meant we were at the airport’s long-term parking lot around 4:45am to find it rather busy. Then we remembered, it was Saturday, not our typical Friday morning departure. Grabbing a shuttle with little effort, the small bus filled up quickly, and we were on our way. Dropped off at the Southwest terminal, the line for curbside baggage check was rather long. By-passing that line, we went inside to find the longest Providence Southwest bag check line we have ever seen. This line was only surpassed by the even longer security line. Good thing I like to arrive early. Someone was looking out for us this morning because after a few minutes in a barely moving line, I got approached by a curbside attendant asking if “I was a good tipper”. To save myself 30 minutes and ensure we did not miss our flight, heck yes, I was a good tipper. Though the Princess was skeptical of this overly friendly stranger, the attendant assured us she was professional and showed us her TSA badge. Reluctantly passing off our bags, we got into the ever growing security line. 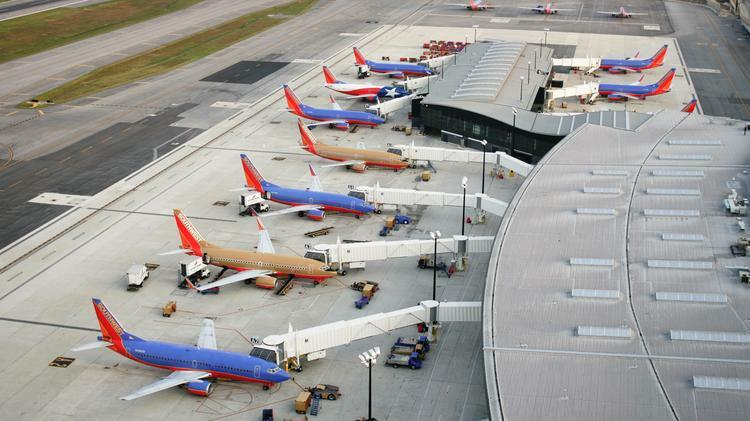 A 40-minute wait at most airports is expected, but it is unheard of this time of year in Providence. 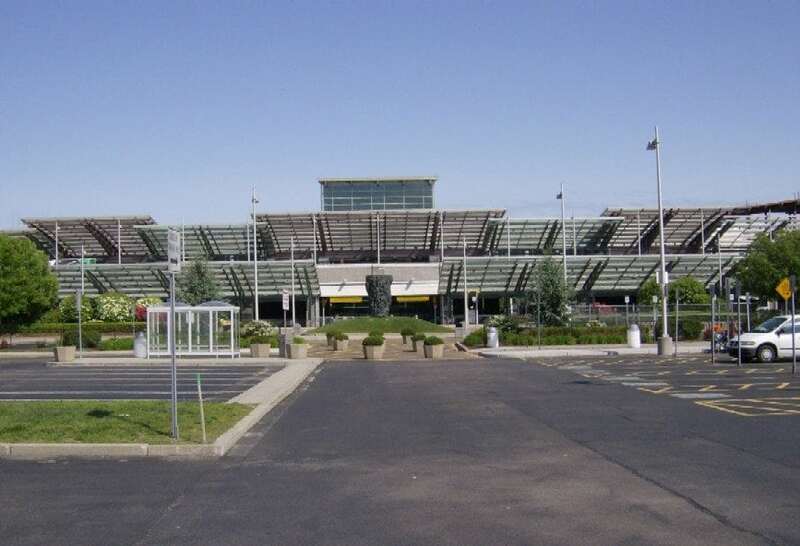 As the first flights out were being called, we routinely had other passengers trying to by-pass the line so they would not miss their flights. I was fine letting a person or two go, but as more people started following trend, and the security line still at a standstill, it was soon approaching our boarding time now too. Finally making it through security, we had just enough time to find our gate and make a quick pit stop at the restroom before our flight started boarding. Leaving the Princess at the gate, I ran back to Starbucks to get us coffee. By the time I was back with drinks and breakfast, the Princess had already boarded the plane. Yeah, there was definitely a swarm of travelers who were still stuck back at security and would probably miss their flights this morning. I boarded the plane, and the doors were shut shortly after. This plane was not waiting for anyone. We pushed back right at 6:15am and were off. 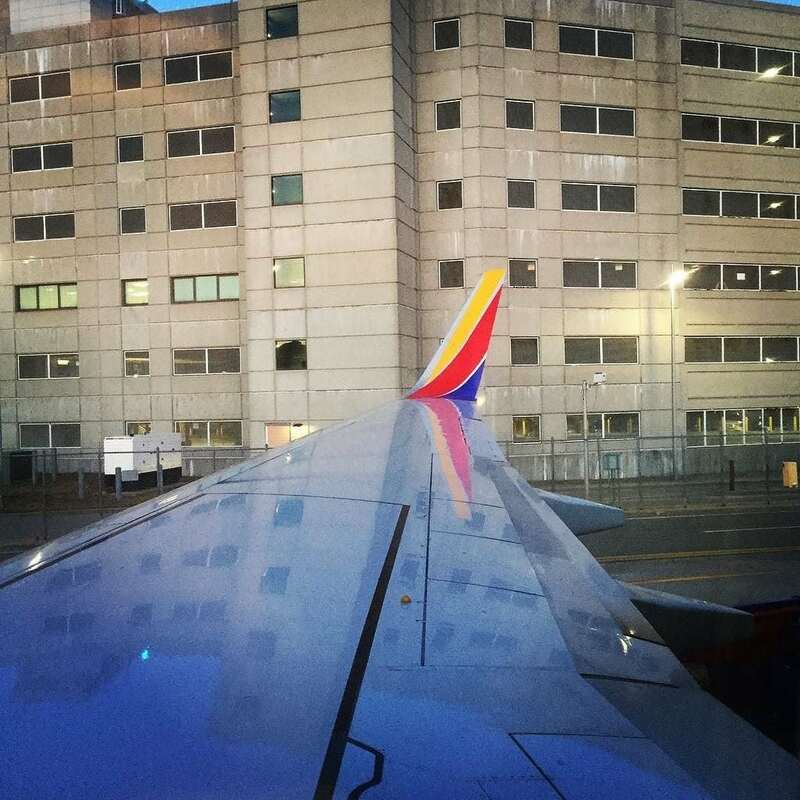 A smooth flight meant our plane touched down around 9:15am in Ft. Lauderdale, right on time. As always, Terminal 1 was a bit chaotic with travelers, many of them cruisers, coming and going. Down to baggage claim, our luggage was out in a timely manner, and we were in an Uber within 30 minutes. 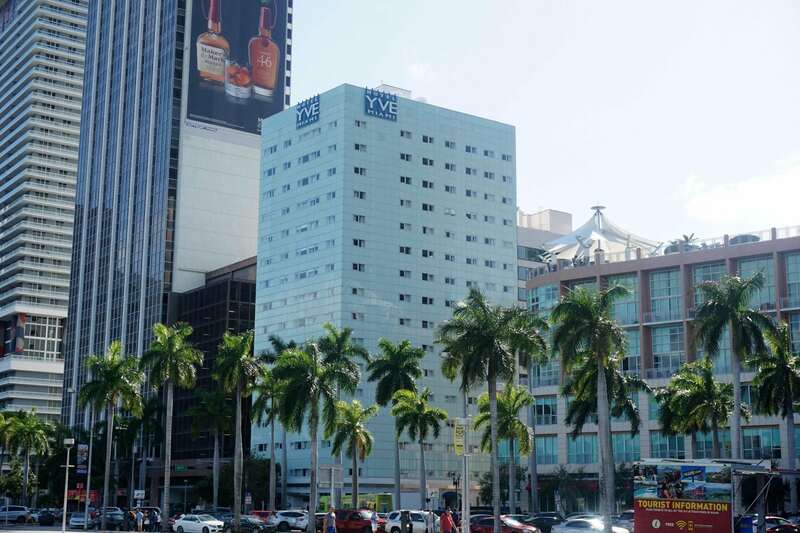 For this pre-cruise stay, the wife picked the Yve Hotel Miami. 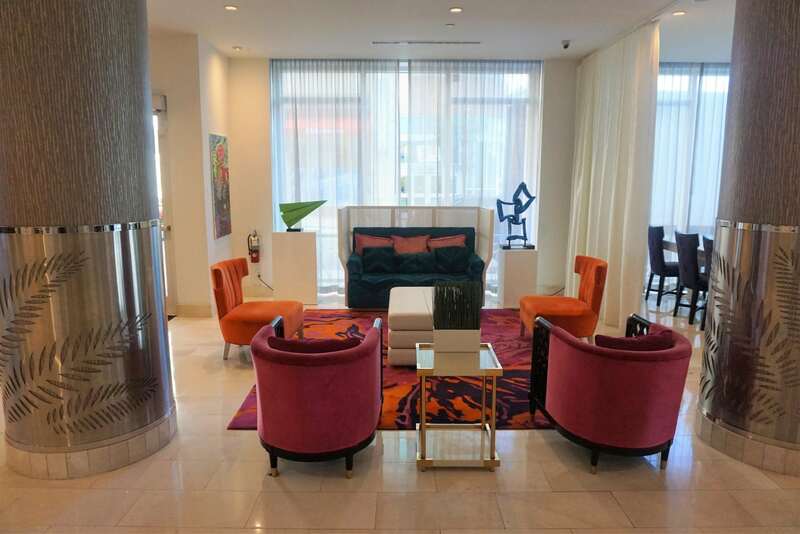 Located near the waterfront, and not too far from the Intercontinental Miami where we stayed a year ago, it seemed like a good fit. The weather was relatively pleasant, a windy 70 degrees with scattered clouds, but it certainly beat the weather we left back home. It took a few turns for our driver to eventually locate the hotel, but we finally arrived from Ft. Lauderdale to Miami around 10:30am. It was quite a scene entering the tiny lobby of this urban style hotel, with travelers coming and going. I had no faith that our room would be ready, and who could blame them given check-in wasn’t until 3pm? The line moved quickly, and we were at the reception desk in a matter of minutes. Processing our reservation, I was shocked to hear our room was ready for us. 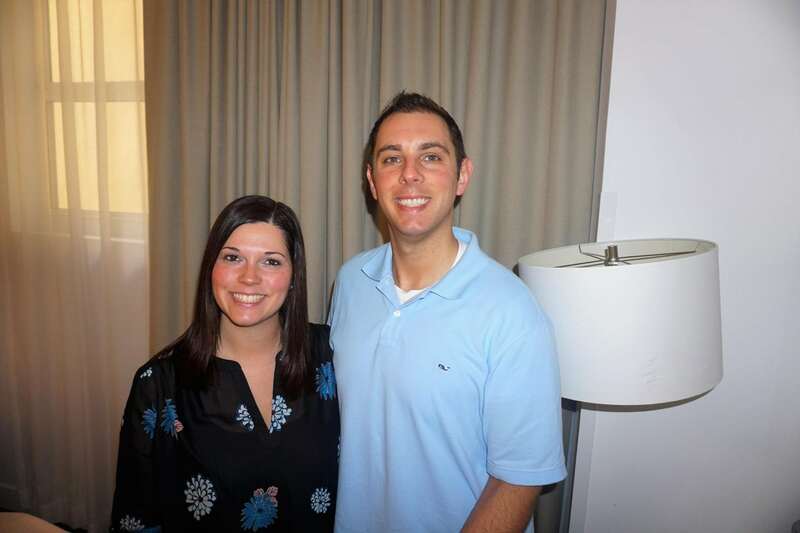 Cramming ourselves and luggage into the small elevators, we were up to the 8th floor for our boutique king room. Seeing some minor cosmetic work being completed in the public areas, it is worth noting that our king room could have used a little TLC itself. A bit smaller and more compact than we expected, we were a bit let down by our choice of hotel. 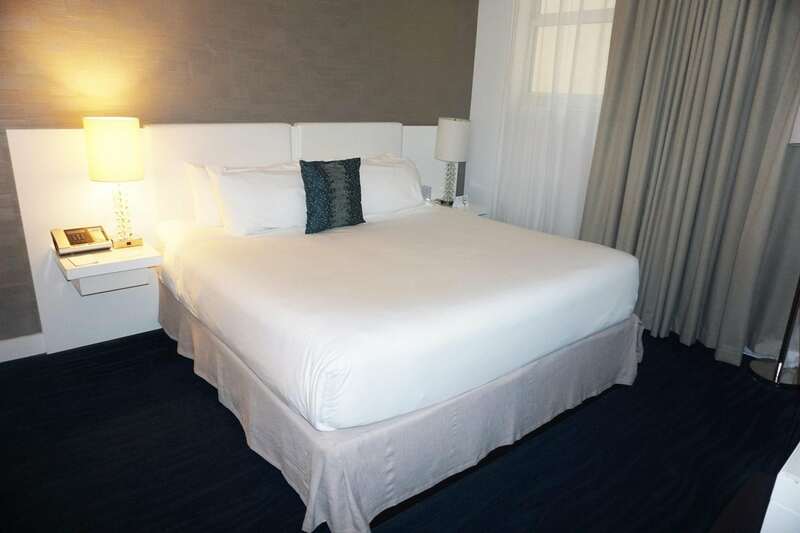 Judging from pictures on the website, we were thinking the room would have been a bit more stylish and well-appointed. Actually, the bathroom was probably smaller than the cruise ship counterpart. Oh well, we were only here for one night. 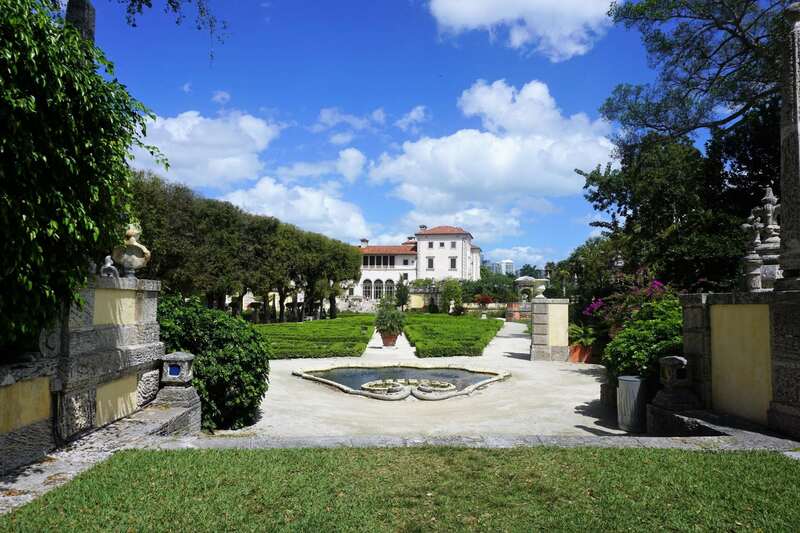 With all our luggage and accessories accounted for and stowed-away, it was our plan to spend the day checking out one of the city’s more historic sites, Vizcaya Museum and Gardens. First, we needed to hydrate ourselves. With a quick pit stop to grab some bottled water at the nearby convenience store, we requested an Uber to cart us off to the museum, which was less than 10 minutes away by car. This historic home and gardens was the winter homestead of James Deering, a retired millionaire who created the estate in the 1910’s. We arrived at the museum around 11:30am and ended up spending around two hours exploring the grounds. Several daily tours are offered, as well as an audio tour (if they are available), which are an additional fee on top of the entrance fee. Audio tours were sold out during our trip, so get there early if you want one. With an audio tour not being an option now, we decided to just roam the property on our own. 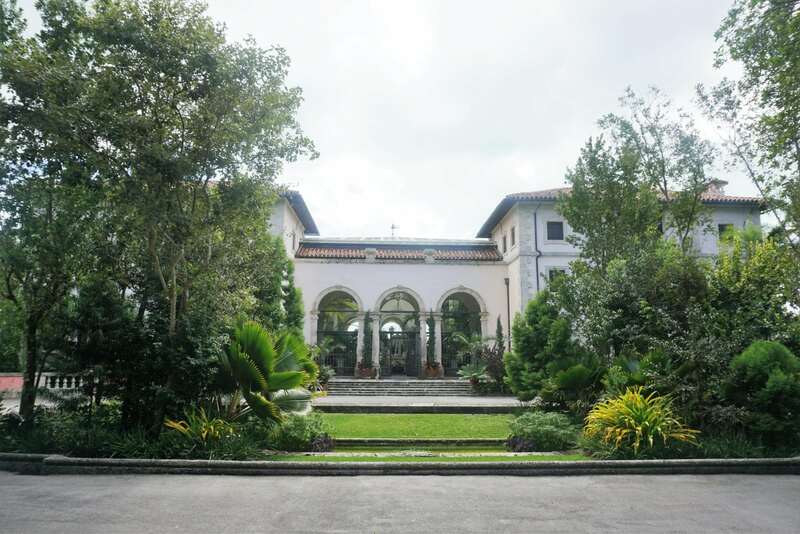 An elaborate and opulent mansion, it is quite a marvel to explore. The museum is well maintained with many original artifacts, antiques, and art collected by Deering that date back hundreds of years. Heavily influenced by European estates, this secluded location will make you feel like you have been transported to Italy or France. Of course, we took plenty of pictures, and I was impressed that the Princess took the time to read many of the descriptions of the different exhibits. The gorgeous weather meant we had time to stroll the gardens and outdoor areas as well. 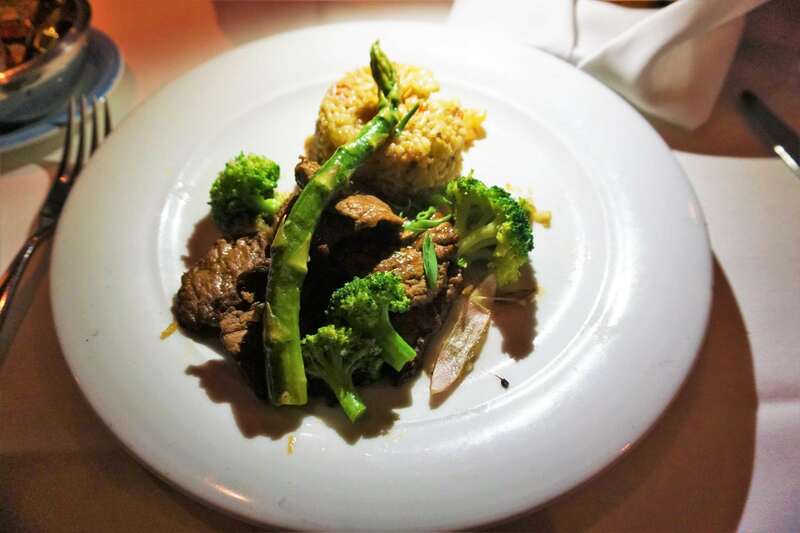 Stay tuned for our full review of Vizcaya coming soon. Having left no corner unexplored, we hitched an Uber back to Bayside Marketplace, across from our hotel, by 2pm. 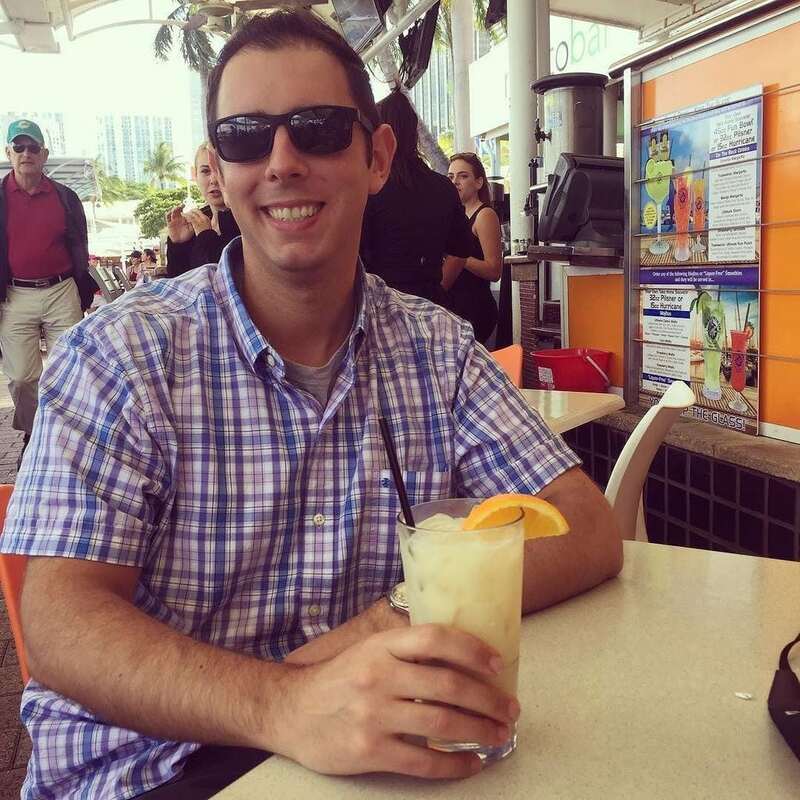 Wanting to enjoy more of the outdoor weather, we grabbed a table at one of the outdoor restaurants that line the harbor waterfront. Staking claim at the first restaurant that had availability, we scored two apps and drinks at Tradewinds Bar and Grill. The restaurant had their own “hurricanes” menu, complete with various degrees of strength, so I had to go for a Category 2 drink. The meals were respectable pub-type food, even if the service was rather aloof. Finishing up our snack in an hour, we strolled the marketplace taking advantage of the nearby Starbucks to get two-for-one iced caramel macchiatos. With our drinks in hand, it was back to the hotel for 3:30pm, giving us two hours to blog, check social media, and get ready for dinner. Being up since 2am was starting to take its toll on both of us. Debating if we should even head to dinner, we mustered up the strength to get out for a few more hours. 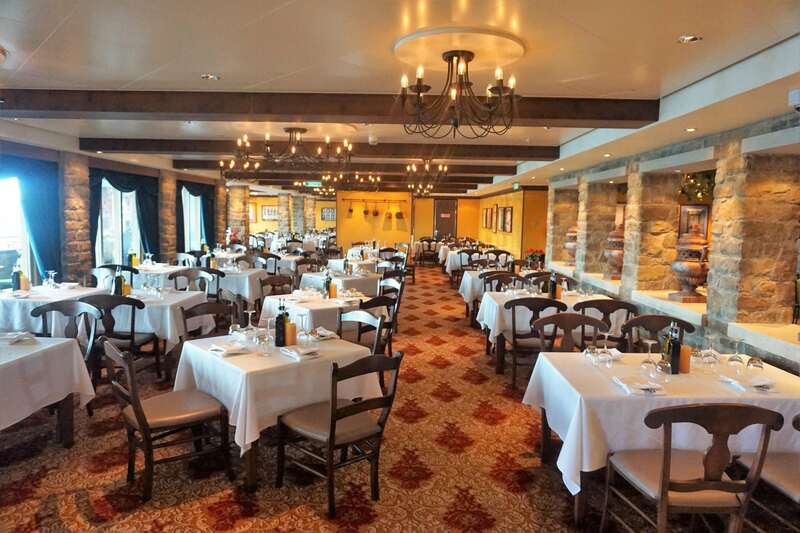 Before leaving on our trip, we made dinner reservations at Fi’la, an Italian restaurant from Michael Schwartz, a well known chef, especially for those who cruise. 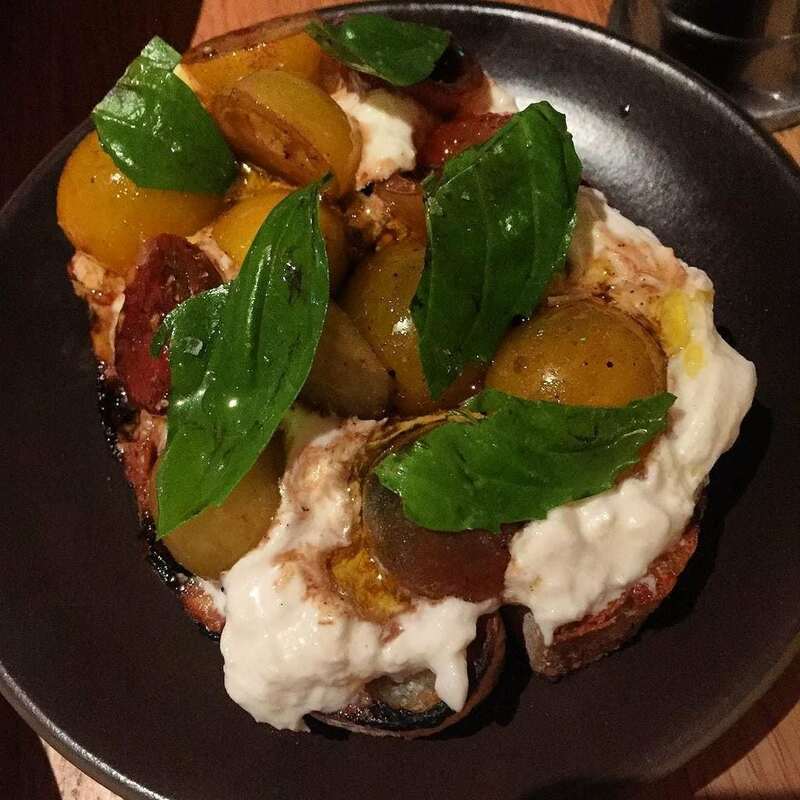 We started dinner off with the bruschetta, which was quite tasty and had some of the best mozzarella cheese we have ever eaten. For entrees, I did the Rigatoni Bolognese, and the wife did the Sam’s Chicken Parm. On recommendation from the waiter, I also ordered a side of meatballs. While good, they really were not necessary. The plates were small but very rich, so by the end of the meal, we were both in the trenches of a food coma. Feeling overly stuffed, and our cruise had not even started yet, we walked back to the hotel, which was just over a mile from the restaurant. The weather was mild and not as windy as earlier in the day…until we got back to the waterfront. The last few blocks were a struggle as we were fighting some strong gusts of wind. Back to the hotel before 8pm, there was not much left to do but a quick check of social media and email then get ready for bed. Exhausted from the day, we both fell asleep before 9pm. It was a rather long pre-cruise day. With an early bedtime the night before, we were up and somewhat awake for this embarkation day by 7am. I wanted to be out of the hotel no later than 9:30am given the chaotic scene the morning before. I would be perfectly fine waiting in a line at the cruise terminal as opposed to being crammed into the lobby of the hotel. As the Princess prepared for the morning in the micro-bathroom (with the only mirror in the room), I headed out for some morning coffee and bottled water. 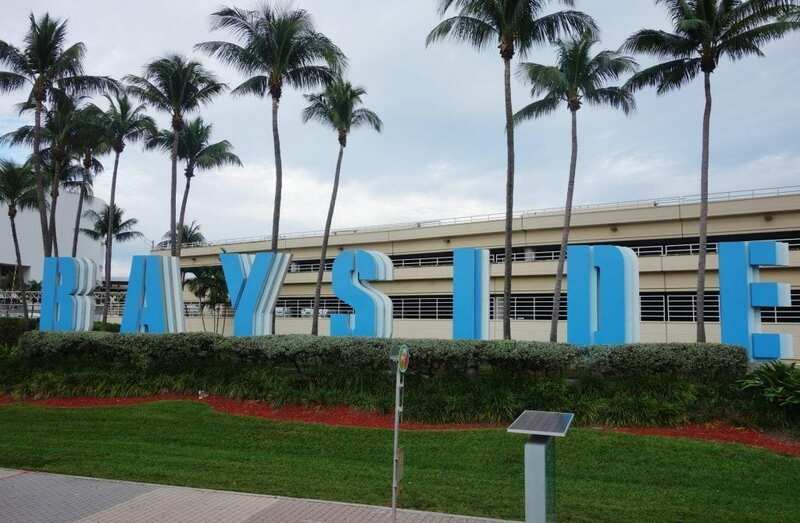 The only thing really going for this hotel was its location, close to the amenities at Bayside Marketplace. A relatively quiet downtown Miami meant I was able to grab everything and return to the hotel in record time. Double checking our luggage and a few in-room selfies later, we were off by 9:15am. With only two elevators, shared by guests and staff, we were prepared to wait a while for an available lift. When elevator after elevator came down packed to capacity, I recommended hitting the up button. As luck would have it, the next elevator heading toward the penthouse arrived empty. Hopping on, we went up for the ride, then started back down. This time around the lobby was more manageable, so we were checked out with our receipt in hand within 10 minutes. An Uber was literally a few blocks away, so another two minutes later, and we were in a car on the road toward Port Miami. From pick-up to drop off and bags checked took about 10 minutes. Being about 9:35am now, a small line was forming at the entrance of the terminal. It took only about 15 minutes before the doors were officially opened and we were shuffling toward security. Quick and painless, check-in took only 20 minutes. Even though we were among the first people in line, we ended up with boarding Group 3. This is one area that NCL could improve. Their embarkation process can be a bit chaotic, especially once the crowds start forming in the waiting area. Waiting roughly an hour, embarkation did not start until close to 11:30am. As the masses began to crowd the entry point, we were both patient and did not proceed to the entrance until our boarding number was called. It was now time to get this cruise started. 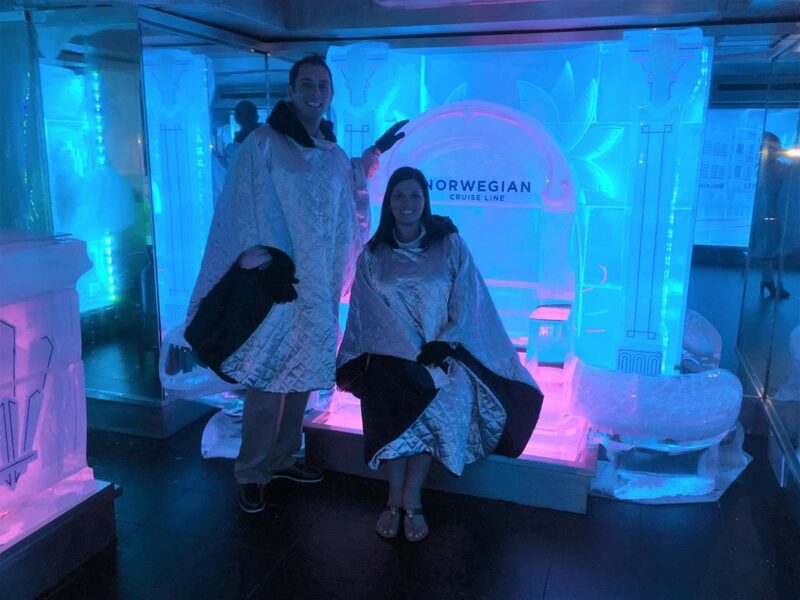 Stepping foot on Norwegian Getaway on Deck 7, traveling through crew only areas and the casino, it was time for our traditional photo tour. Passing the crowds, heading to the aft of the ship, it was up to Deck 16. An empty Spice H20 meant our delay getting onboard had not cost us too much. From then on out, getting public venue pictures without any other travelers was going to be difficult. We spent the next 90 minutes maneuvering through the occasional crowds getting pictures of the outdoor and indoor attractions, restaurants, and bars. Admittedly, it was not the smoothest of our photo tours. Still, we scored about 50% of the photos we had outlined prior to the cruise. Not a complete victory, but it was still a solid showing for a busy first day. 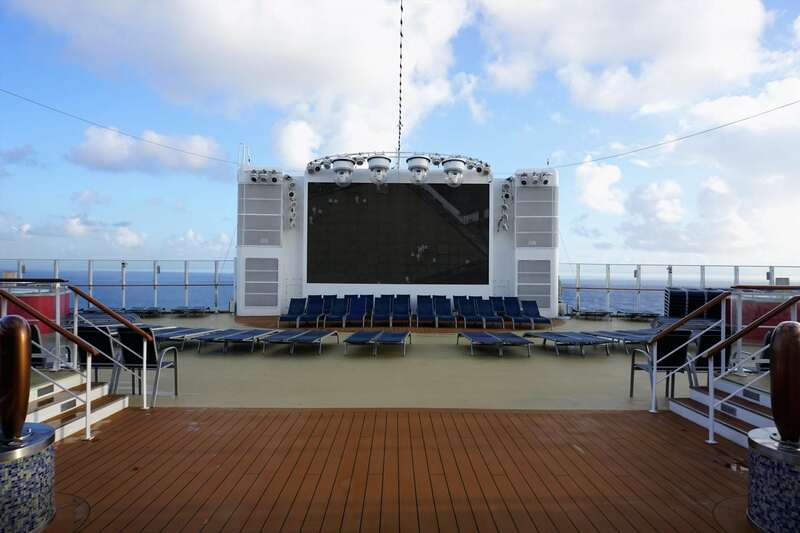 In the middle of this photo set, we tried to use one of the onboard digital screens to book the comedy shows for the week as they are the only shows you cannot pre-book before the cruise. Unfortunately, the screen did not recognize our room key card. Trying to beat the rest of the cruisers to the punch, the Princess whipped out her cell phone and began booking the shows using the Norwegian iConcierge app. 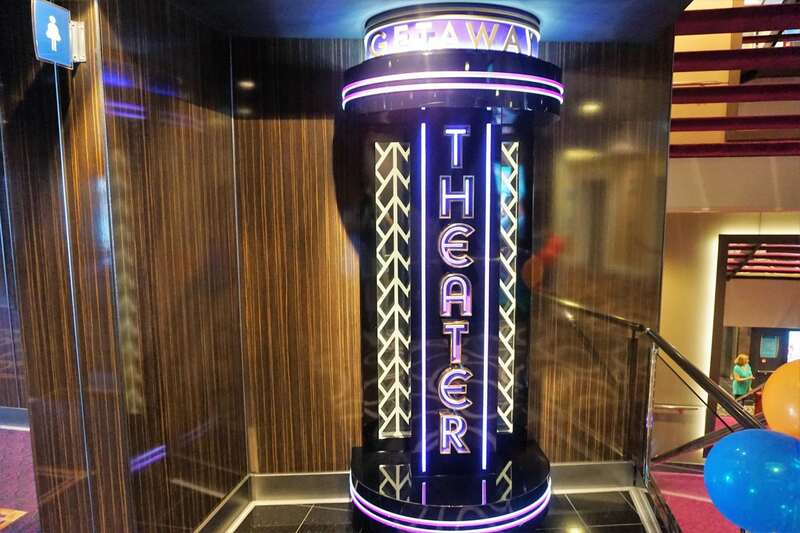 While the app appeared to be working, it was unclear if the shows were being added to our reservation because there were additional names assigned to our stateroom on the app. A little after 1pm, we had successfully descended about 10 decks. While near the Atrium, we stopped to check-in with the Norwegian Cruise Line social media team and other sponsors running the Fins Up and Sail Away promotion. Getting our welcome packet and meeting all of the sponsors, we were ready to show everyone how EatSleepCruise cruises! It was around this time that we found ourselves in a bit of a no man’s land- wait for our room to be ready or just head to lunch with our carry-ons. While deciding, the announcement was made that rooms were ready. Finding our way back up to deck 11 forward, we made a pit stop at our balcony room, 11714. 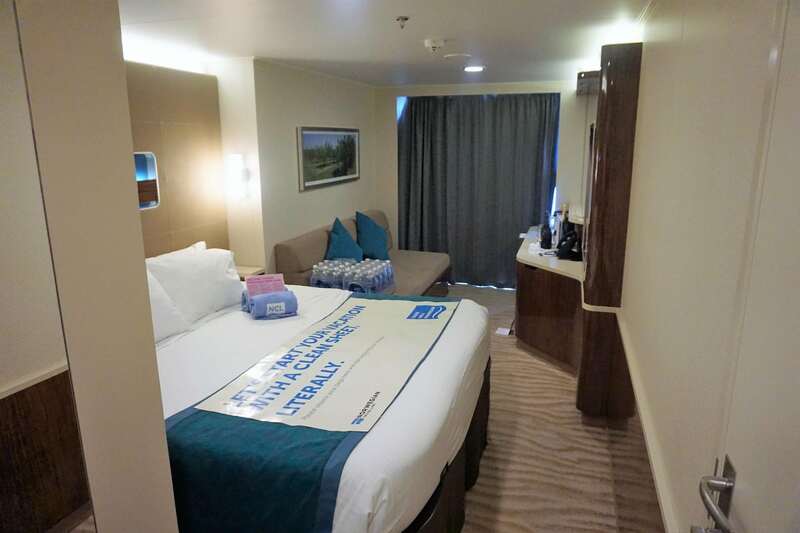 A pretty standard room, the layout was about the same as our room on Norwegian Escape. 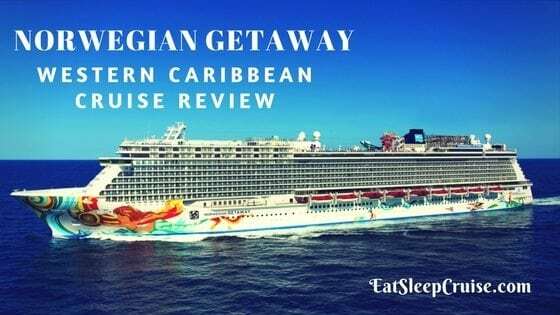 Norwegian Getaway Western Caribbean Cruise Review. Unfortunately, our bags would not arrive until later in the afternoon, after our muster drill, so we could not use this time to unpack. 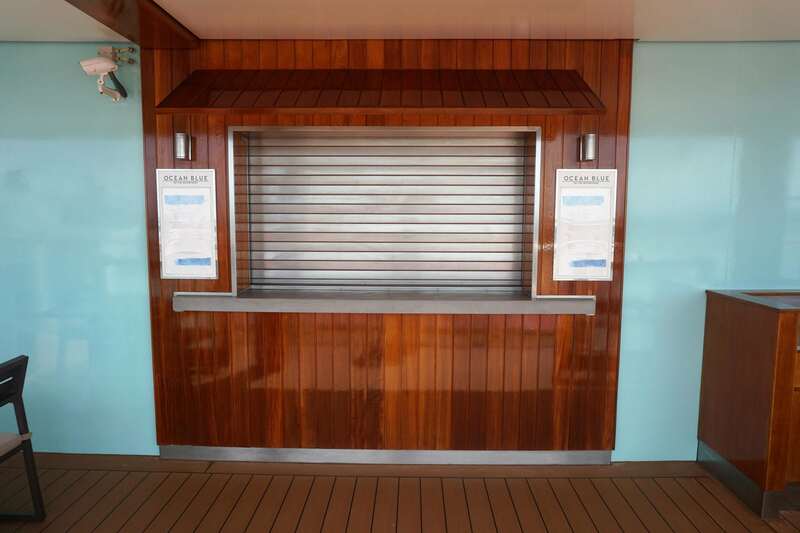 So, what do you do when you are on a cruise ship, have no luggage, and have taken all your pictures? 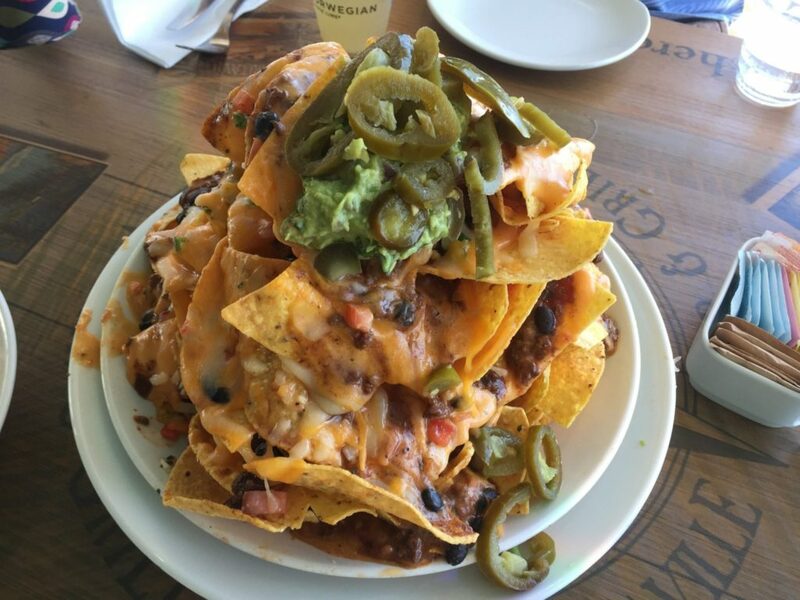 If you said get something to eat and drink, you would be 100% correct. 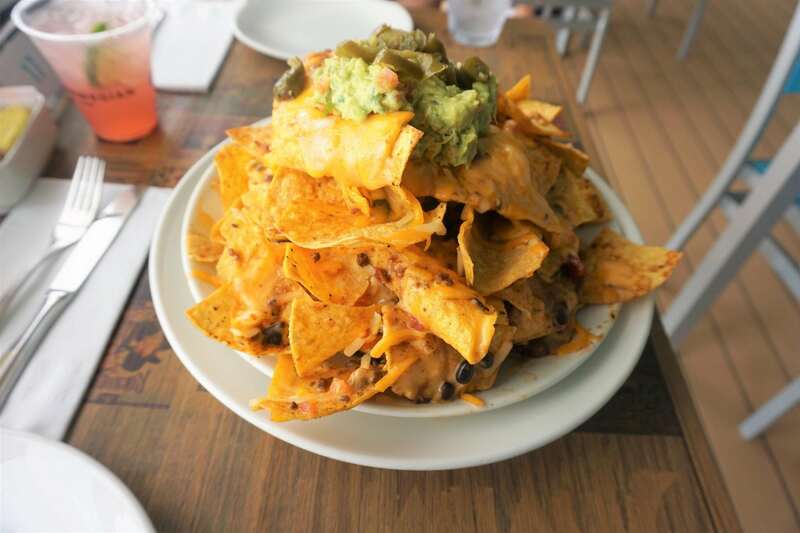 Avoiding the lines at the buffet, which we were able to do most of the cruise, getting some Volcano Nachos and margaritas at Jimmy Buffett’s Margaritaville was a no brainer. The small a la carte prices for the food meant we could enjoy the al fresco dining without the chaos of the Garden Café. And of course, sample some margaritas which are included in the beverage package. Our snack took us right up to 3pm, the 30 minute warning for muster. Essentially closing down the venue before muster, we took a few minutes to call home. By the time we finished a few outdoor selfies with the Miami skyline behind us, it was time to head to our muster station, B5, which happened to be in O’Sheehan’s Pub. Muster was completed in about 20 minutes, right before 4pm. 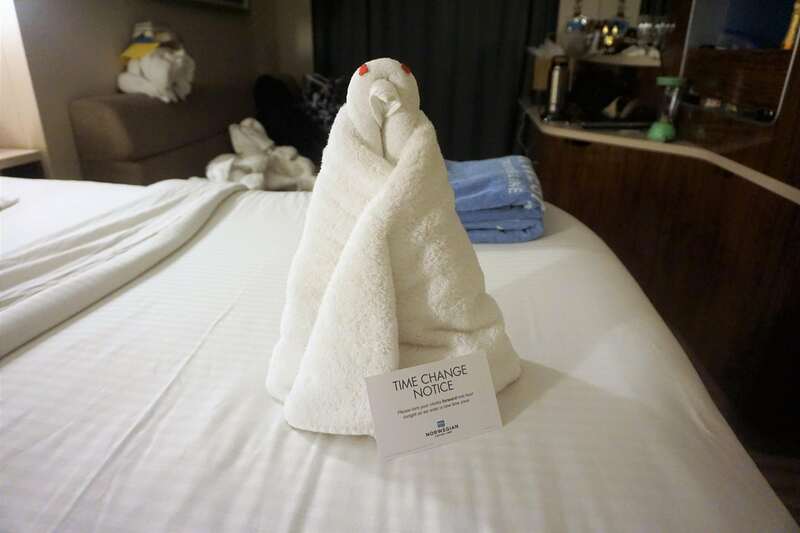 Back to our room, we came upon a little surprise. All three of our bags were already there in our room waiting for us. If only the attendant had taken the initiative to open the bags and begin putting things away for us! One can dream right? So, the task was now ours to unpack and prepare for an early dinner. With our first official event of the cruise scheduled for a 7pm cocktail hour, the Princess insisted we had to get something to eat before the social event. Thinking the quickest thing would be the complimentary Shanghai Noodle bar, we were able to unpack, change up, and get down to the restaurant around 5:40pm. 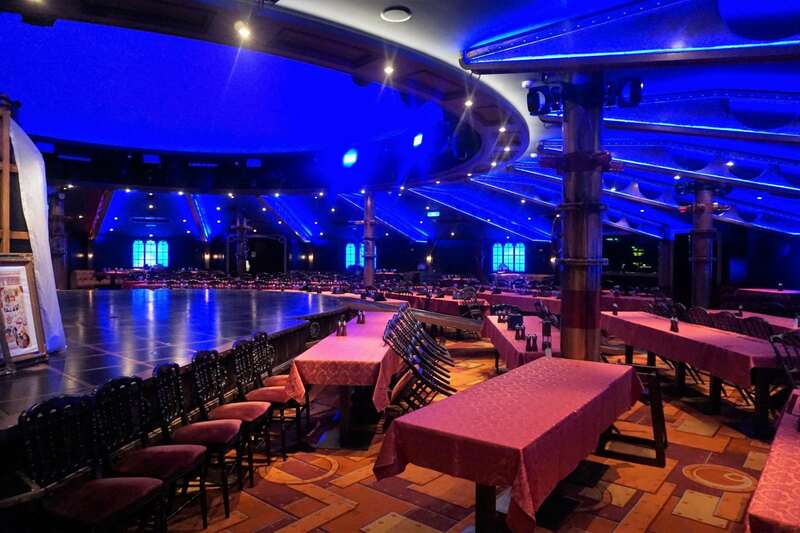 The venue was already rather filled; although, we were quickly seated at a long high-top table along with some fellow cruisers. 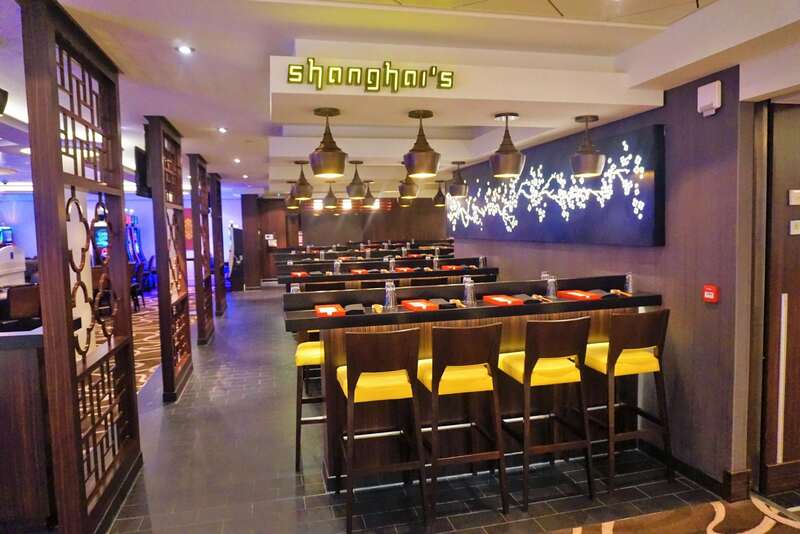 If you are a fan of Chinese, then this place is for you. The pot stickers, dumplings, fried rice, and lo mein that we sampled were all fresh and served hot. We finished dinner in about 45 minutes, which is a record for us. With some time to kill, we made a stop over at the gift shop. Yes, you know we had to get a ship ornament and t-shirt to commemorate the cruise. No longer do we wait until the end of the cruise to purchase these keepsakes as we have been out of luck on other ships with these items selling out during the cruise. Back to the room to drop off our purchases, we had just enough time. Good thing we did stop in, as we received a phone call that the meeting location for our event had been changed due to current weather conditions outside. 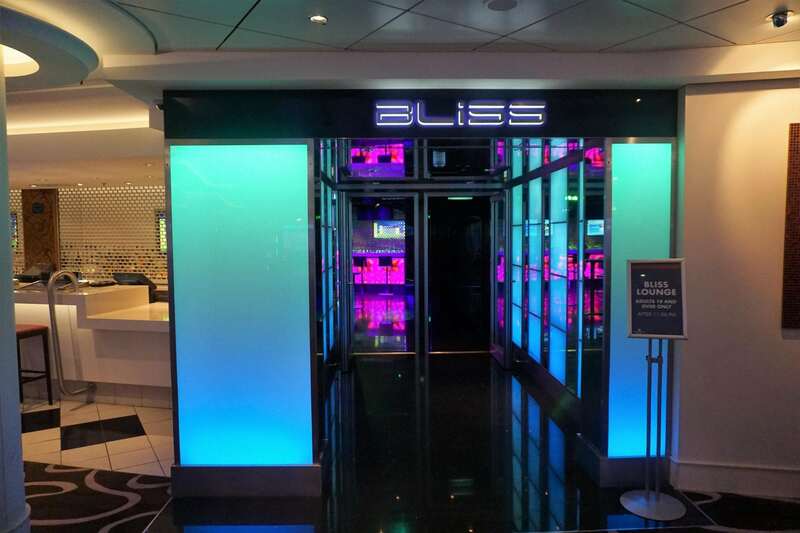 Down to the new location, Bliss Lounge on Deck 7, right on time, the cocktail hour was a chance for us to meet the other social influencers on the trip. The hour flew by, as we were all talking about our travels and background. We were “kicked out” promptly at 8pm for the next scheduled activity in the venue. With no formal entertainment reservations for the day, our plan was to go to the Welcome Aboard show at 9:30pm. 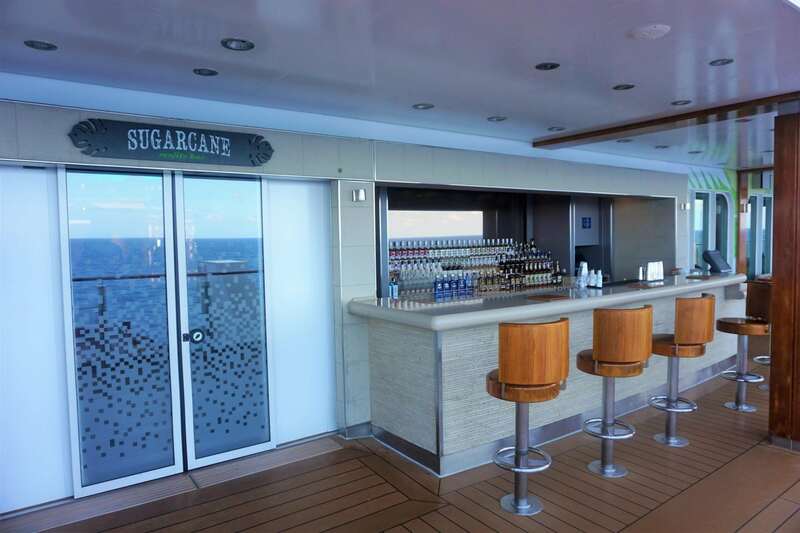 What better way to kick off the evening than with a mojito at the Sugacane Moijto bar? I went with the Barcardi Mojito, and the wife did the Raspberry-Guava Mojito. With drinks in hand, we reflected on our first day as the piano music of Aliah Sheffield played an eclectic mix of pop hits in the background. Walking over a little after 9pm for the show, we had our pick of seats. 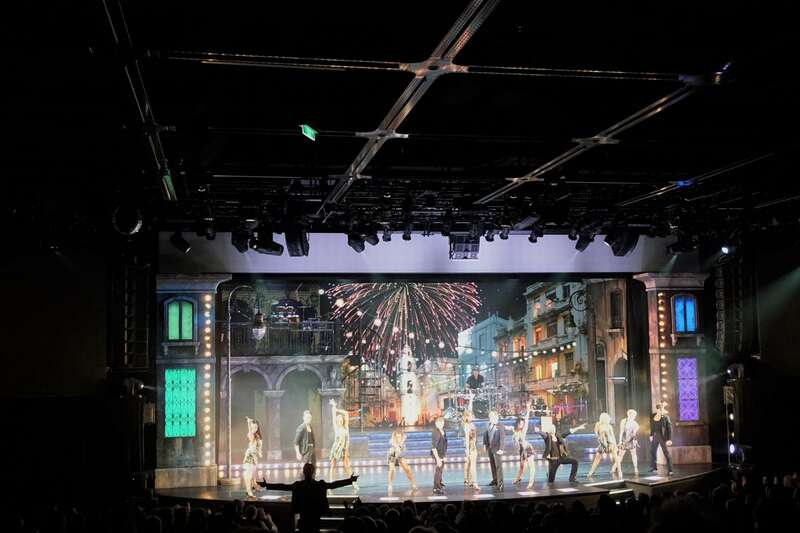 The show included a few short performances by the cast of the two main theater shows, along with a short set by one of the comedians. Leave it to NCL to also include a bunch of advertisements, from the Illusionarium, to shopping seminars, to jewelry sales, in the 45 minute show. Stopping by Howl at the Moon, it was standing room only, so we decided to retreat back to our room for the evening around 11pm. 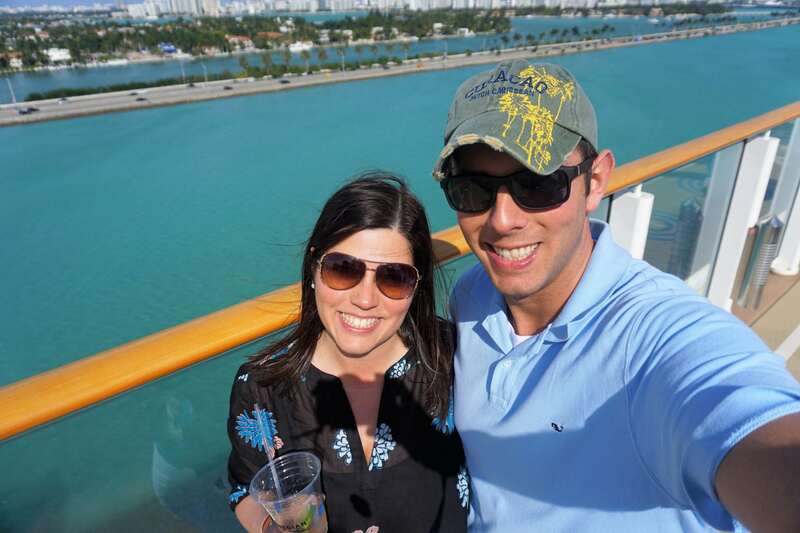 With a quick check of social media and the web, we were ready to call it quits for the first day of the cruise. The weather in Miami the day before was a bit windy, and while it seemed to calm down a bit in the evening, the ship felt like it was swaying more than we are used to this morning. 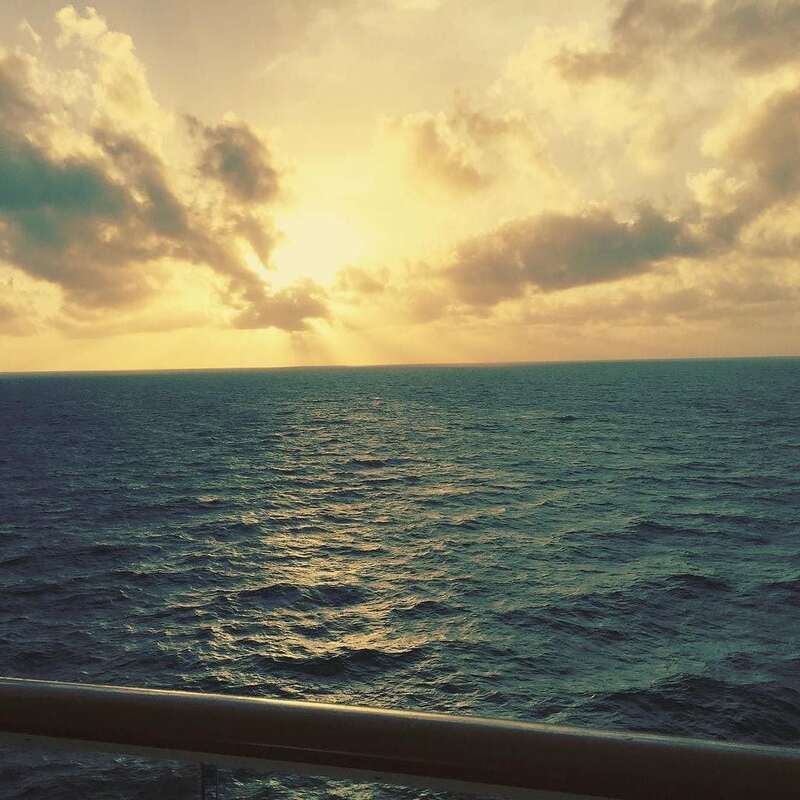 As the day progressed, it became evident that it didn’t matter where you were on the ship, the seas were rough. Our first event of the day was a morning trivia session with our fellow writers at 9am. Up around 630am, I headed out on my picture and coffee run, getting some great shots of the indoor venues along the Waterfront and remaining restaurants, as well as our two iced lattes from Café Atrium. Unfortunately, these are not part of the Ultimate Beverage Package. Back to the room, I showered up and got ready for the day. The wife then suggested we do a quick breakfast at O’Sheehan’s. We would only have about 45 minutes to eat before our morning activity. Arriving at the restaurant, we were quickly seated, and our waiter approached the table within a few minutes. We had our omelet order with very little wait. Breakfast was fast, hot, and well-prepared. Following breakfast, we headed up to Moderno, where trivia was being held. 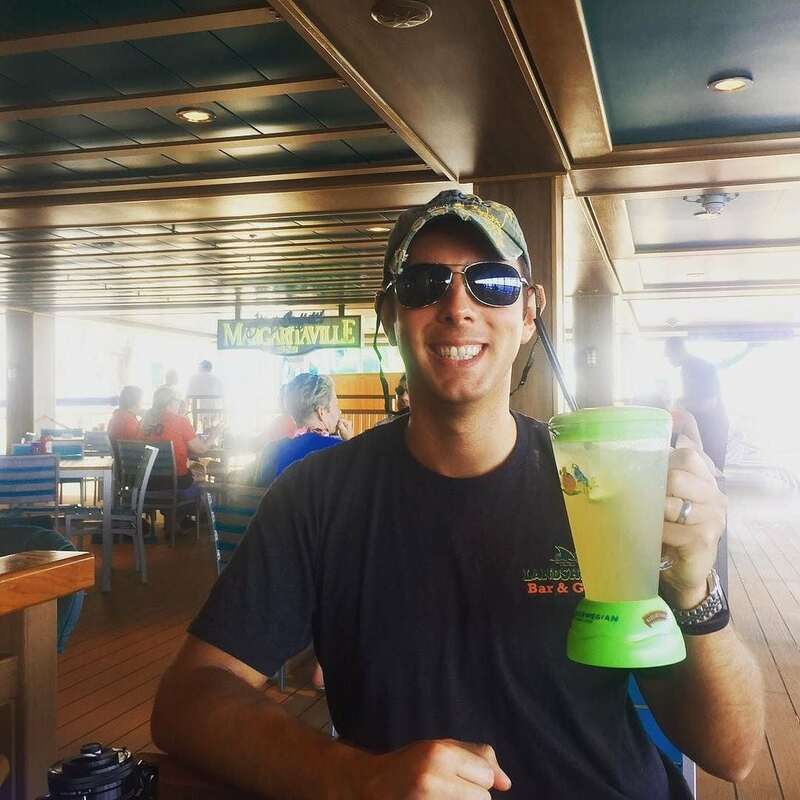 With more coffee, a few mimosas, a bunch of laughs, and some interesting facts about Jimmy Buffett and Margaritaville brands, the next 75 minutes of the morning “sailed away”. While technically the Princess was on the winning team, we were all provided some great gear, including hats, t-shirts, and stylish sunglasses. Finishing after 10:15am, we could see the sun trying to break through the clouds. Thinking there was no way we were going to get seats outside, we headed to Spice H20 to find out. Appearing rather crowded, the Princess spotted two vacant seats near the bar. Snagging the chairs as quickly as possible, we were not surprised to run into the couple we chatted with in the terminal on embarkation day. There are always those people you run into over and over again throughout the cruise. Staking our claim with towels and towel clips, it was a quick dash down to our room to change into tanning attire. Luckily, for the next two hours, the weather agreed with us, providing smooth sailing and sun. Around noon time, I convinced the Princess to get some frozen drinks from the Spice H20 Bar. We had to knock those 19 bars off our drink around the ship somehow. Around 1pm, we decided to abandon our chairs and head inside for some A/C. During our travels, we surveyed the casino for the wife’s favorite slot machine. A quick $20 in a machine, and it was gone before I could even sit down. Considering we hadn’t eaten in close to 5 hours (which is a long time in cruise hours), we opted for a few snacks. 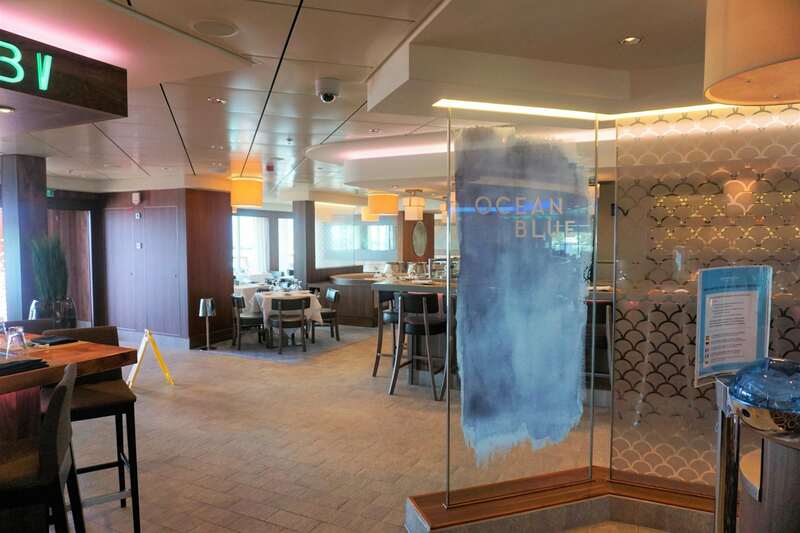 Open only on sea days, Ocean Blue has a seafood takeout counter on the Waterfront. 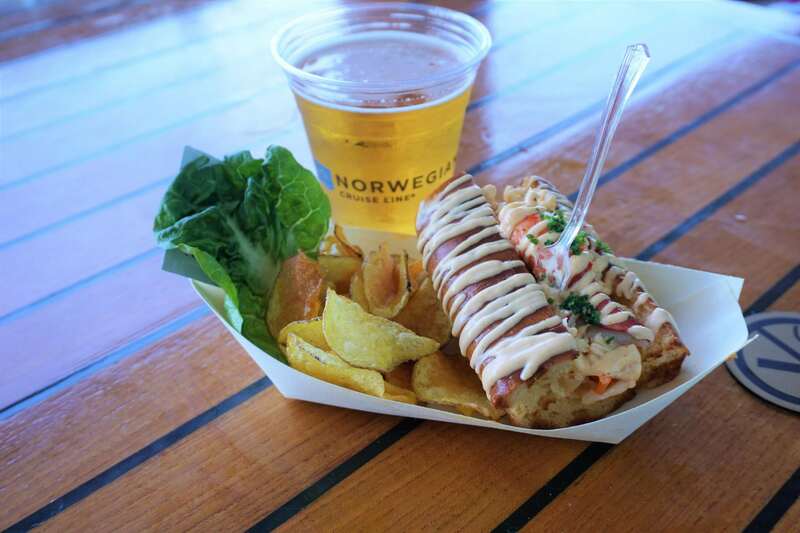 Having read the reviews, I knew I had to try the lobster roll, which is an up-charge of $9.75 (+18% gratuity). 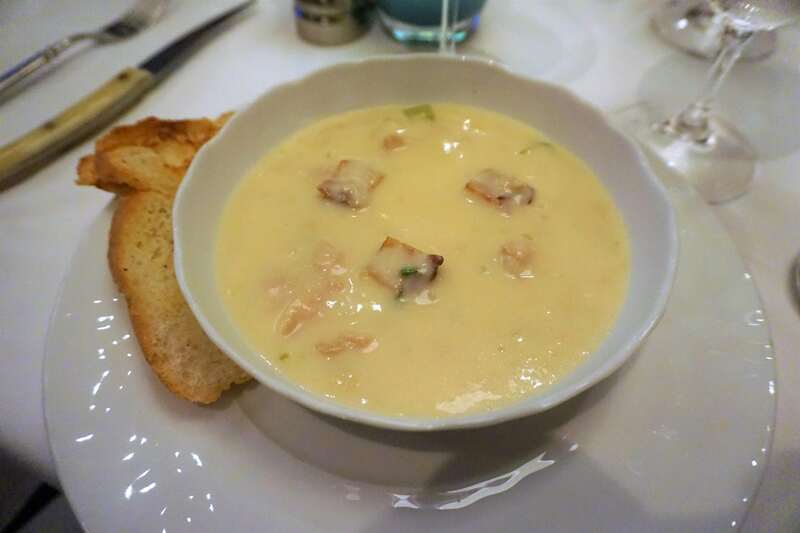 It was succulent and rich with a light butter sauce and big chunks of fresh lobster. If you are a seafood fan, it is worth the cost. 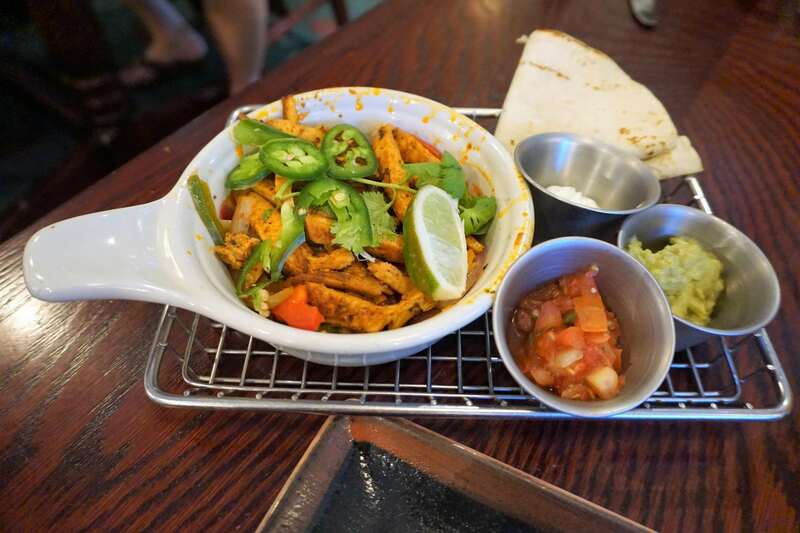 Not a seafood fan, the Princess wanted to stroll over to O’Sheehan’s for some chicken fajitas. I may have had a few chicken wings, to test them out, since I couldn’t just sit there staring at her eat. 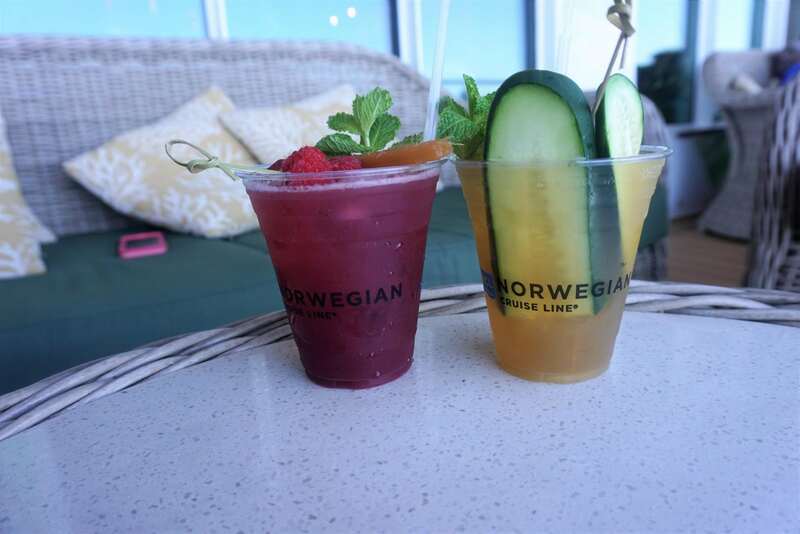 Not to mention, we both got cocktails to add to our list of drink around the ship. Following lunch, we grabbed one of the signature cocktails at the Sunset Bar before heading back to our room. I went with a French Martini, and the Mrs. went with the Gateway. I took a break from blogging around 4pm to go for a walk around the Waterfront, while the Princess began to shower and get ready for the evening. During the trek, I also stopped to get us an iced caramel latte for a little afternoon pick me up. Our dinner reservations tonight were for 5:30pm, the earliest you could make them. It was going to be tight as we needed to be at Margaritaville for 7:00pm to participate in FoodieChats, a sponsored twitter chat on the sailing. But, you can’t wrestle the Princess away from picture studios. So even though we were down to La Cucina right at 5:30pm, we made two pit stops at portrait stations before going to dinner. After all, it was Norwegian’s Dress Up or Not Night. Arriving at 5:45pm, the Italian restaurant was just starting to fill in. 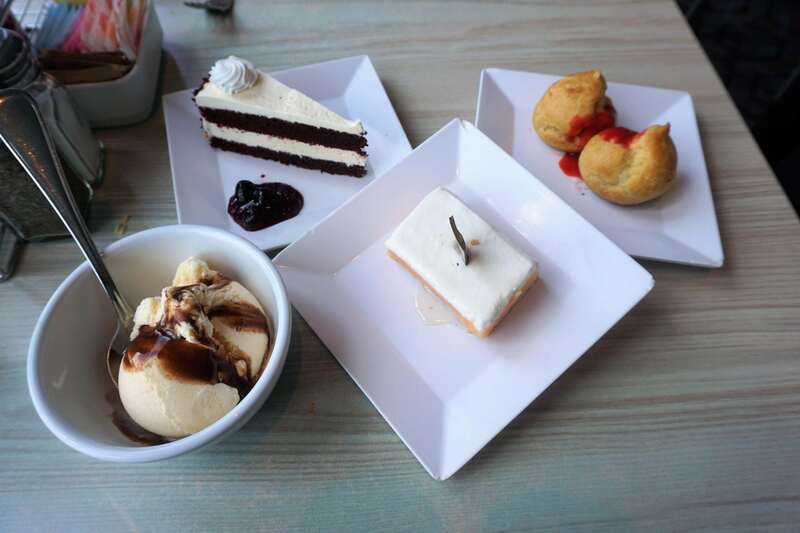 We did mange to get through a round of appetizers, entrees, and dessert in just under 75 minutes. 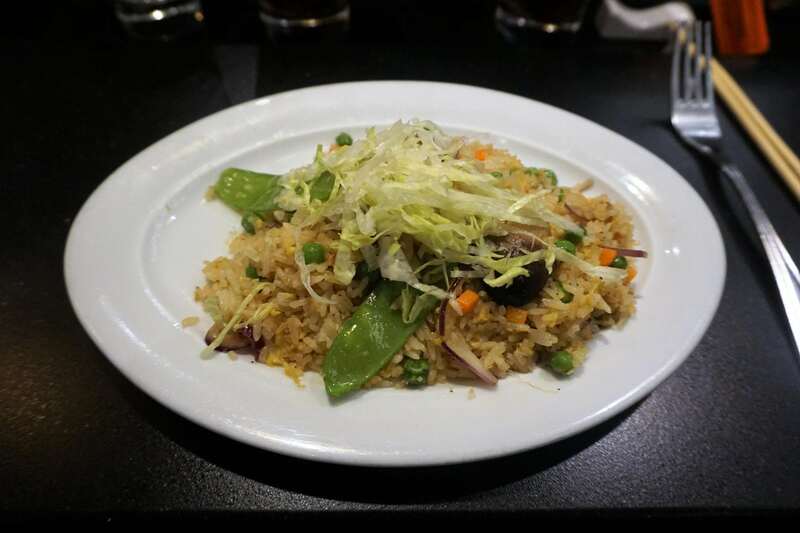 The service was cordial and timely, and the food was prepared to our liking. 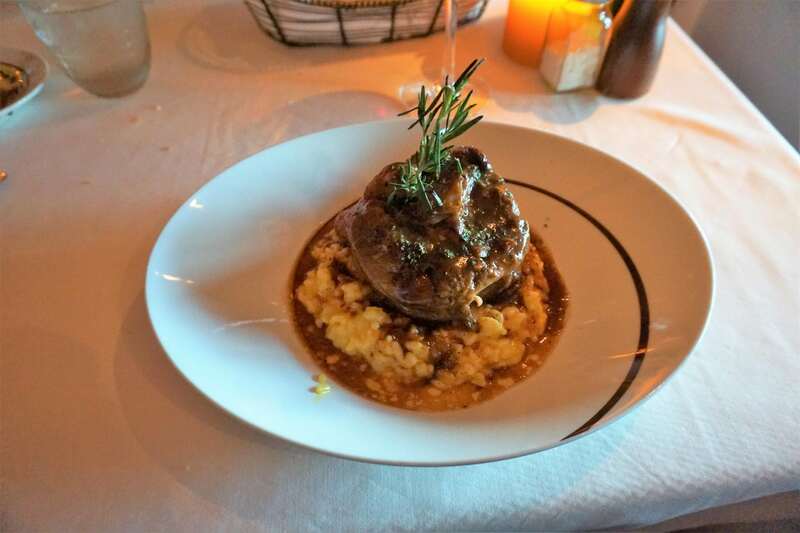 My Osso Bucco was tender and tasty, while the Princess’ pasta dish was just the right portion for an entrée. We ended up getting to the chat a few minutes late as I had to run back upstairs to get my laptop. Call me old, but I just can’t work on my phone. Our first #Foodiechats was a lot of fun, as everyone was engaging and tweeting about all their great food experiences. 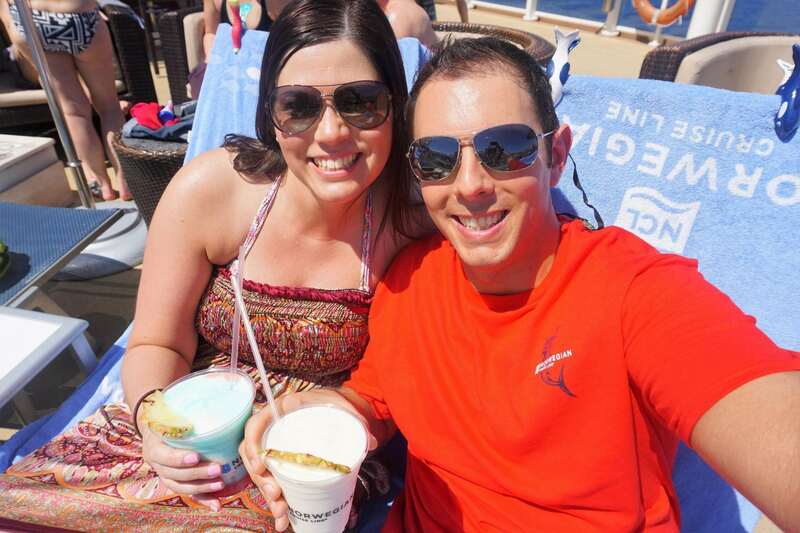 It didn’t hurt that NCL and Margaritaville were feeding us margaritas and plenty of snacks. Ending right at 9pm, we had to say some quick goodbyes. We had reservations for Burn the Floor at 10pm and knew the doors would be opening soon. As luck would have it, we got to the theater just in time to see the main doors being opened. Scanning our room key cards, we got into the theater and were able to secure the same seats we had the night before for the Welcome Aboard show. These aisle seats were the perfect vantage point to snap a few pictures and enjoy the show. While the Princess was not feeling any more drinks tonight, I flagged down a waiter to get a long island iced tea. The plan was to head straight from the show to the comedy club, so I was going to need something to hold me over. Burn the Floor was one of the better production shows we have seen on a Norwegian Cruise Line ship. A complete 60 minute Latin dance revue show, it was highly energetic, and the two vocal performers were excellent. 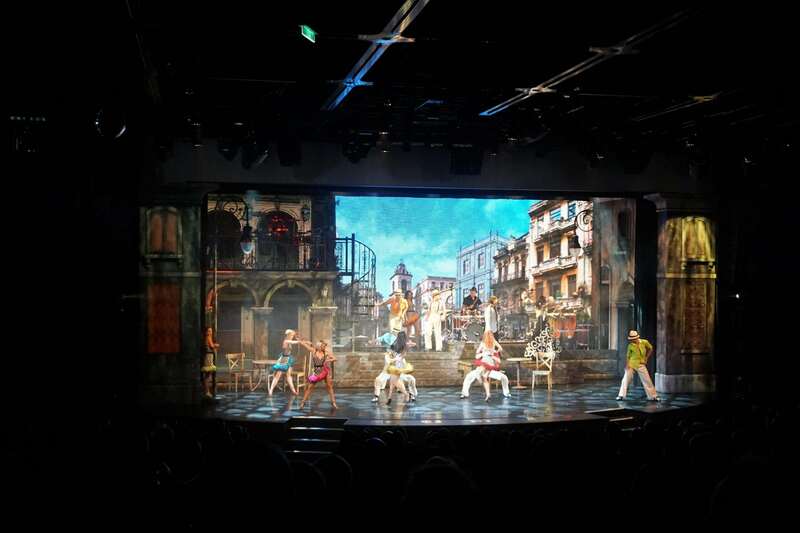 We recommend making a reservation to see this show during your cruise. 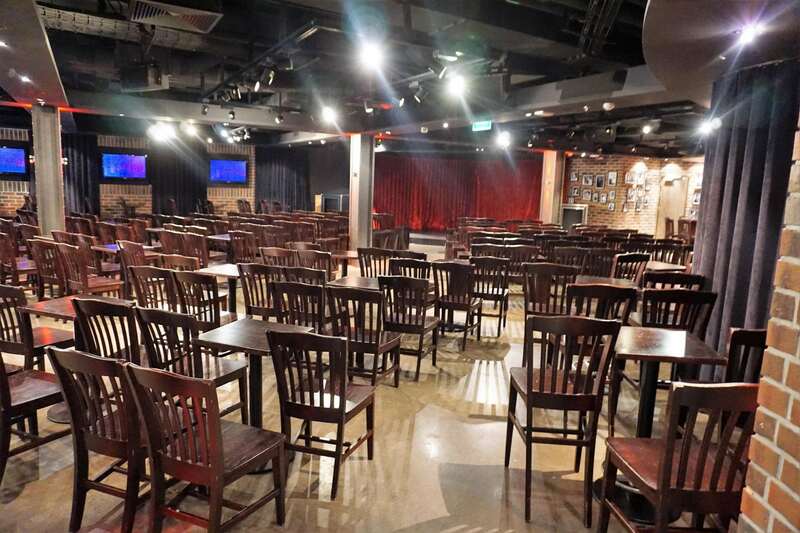 As the show wrapped up, we made a mad dash for the comedy club. We arrived to find that the 11pm show had already started, and the venue was standing room only. Strike number two for Headliners. 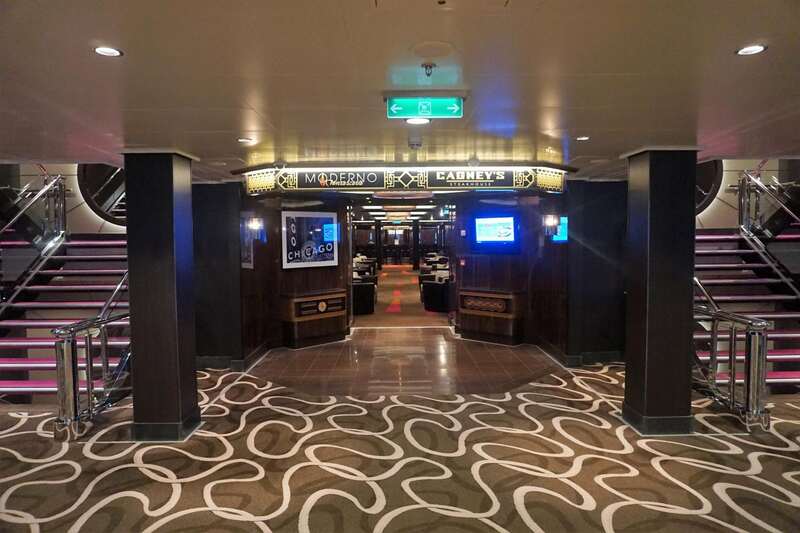 Luckily, we had made two reservations for each comedian, so we would still be able to catch one of his shows later in the cruise. So, it was back to the room for more social media and blogging until about midnight. 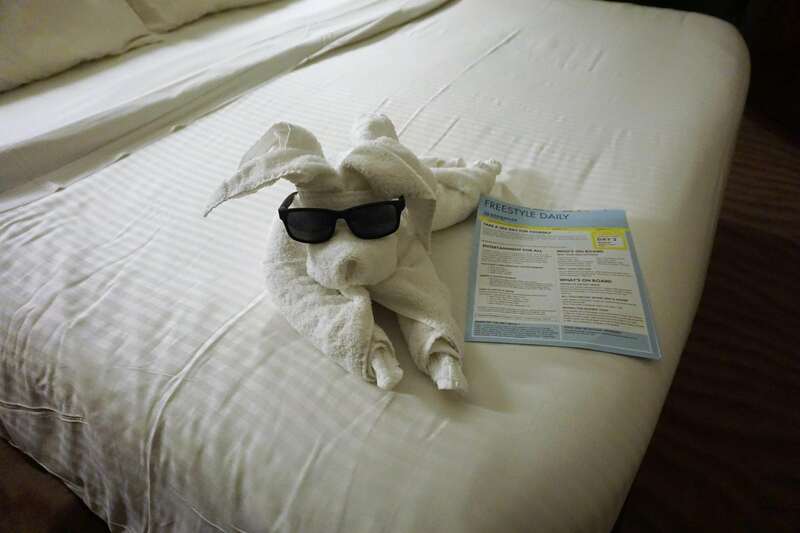 Arriving back at our room, another towel animal friend was waiting for us, along with a notice to move our clocks back an hour. While we could use the extra shut eye, this also meant that the last night of the cruise we would be losing two hours of sleep due to daylight savings. But, we could worry about that later in the week! Unsure if our cell phones would update with the time change while in airplane mode, the Princess played it safe to schedule an alarm for 6am. We had a shore excursion reserved through NCL that departed at 11:30am. But, the strategy was to get off the ship as soon as we docked for some pictures and to get a feeling for the port. The Princess needed to ensure she had some kind of breakfast, as she could not go all day without eating. So, we took advantage of the complimentary continental breakfast. The night before, we checked off our selections, which included a variety of pastries and fruit, to be delivered to our stateroom. Norwegian does offer other breakfast options but for a $7.95 service charge. Since the time on our phone had not changed, we were now a full hour ahead of schedule. So, we took the opportunity to take some additional photos, grab coffee, and do a bit of blogging before our breakfast arrived. Showered and ready for the day, our breakfast arrived a few minutes early. An unhealthy mixture of danishes, croissants, and muffins, it was enough sugar to keep us fueled for the day. 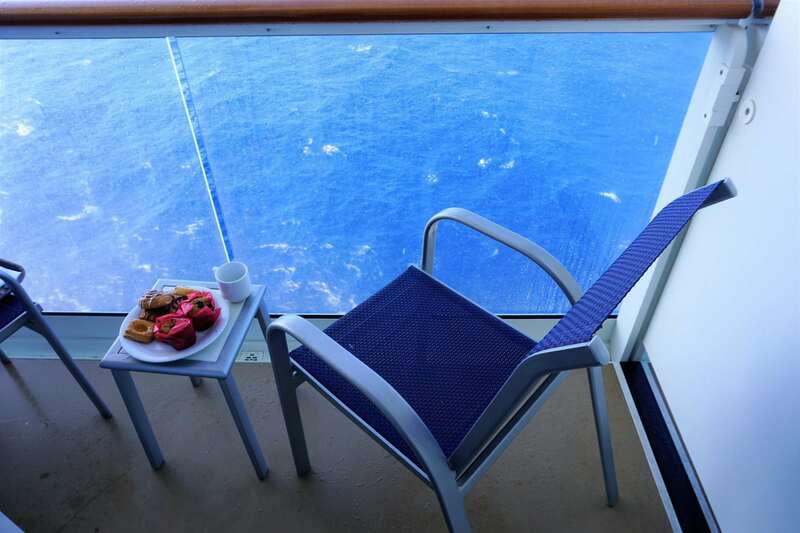 It was the perfect morning to enjoy breakfast on the balcony. 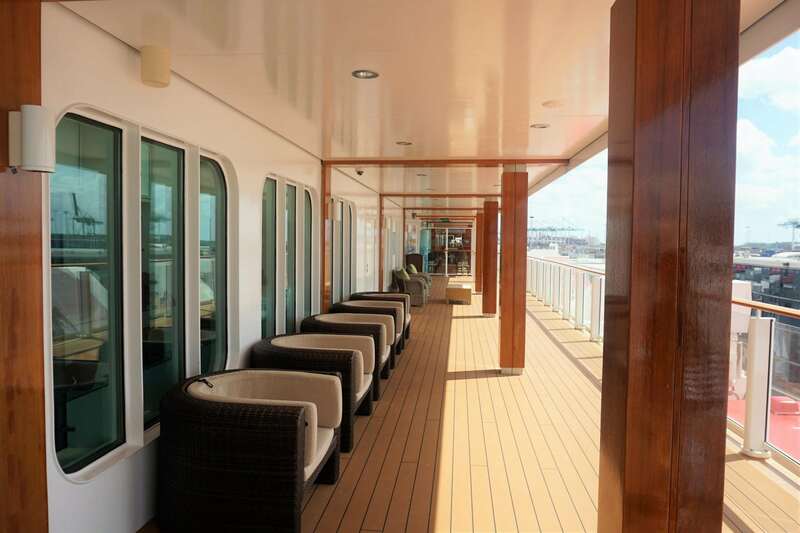 As we began to pull into port around 9:30am, we took advantage of our balcony to get some pictures of this new port. Prepped and ready to go, the ship was cleared by 10:15am, and it was time to maneuver through the crowds. Listening to the announcements, it appeared the aft gangway was being under utilized. We made a b-line for the back of the ship, and we were able to get off the vessel in less than 15 minutes. We soon realized that the port was pretty small. The 45 minutes or so we had to take pictures and explore was really all we needed. Scoping out the shops and vendors, we would get our port souvenir and my t-shirt upon our return. We were able to make a complete loop around the area, even though it was quite busy. Our shore excursion tickets had us meeting at Zone 4 10 minutes prior to our departure time of 11:30am. We were back right on time to find a rather large line. Checking in and getting our wristbands, the Princess was able to utilize the NCL internet at the pier to load some social media posts while waiting to depart. Within a few minutes, the tour operators led the large group to the buses in the parking lot. Prior to the cruise, we booked an excursion to the Gumbalimba Park. It was the Princess’ choice, and I was not prepared to debate what to do at this new port of call. The tour lasted about 4 hours, including the 30 minute ride to and from the port. 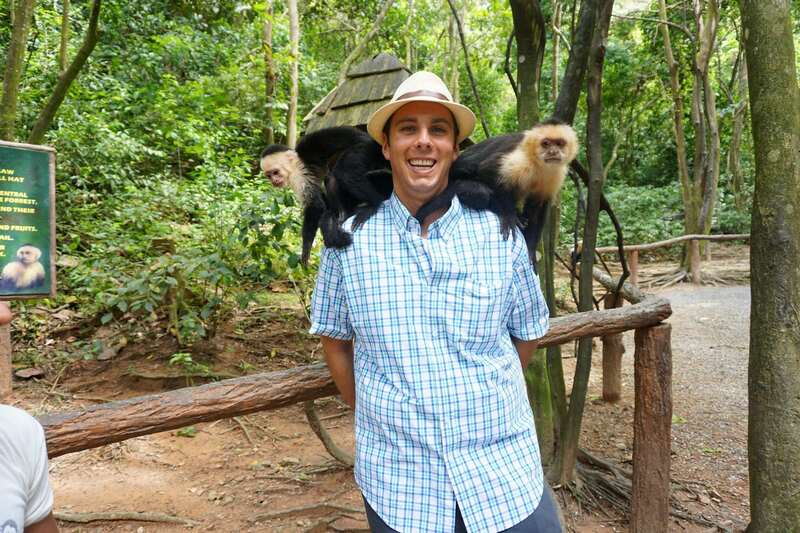 The excursion gets you up close and personal with some monkeys and macaws. These are definitely some crazy photo-ops! Stay tuned for our full excursion review coming soon. We arrived back at the pier around 3pm, making two quick stops for an ornament and t-shirt, and we were back onboard the ship within 30 minutes. Going all day, we needed a snack, so we decided to do O’Sheehan’s for a small bite. Continuing my health kick, I got an order of chicken wings and french fries, and the Princess did a chicken sandwich. Reviewing the freestyle daily, we noticed an advertisement for the Escape the Big Top experience. 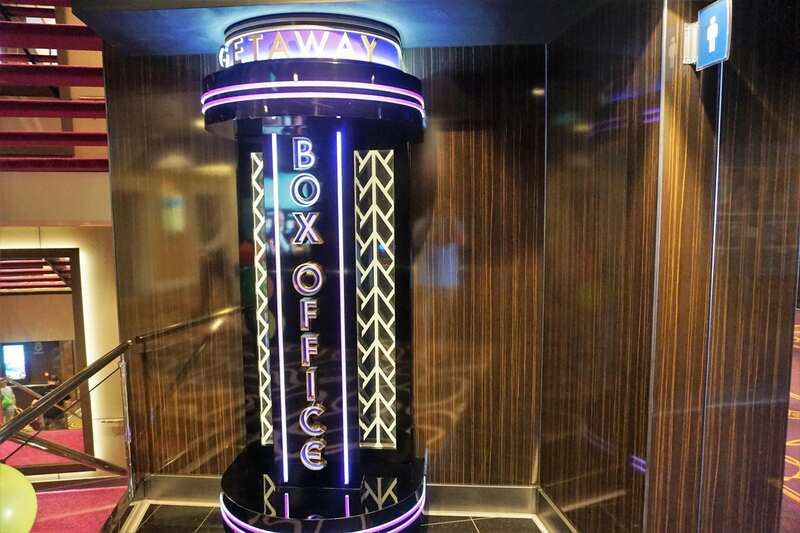 Not knowing anything about this new addition, we went to the Box Office after lunch for more information and to see if we could reserve a spot. With only a few remaining open slots, we booked this “escape room” for the final sea day at 2:30pm. 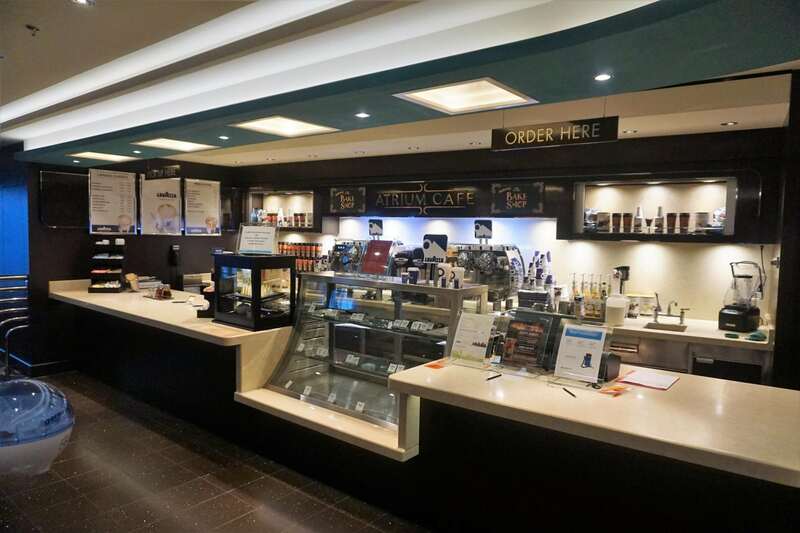 We then stopped by the Atrium Café to get some iced lattes, as we had a full night ahead of us. All aboard wasn’t until 5:30pm, and we did not have dinner reservations until 8:30pm. 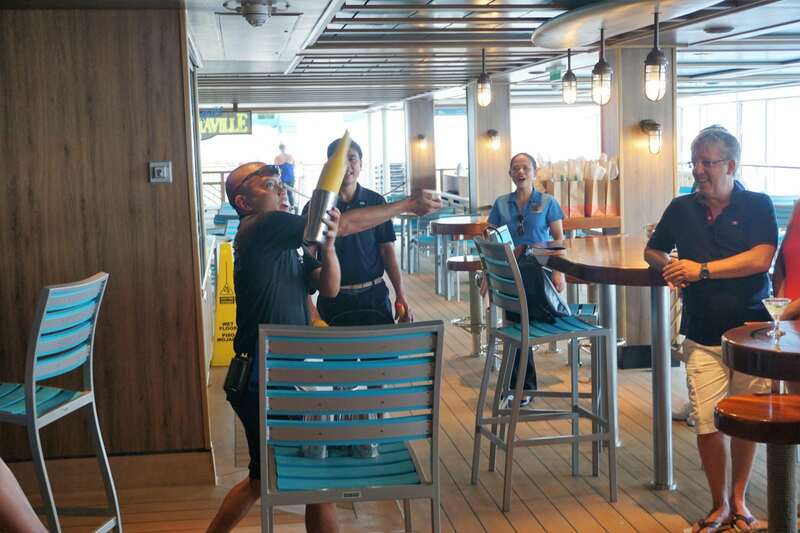 With some time to kill, and a rather quiet ship, we took the opportunity to play a round of mini golf. 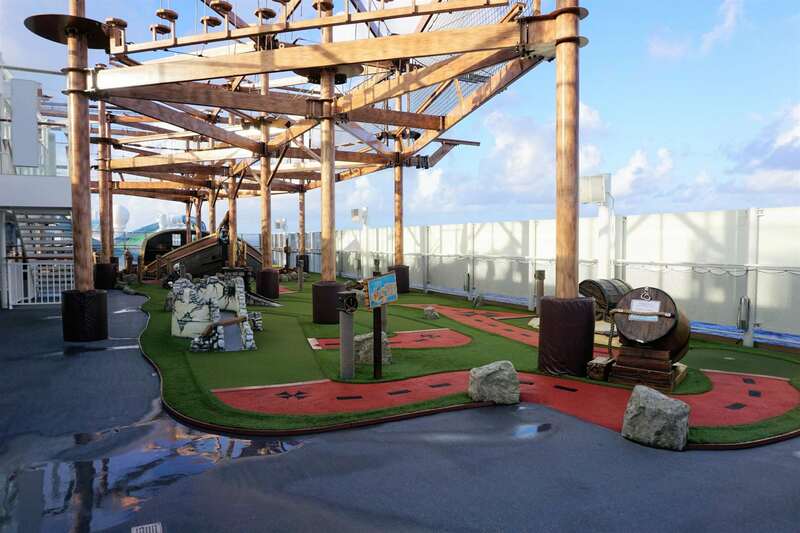 A pirate themed course with some impressive challenges, though the greens themselves were lumpy and uneven. All these excuses still cannot make up for the fact that I lost by one stroke. A rematch was planned, but we never did get back to it. Grabbing a drink to drown my defeat, it was up to our balcony room to get some work done. After about an hour or so, it was time to get ready. Ready before 8pm, we had time for a pre-dinner drink. Continuing our drink around the ship, we decided to stop in at Prime Meridian. Located right next to Cagney’s, where we would be dining this evening, we expected the bar to be busy. Surprisingly, the bar nor restaurants were overly crowded. Tonight, the Princess did her Rebellious Fish, and I went with a Signature Mai Tai. Slowly, other members of our party started to arrive, and we were escorted to our two tables in the back of the restaurant. A solid two hours later, we indulged in plenty of apps, entrees, dessert, and a ton of laughs. 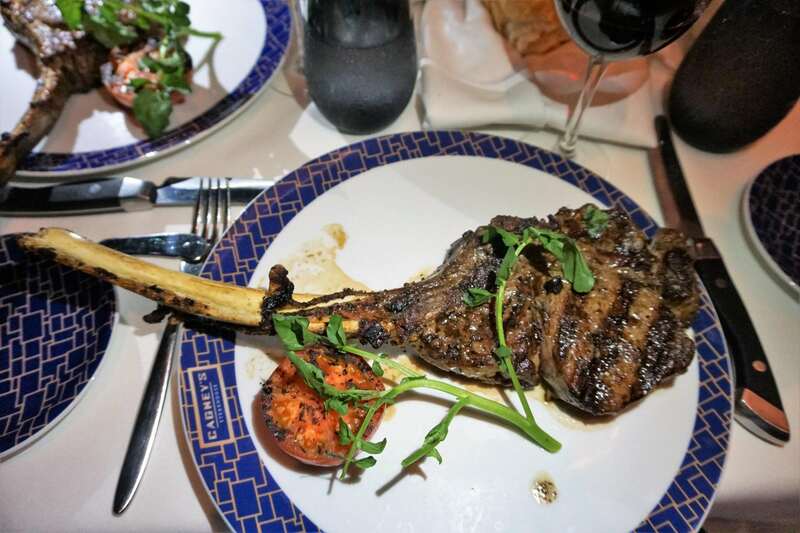 I couldn’t resist ordering one of the largest menu items, the Tomahawk Steak. I think the picture below does this succulent steak justice. We will have our restaurant review coming soon. This time around, we were out in time to line up for our 11pm adult comedy show at Headliners. Finally, we got seats at this venue! Tonight’s comedian was Dan Gabriel, the same act that performed for a few minutes as part of the Welcome Aboard show. All shows after 11pm on NCL are considered “adult” shows, but his material was not really dirty or inappropriate. It was a solid performance, though we ended up thinking the other comedian was funnier. Wrapping up around midnight, we could have headed to the deck party at Spice H20, but we opted to get some rest instead. Tomorrow was going to be a big day in Harvest Caye, Belize. With a jam-packed itinerary, we were excited to explore every inch of the island! We had a busy itinerary set for today in the private island of Harvest Caye, Belize. 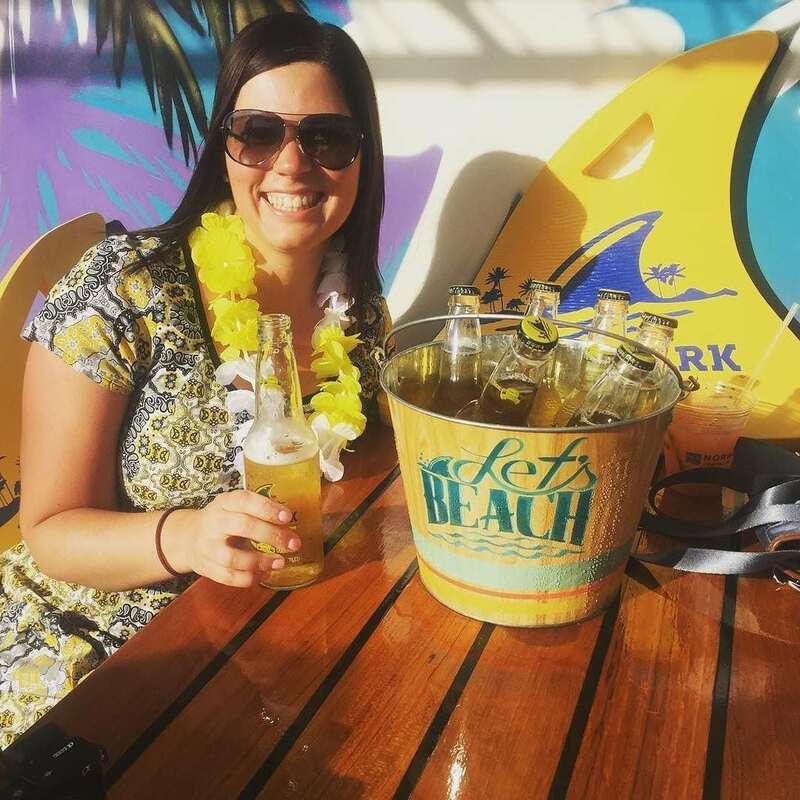 We were invited on this trip as a joint partnership between Norwegian Cruise Line and Margaritaville, which has the newest Landshark Bar and Grill on the island. This meant our itinerary was packed with events, tours, and lunch. It was going to be a long but exciting day. Up at 6:30am, I ran to get us some iced lattes from the Atrium Café right after it opened. Back with drinks, I grabbed our camera and headed up to the open air decks to get some photos. 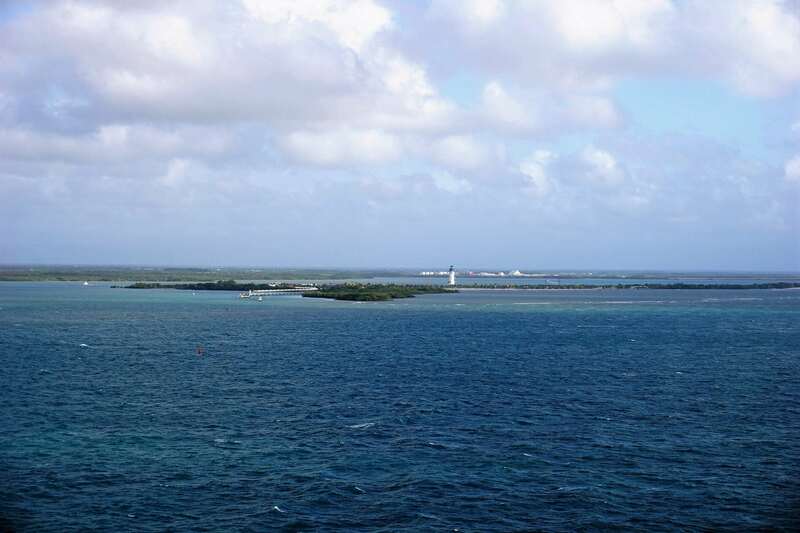 I could see Harvest Caye off the portside of the ship. We appeared to be floating near the island. The seas were slightly rough, with a little wind, but nothing that warranted concern, in my opinion. Maneuvering through the buffet that was busier than expected, I made a plate of breakfast pastries and returned to the room with the food and news of our impending arrival. I showered and was prepared right around 8am, when we were supposed to dock. 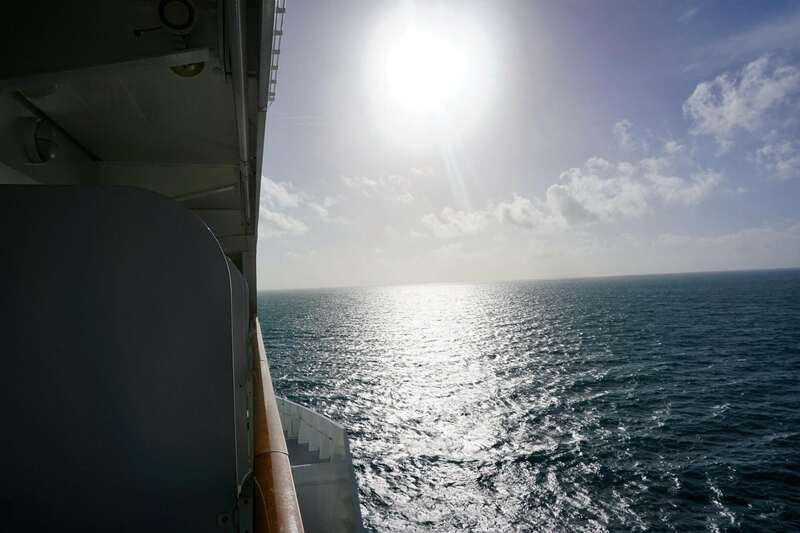 Looking at our starboard side balcony, it felt like we had not moved in a while. Not trying to read too much into this situation, we were anxious for our arrival. It hit home at 8:30am when the captain came on the public address to report that the weather conditions were too windy and choppy for the ship to safely dock. Instead, there would be another day at sea. Are you kidding me? This was our first thought. Unsure of what to do, we headed downstairs to our prearranged meeting time and place at 9am. Meeting with some of the other travelers, there was no word about alternative plans. With the sponsors a no-show at 9am, the group disbanded, and we took to the pool deck. Getting chairs on Deck 17 forward, we got some sun for the rest of the morning. Despite being a bit windy, it was sunny and warm. With a wide open day, I decided to head over to the waterslides right when they opened at 10am. I was able to ride all 4 of them in about 40 minutes. 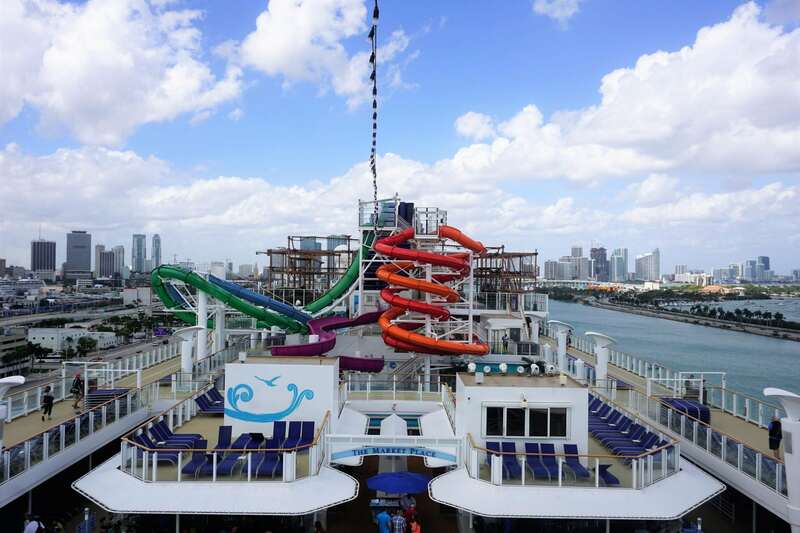 Later in the cruise, I would return to grab a video of the Whip slides. After a full morning in the sun, we returned to our cabin to swap out our clothes for the ropes course. The course opened at noon, and we were there shortly after. A small line had formed already, but we were able to suit up rather quickly. 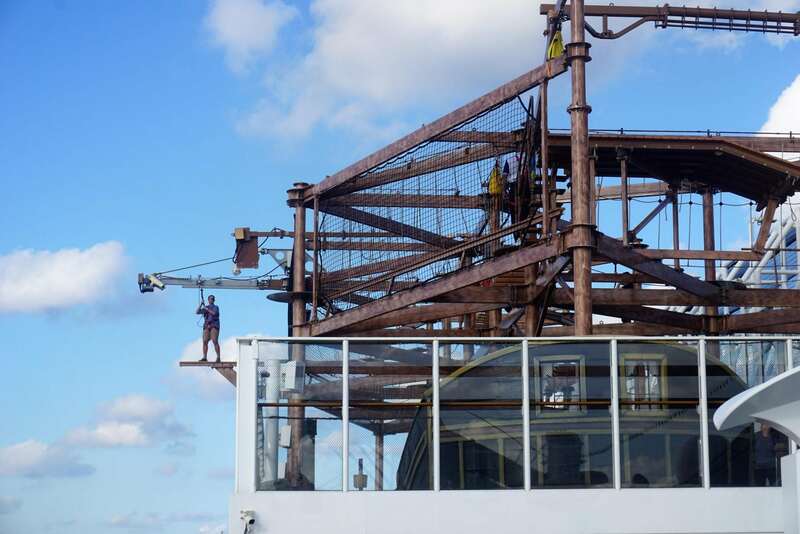 Given the windy conditions, the Plank had just closed. At least, we were still able to test out all the other obstacles and zip line. 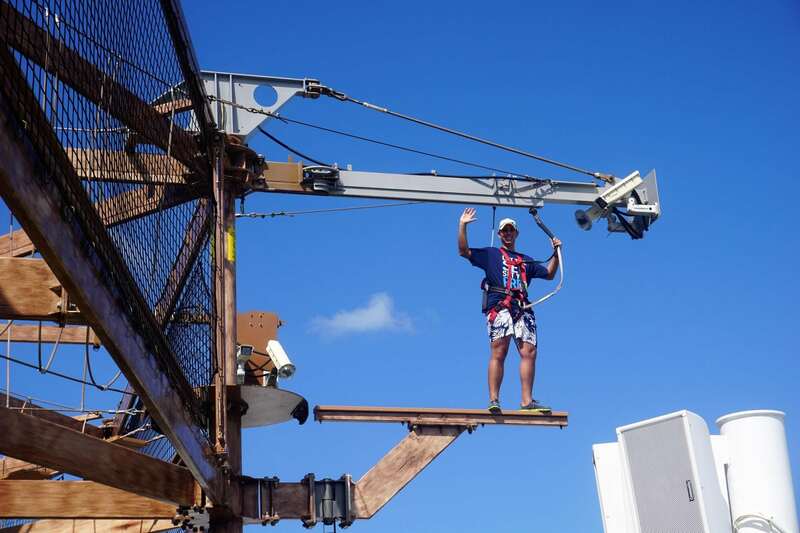 Given the smaller width of the ship, the ropes course was a bit easier to navigate than the one on NCL Escape. Spending about thirty minutes on the course, we returned briefly to the room so the Princess could change up her footwear. Down to the Waterfront, we took a couple pictures that were part of our social media bucket list challenge that brought us onboard. We then decided if we couldn’t visit Landshark on the island, we should at least pay another visit to the Margaritaville on the ship. Each getting our own meal this time, and checking off another bucket list challenge- the blender cup margarita, we ate up another hour or so of the afternoon. Our server was extra friendly, and she even called me out on my rather slow consumption of the cocktail! 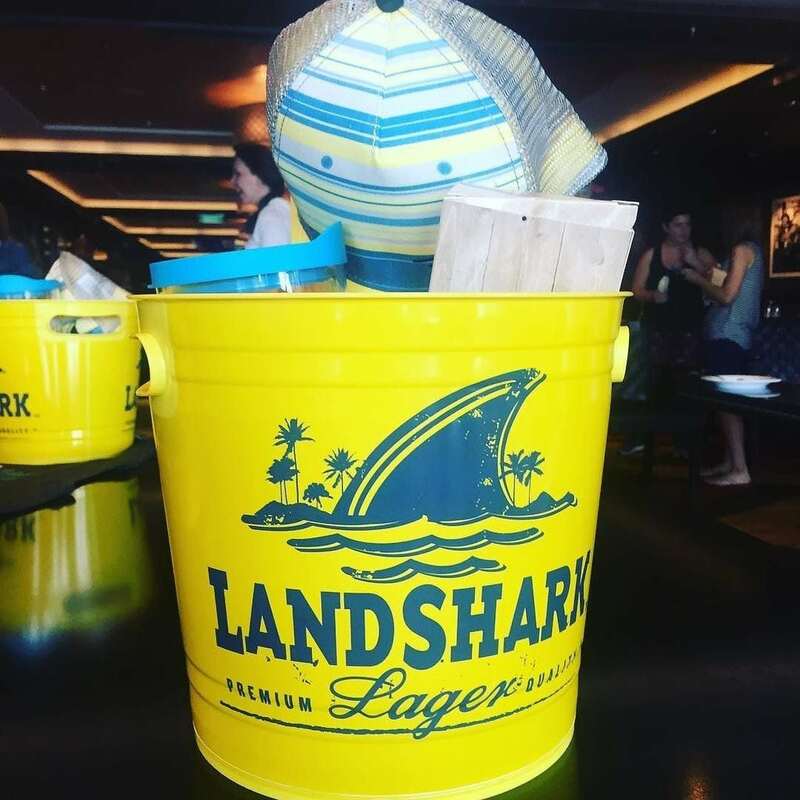 During the day, we were notified that there was going to be a Landshark Happy Hour event at Spice H20, including a virtual Jimmy Buffett concert. Our original plans had us at the island all day, so we had made an early dinner reservation at the Illusionarium for 5:30pm. So, we would not be able to stay very long at this late afternoon party. Finishing up lunch, we went back to the room to switch into our dinner clothes. One day, I will be able to cruise without so many costume changes. Dressed up for dinner, we looked just a bit out of place at this already rocking deck party. 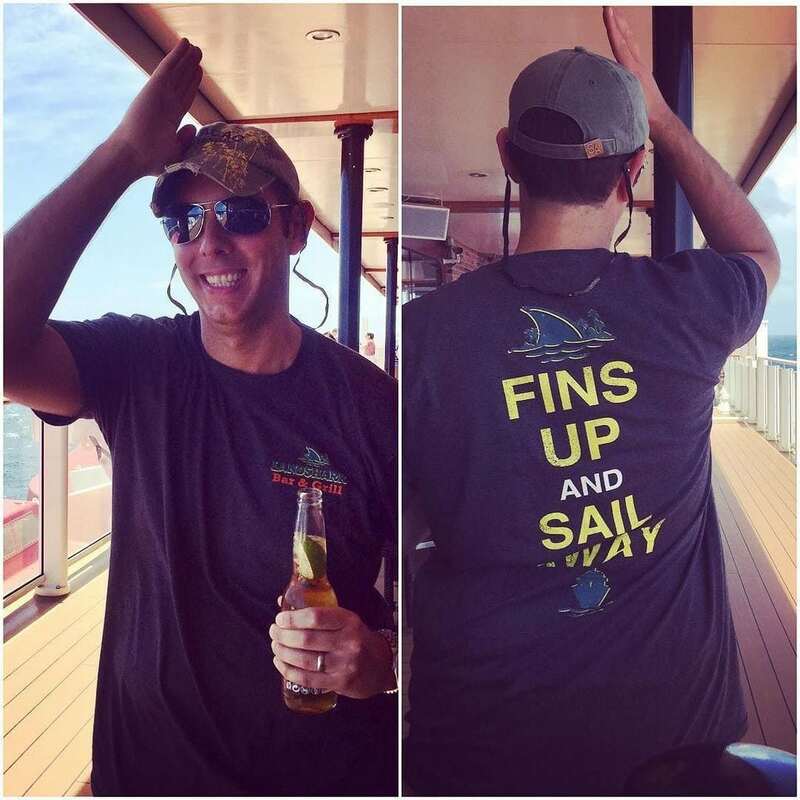 Plenty of Landshark beers were flowing, and the parrot heads onboard were singing along to the Jimmy Buffett tunes. Having a drink and mingling with our new found friends, the hour flew by. Not wanting to get awful seats at the show, and needing to escape the hot afternoon sun, we headed out to the Illusionarium at 5:00pm. We booked non-floor seats, as we had heard that the floor was not worth the extra charge. Checking in with the reservation desk, we were escorted to a booth in the back, that was occupied by 4 college students on spring break. As luck would have it, three of them were from Massachusetts, and one even went to the college that I teach at back home. Such a small world. 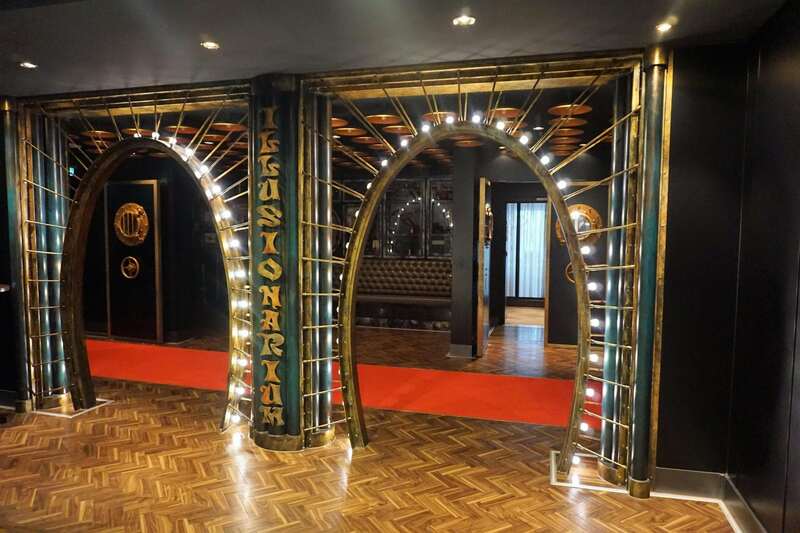 The Illusionarium dinner show lasts about 90 minutes, serving a fixed menu including a mozzarella and tomato appetizer, surf and turf, and a dessert trio. The magicians and mentalists were very entertaining, especially the mind reader. The food on the other hand is not the greatest. We would recommend the show for the entertainment, but don’t expect much from dinner. Knowing that the food was not going to be the highlight of the evening, we had made dinner reservations at the main dining room following the show. While I did attempt a few bites of the meal during the Illusionarium, I knew the Princess would be starving. With the show ending around 7pm, we made a pit stop in our room to drop off our goodie bag of Landshark items and were on to the Tropicana room for our 7:30pm reservation. We went right to the reservation desk and were quickly checked in and seated. Our server was prompt with water and bread, and came by soon after to take our drink and meal order. We ordered items from all three courses, and the food was pretty standard. I ordered the beef teriyaki entree, and the Princess did the Chicken Parm. We did have two officers come by to ask us about our dining experience, which I thought was a nice touch. Dinner took about 75 minutes, so we were out in time to watch the end of the Deal or No Deal live game show in the Atrium. Needing to check the Atrium Bar off our drink list, we waited for the show to end at 9pm then grabbed seats to listen to the Latin Band. Ordering the Moscow Mule and the Mr. Worldwide off the standard bar menu, neither of us were impressed with our drinks. After about 30 minutes, we headed up a flight of stairs to the main theater for this evening’s comedy show. 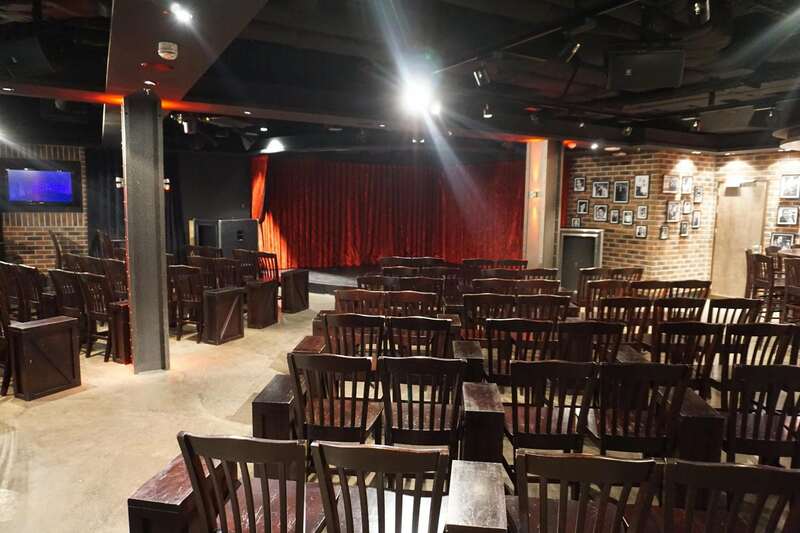 Featuring both comedians, the 45 minute show had all new material, different from the acts in the Headliners comedy club. 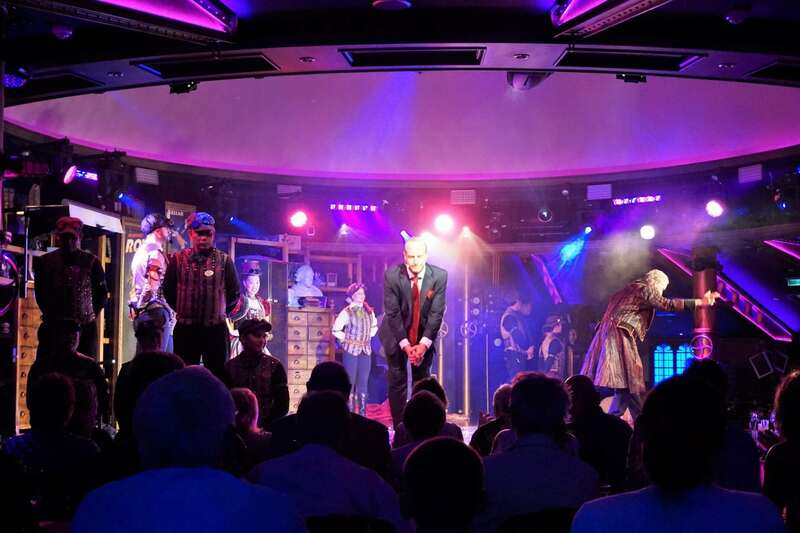 Having already seen one of the comedians, we both instantly recognized the second headliner, Frank, who was the host of the comedy shows on Norwegian Escape. Like many of our fellow cruisers, we made a b-line for Spice H20 following the comedy show for that evening’s deck party, the 80’s Dance Party. Arriving just in time to see some of the “famous acts” that were also onboard, we rocked out to some classic 80’s hits from Bryan Adams, Michael Jackson, Bon Jovi, and Guns N’ Roses, among others. 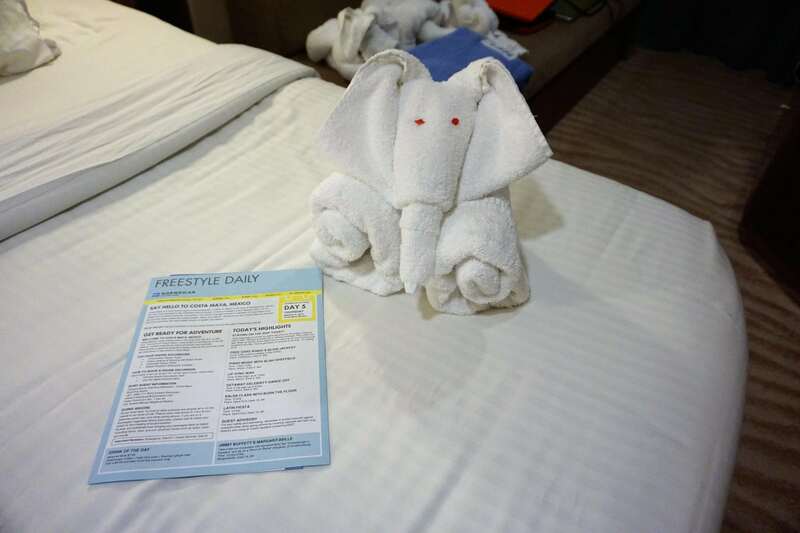 Having had our fill of 80’s music and activities for the day, we returned to the room around midnight to say hello to our newest towel animal friend and retire for the evening. 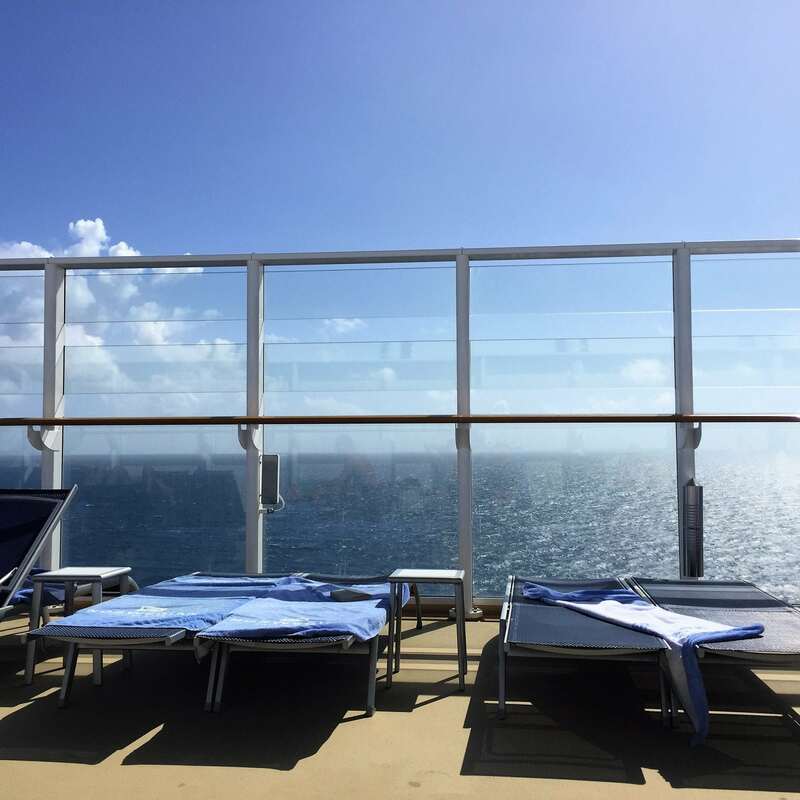 Our cruise was already more than half way over! Would this Morning be “Ruined”? Would the weather play tricks on us again and block us from another port of call? The seas felt rather calm when we awoke at 6:30am. A quick look out the window and there was no sight of land on the starboard side. I took my customary morning walk, returned with some lattes, and got ready for the day. 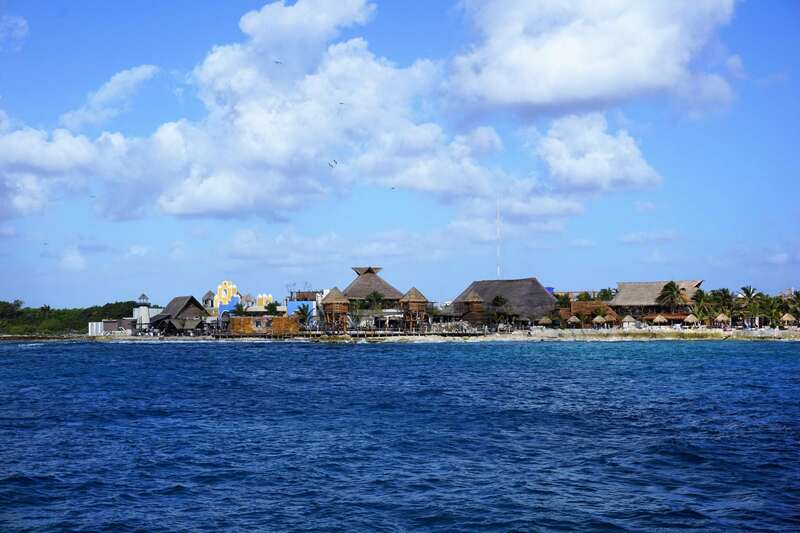 By that time, we had begun to creep into the Costa Maya port. It seemed like today we were going to get lucky and actually make it on to dry land. However, with an expected docking time of 8am, it was closer to 9am by the time we were cleared by local officials. Our shore excursion, a guided tour of the Mayan ruin Chacchoben, was booked through a private company, The Native Choice. According to our tickets, the tour was scheduled to leave an hour after docking. Not wanting to miss our tour, we started down the stairs to the gangway. We were getting our cards scanned when they finally made the general announcement indicating the ship was cleared and the gangway was open. Good thing we headed down early as we were ahead of most of the cruisers on our ship! 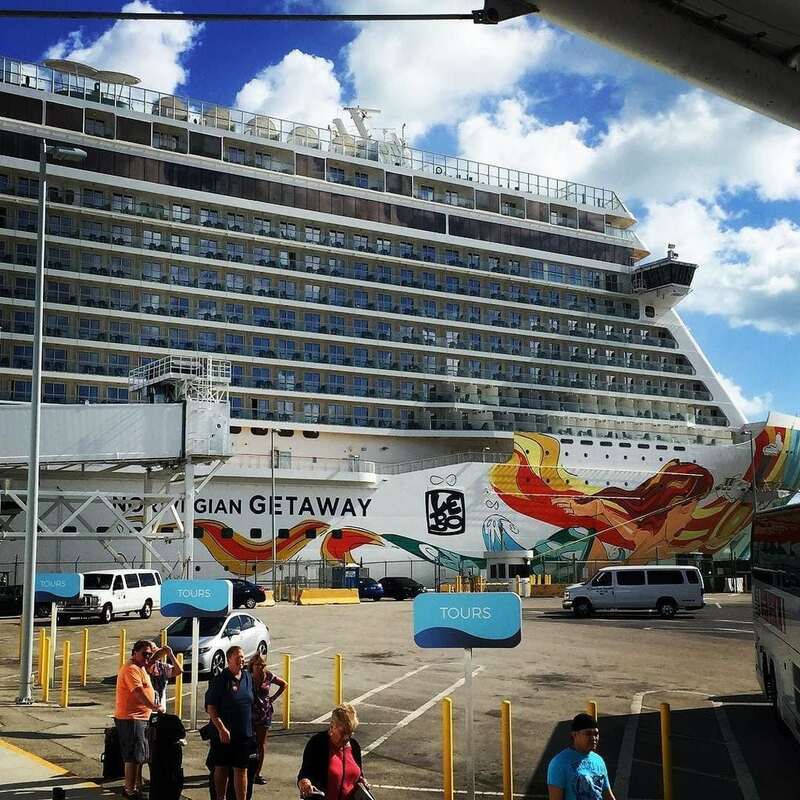 Exiting the Norwegian Getaway, we found ourselves docked next to a sister ship of NCL, the Regent Seven Seas. 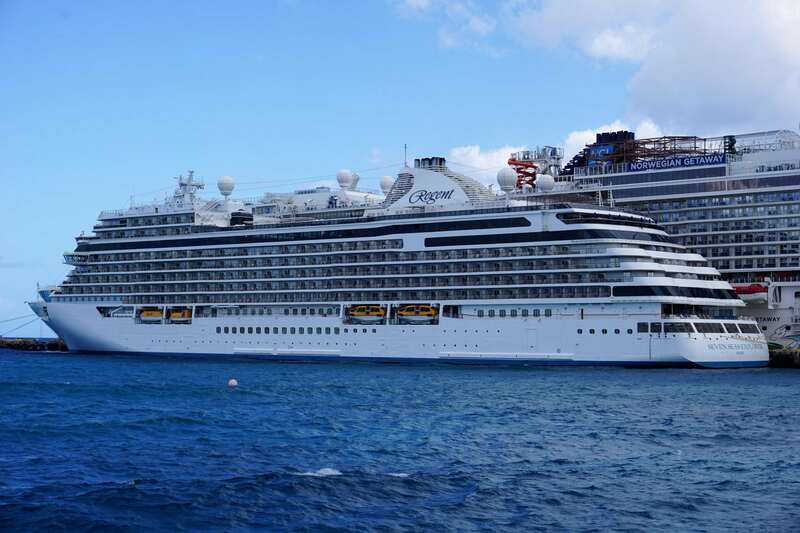 One of the most luxurious ships afloat, she looked rather tiny next to the massive Getaway. Snapping a few photos of the ships, as well as Carnival Magic which was also in port, we began our trek down the pier to rediscover a port that we hadn’t visited in over a decade. A lot had changed since our last visit. Following the directions to our tour guide’s meeting spot, we got an indirect tour of the port, which included a variety of bars, shops, and even a swimming pool and mini “beach”. Finally finding our way out of the area, we were outside the official port and on to the 15 minute walk to the tour guide office. Upon arrival, we were given colored wrist bands and then loaded on a bus. Even though we were told this would be a “small group tour”, we ended up with about 30 other people. At first, I felt a little misled, but our tour guide David was great, and he was able to accommodate our large group. With everyone apparently checked in, the office was closed, and we were off for our Mayan ruin adventure. The tour was a solid four hours, from departure to drop off at the pier. Being a history fan, it was amazing to get to tour the 1500 year old archaeological sites, and I could tell the Princess enjoyed taking all of the selfies in front of these notable sites. Stay tuned for our full excursion review coming soon. Back to the port around 2:15pm, we spent the next 45 minutes or so browsing the gift shops to get our token Christmas ornaments and t-shirts. 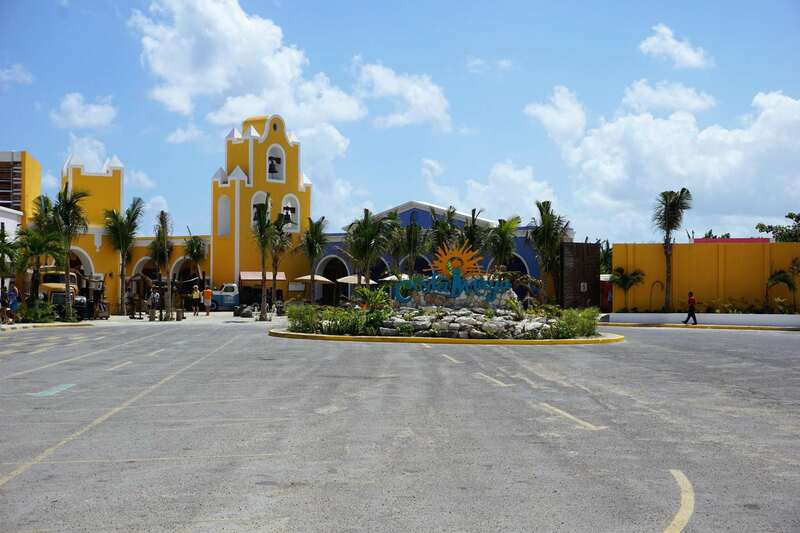 You must bargain when in Mexico, or you are going to get ripped off. We did get a Mayan ruin ornament at Chacchoben, but we also needed one of the port. Collecting our souvenirs, along with another sun dress for the Princess, we were back onboard around 3pm. 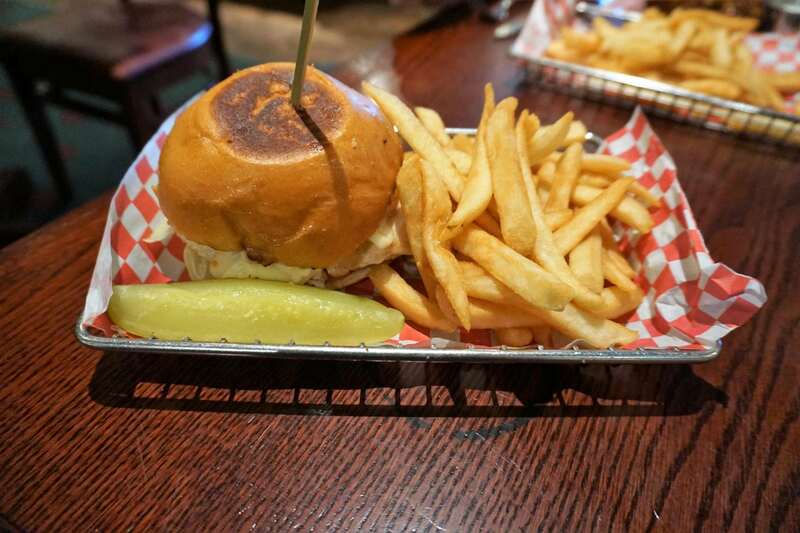 Having gone most of the day with nothing to eat, we headed to O’Sheehan’s Pub. A rather empty pub meant we got seated quickly, and our food was served with very little wait. Finishing our meals a little after 4pm, we had less than an hour to get ready for our scheduled event, a Mixology class at Margaritaville at 5pm. Not something that is offered to the public yet, we were treated to a one hour class where we learned how to make three different signature margaritas. 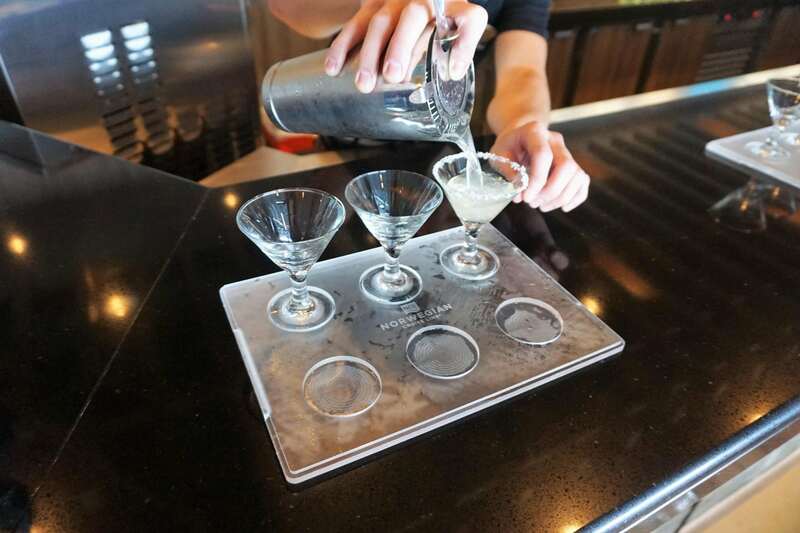 Along with sampling the drinks, we also got a great show by the expert mixologists who displayed their stylish moves. It was a great time and definitely something the cruise line should consider adding for an additional fee. Somehow I lost my last drink while talking with the brand representatives from Margaritaville, but it was 615pm, and they were kicking us out to close the venue. Thinking the event was going to last longer, we had about an hour of free time before our dinner reservation. Dropping off the additional new goodies we got from our friends at Margaritaville, we strolled down to the casino. Grabbing a drink from Bar 21, while breaking even on the video blackjack machines, we each got our usual cocktails. It was time for the Princess to rescue herself and win back the money she lost earlier in the cruise. Or, lose even more of my money! Leaving the casino down a little bit of cash, we were off to Moderno a few minutes early for our reservation. Checking in with the hostess, we informed her that we had already paid for the restaurant (were required to pay when making the reservation online pre-cruise), but we wanted to apply one of our specialty dining credits from the dining plan. Expecting to get some resistance, this was actually quite easy, and we had a credit on our onboard account later that evening. 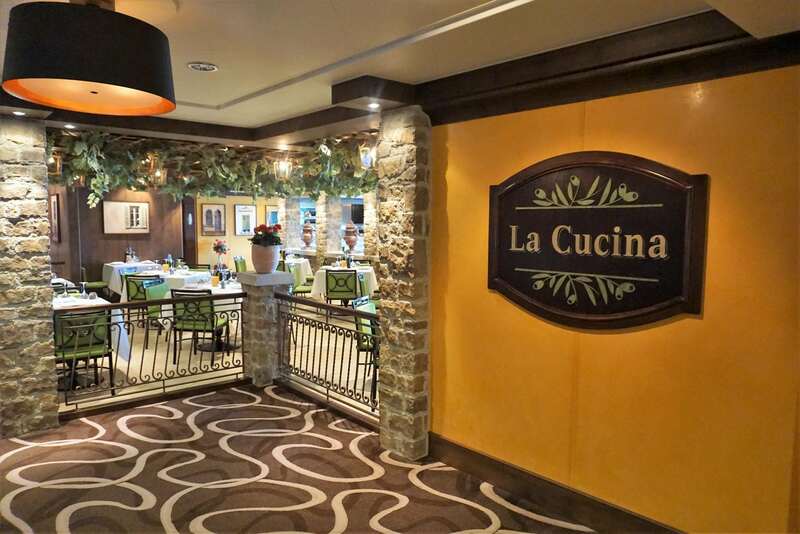 I am a big fan of this restaurant and could eat here several times during a cruise. 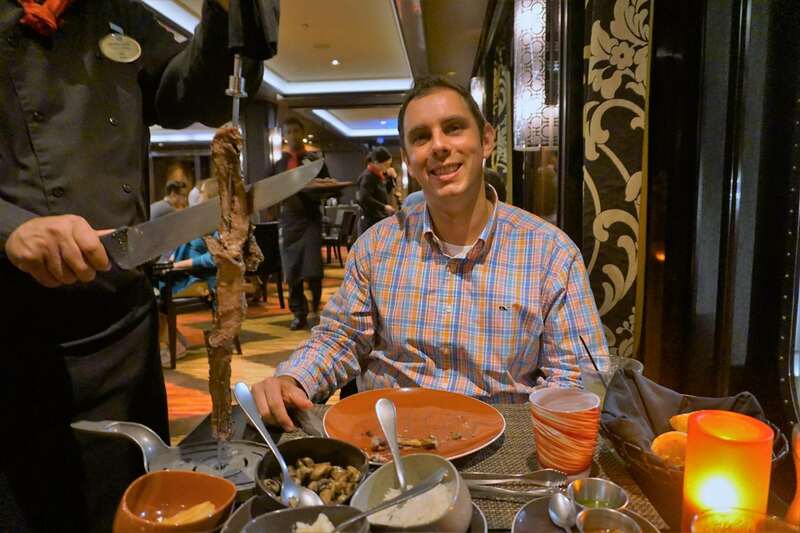 Getting an indoor table with a view, our waiter came over to describe the Brazilian steakhouse concept. Ordering a round of signature cocktails, we then started with the appetizer buffet. When we were ready, we flipped our cards to green and proceeded to enjoy a 90 minute food fest. I left no skewer behind, sampling at least one serving of all 11 offerings. 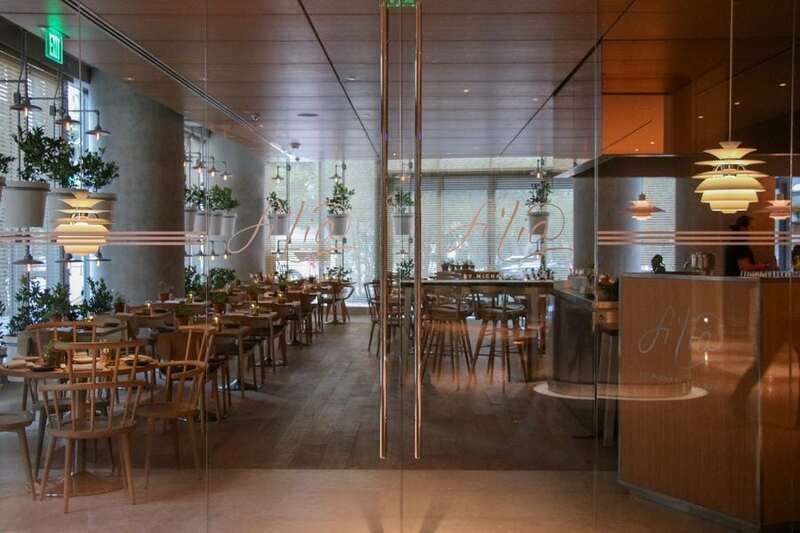 This restaurant is a carnivore’s dream. We will have a full restaurant review coming soon. Waddling out of the restaurant around 9pm, we decided to check another venue off our drink around the ship. With live music in Fat Cats, we found a table near the stage and listened to the last few songs of Sweet Beat Band before they took a break. While there, I got a gin and tonic and the Princess a rebellious fish, seemingly her drink of choice this cruise. Not wanting to sit there in complete silence, we took our drinks over the to the Sugarcane Mojito bar, where there was also some live music, for a few minutes anway. For some reason, we kept hitting the performers right before their scheduled breaks. Our plans all along were to get in line early for Howl at the Moon. While we also had reservations for Million Dollar Quartet at 10:15pm, we opted to head downstairs around 10pm to see if the Headliners club was open as we were determined to get a seat! 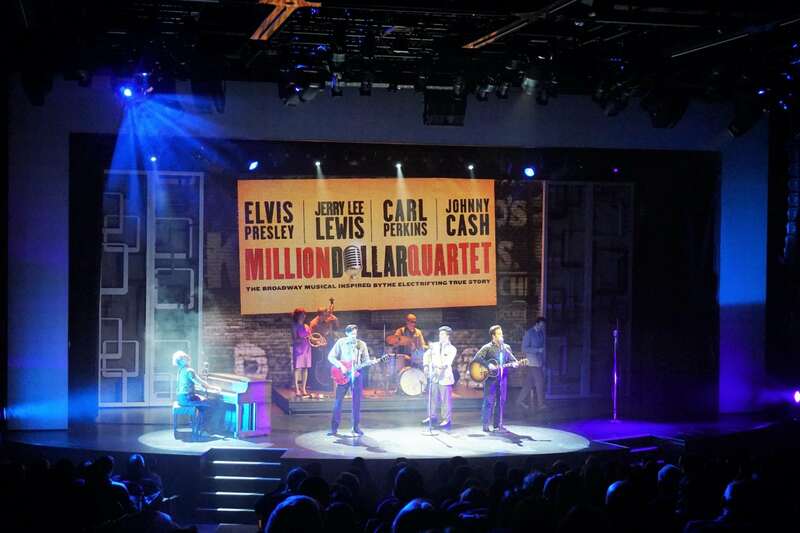 Since we had already seen Million Dollar Quartet on Escape, we passed on the showing. Finding a retiree also waiting to get in, a line quickly formed behind us. The crew did not let anyone in until 10:15pm. Being among the first people into the venue, we got some prime seats with great views but not too close to the stage. The Princess never likes getting called out during a performance. To check the venue off our drink around the ship, I went to the bar to order drinks, as the servers had their hands full with this thirsty crowd. 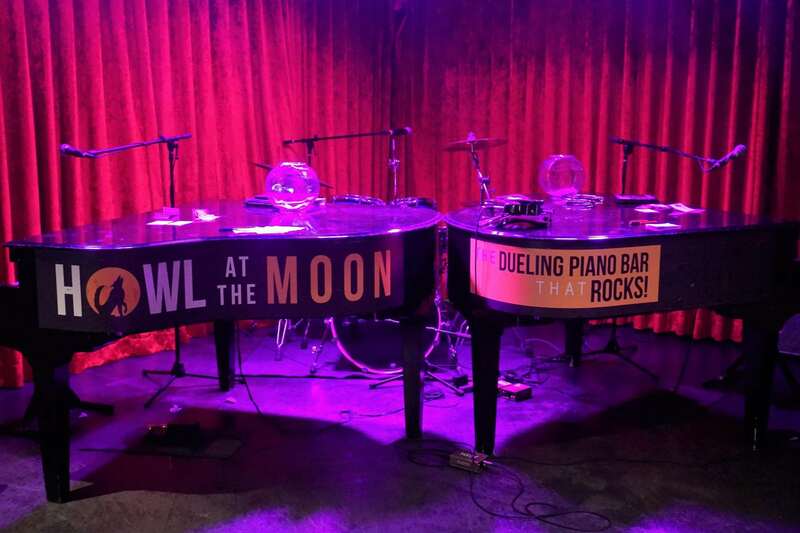 Starting promptly at 10:30pm, the three performers, who rotated between piano, drums, and even violin, put on a great performance. Though, we found the cohesion of the group and vocals to be better on Escape. Song selection is very dependent on the crowd, but there were plenty of familiar songs, including Train, a Princess favorite. Although this party was going till the wee hours of the morning, it was about midnight when we decided to call it quits to return to our room and our next fuzzy friend. 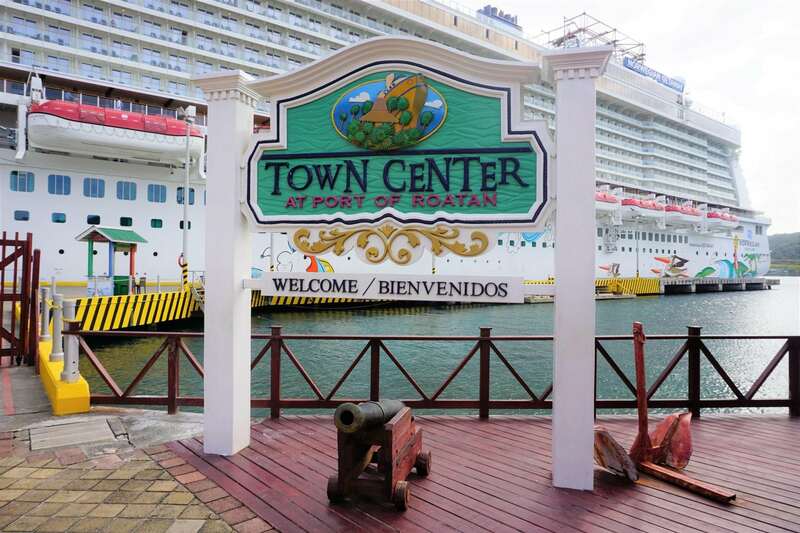 Today was our last port of call, Cozumel, Mexico. We joke that even though we stop here often, we rarely do anything. 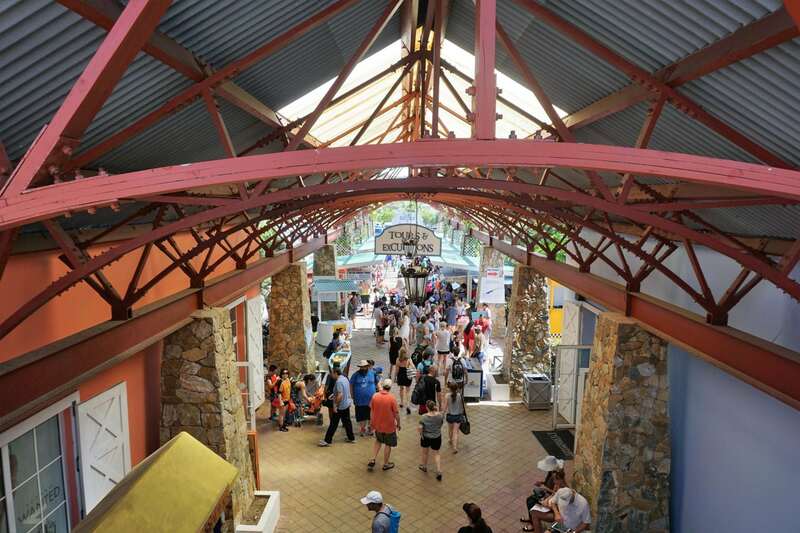 Being a popular port of call with all cruise lines, we have plenty more stops here in the future. So, our original plan was to take this as a relaxing day to ourselves. The only official scheduled event during the day was a tour of the Haven. With the ship set to dock at 8am, the tour was not scheduled until 9:45am. 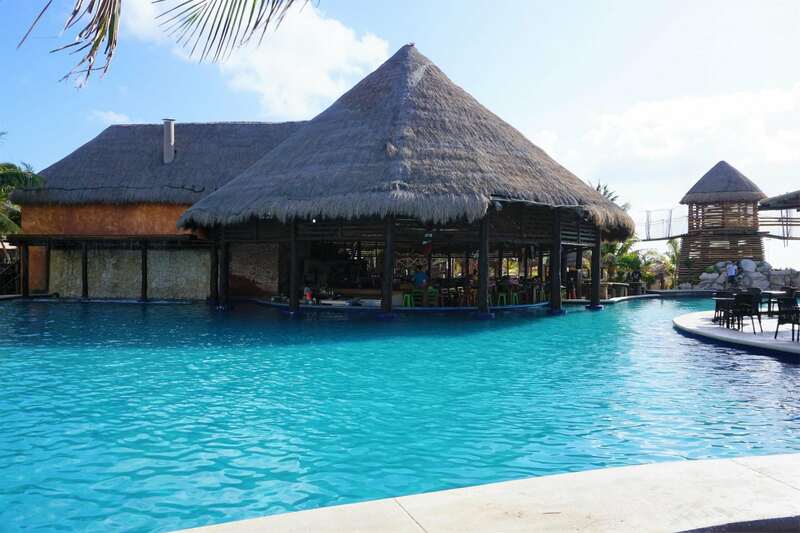 Even if we wanted to do something in Cozumel, we figured by the time the tour was over, it wouldn’t be worth heading to an all-inclusive beach resort as we had an early dinner with our crew scheduled for 6pm tonight. Given the timing, we decided to sleep in until 7:30am. Seeing that we were about to dock, I grabbed some iced lattes. 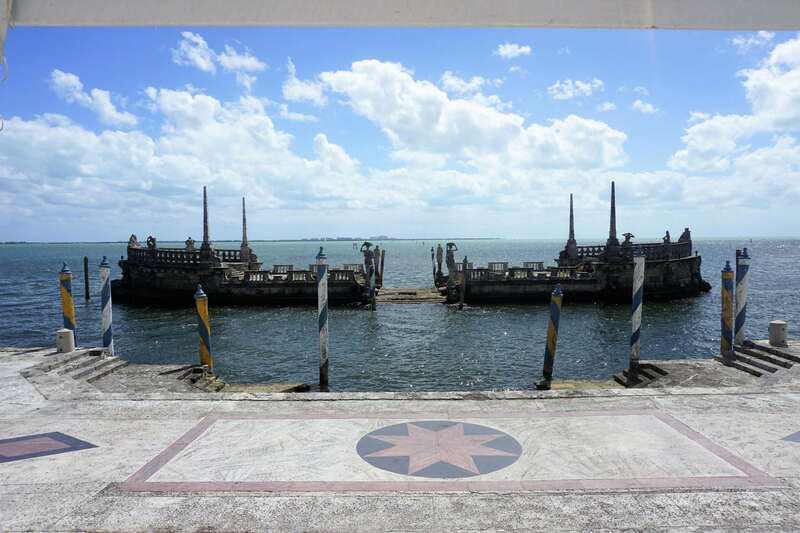 With the announcement made that we had been cleared, I could see that our pier location was different from where we usually dock. And, it would also give a prime opportunity to get some full shots of the ship. Fearing another ship would ruin this vantage point, I grabbed my camera and made a dash for the gangway. I hustled down the pier, stopping every so often to get the best angle I could. While I was only gone for about 30 minutes, I did manage to snap a few decent photos right before an MSC cruise ship pulled in to port right beside us. Back with plenty of time, I was down to meet everyone around 9:30am. Joining the crowd with a mimosa, we headed up to the Haven area around 10am. The Princess stayed behind to do some editing. On Norwegian Escape, we got a lovely behind the scenes tour of the Haven early in the morning, and this was essentially the same thing. 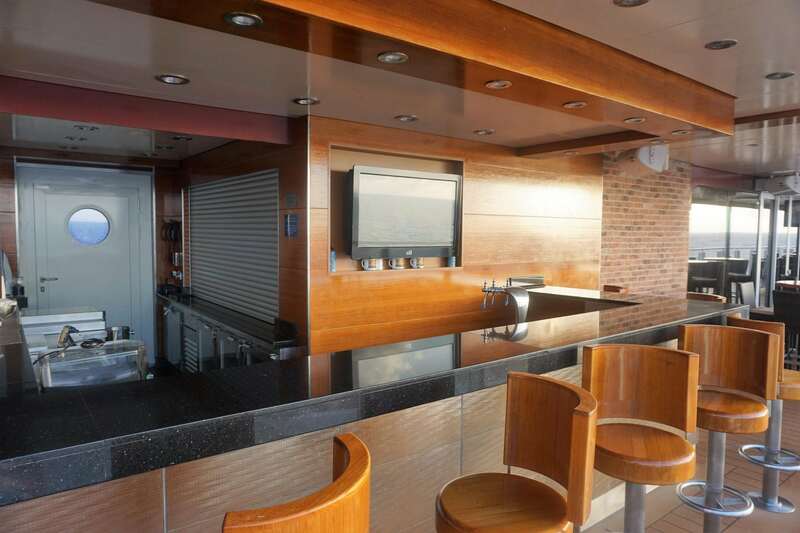 We got to take a look at the lounge, restaurant, and public spaces. 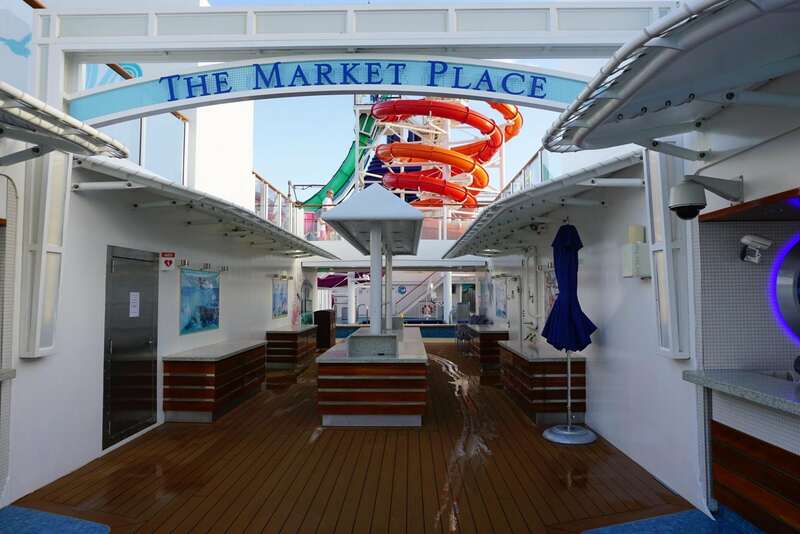 While some of our fellow cruisers were making plans to meet up at the Margaritaville in Cozumel, we were more than happy to take advantage of the rather empty ship today. Getting some great unadulterated sun and the chance to ride the waterslides with no wait, it was like having the ship all to ourselves. Finally, some peace and quiet. Skipping breakfast, we were both starting to get hungry around 12:30pm. 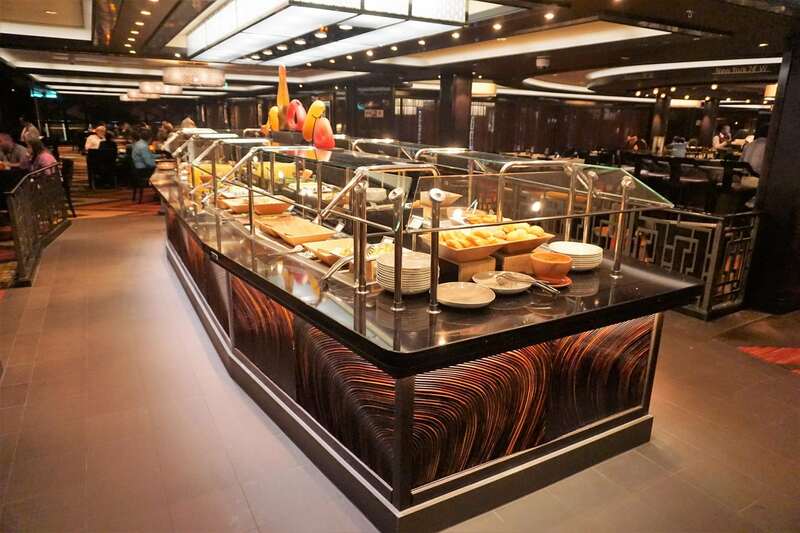 With few venues open, I convinced the Princess to give the buffet a try. Offering a rather diverse selection, the food was just okay. Sampling a variety of different options, I was a fan of the profiteroles, with some vanilla ice cream and chocolate sauce. This is normal to eat at 1pm on a typical Friday afternoon, no? Following lunch, we grabbed drinks at the only other outdoor bar we had not crossed off the list, the Waves Pool Bar. Of course, we had to get some frozen cocktails. The Princess did a Mango Meltdown, and I gave the Bushwhacker a try. Both were delicious; if it weren’t for all the calories and heaviness of frozen drinks, we would drink them throughout the day! Sipping our cocktails for about an hour more in the sun, the crowds were beginning to return. Wanting to tackle the ropes course one more time, we went back to the room to change into the appropriate attire. Getting in line right when it opened at 3pm, I did the course, while the Princess watched and took pictures. 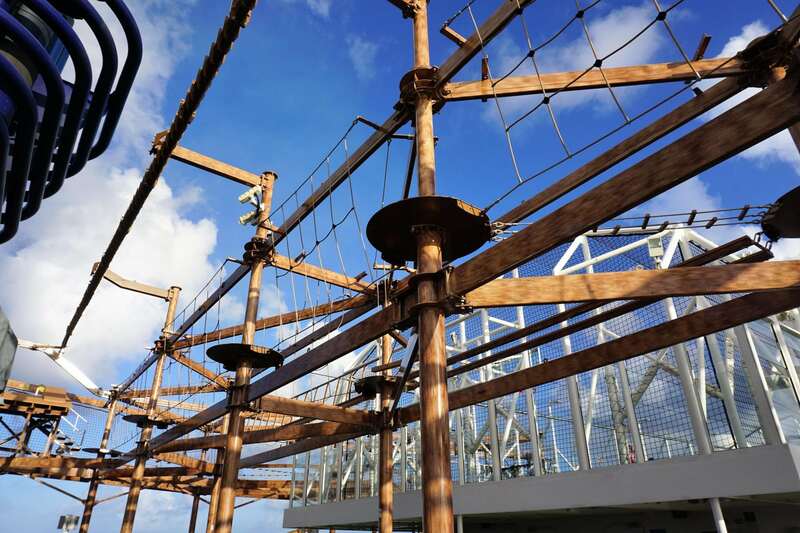 Of all the onboard activities on ships, the ropes course on Norwegian Cruise Line ranks on the top of the list of things to do. Making my way through the obstacles, out onto the plank, and back down via the zip line, I was done within 20 minutes or so. Time to celebrate with another cocktail. This time around, we found ourselves at the outdoor seating area of the Sunset Bar. Technically, this bar is just an extension of the same bar inside, which serves the same specialty cocktail menu. Already sampling the menu, I just went with a Long Island Iced Tea, and the Princess was in the mood for a banana daiquiri. We did some people watching and just enjoyed the outdoor, shaded seats that the Waterfront provides. This is another great feature of the Breakaway-class of ships. A perfect spot to unwind outdoors, we love the Waterfront. Needing to get ready for dinner, we were back to the room before 5pm. With a quick shower and change, we were to Ocean Blue for 6pm. Breaking our group up into two tables, we were lucky to get stuck at the “loud” table. Or, as I like to think of it, the “fun” table. In all honesty, we were very fortunate to have such a great group, so either table would have been an ideal place to sit. 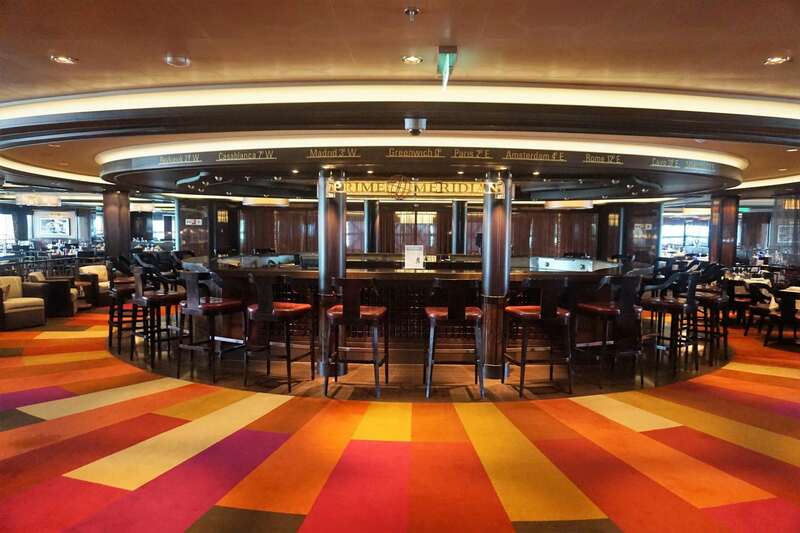 A solid 2.5 hours of drinks, laughs, and some food, including the best New England style clam chowder we have ever had on a cruise ship, we were among the first to leave, as we had show reservations for 9pm. Somehow, we were always those people. That’s what happens when you are over-planners! 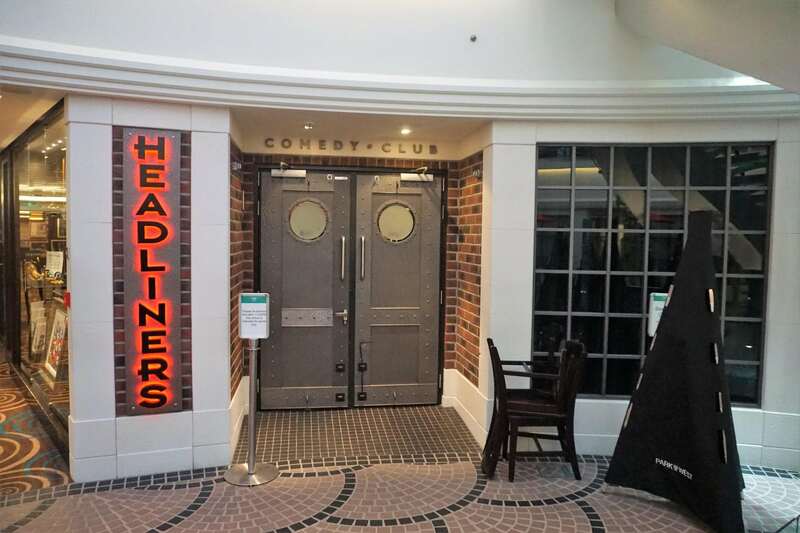 This was our last booked show, the second comedian, Frank Townsend, at the Headliners comedy club. The funnier of the two comedians, we knew the show would be packed. As we ventured to deck 6, we could see a large line forming. As we got closer, it was apparently the standby line. Wow, that was a close one. Swiping our cards, we were let in to a half filled room. We selected seats similar to those we had for the other comedy show- we are such creatures of habit. Shortly before 9pm, the standby line was let in, and there was a dash of people filling in the remaining seats. Funny as always, we enjoyed Frank’s performace. 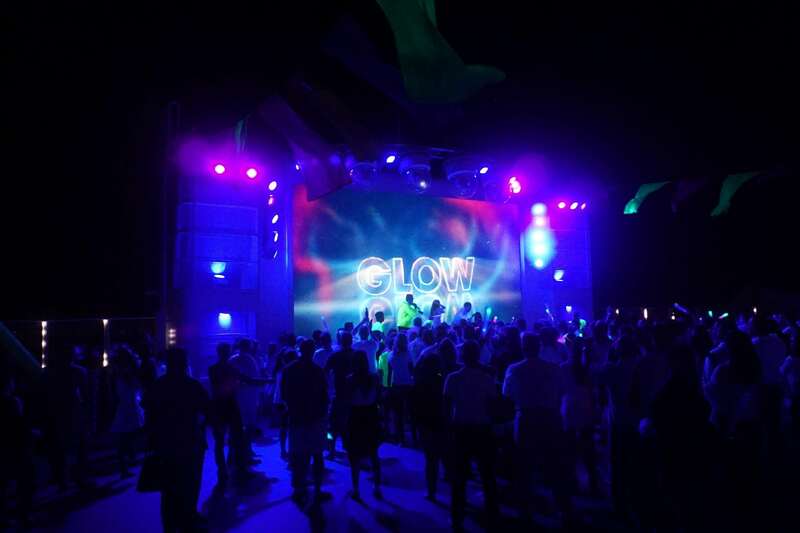 With the Glow party starting at 10:30pm, we dropped off the additional gifts bestowed upon us during dinner, and it was up to Spice H20. The crowds had gathered, but we spotted one of our crew right away. Soon enough, the party would start, and the rest of the influencers slowly filtered in. Then, there was only one thing left to do…Party! Even the Princess got into the Glow mood. Grabbing drinks, social media posts, and a few selfies, the party was raging all night long. For us, we called it quits a little before 1am. 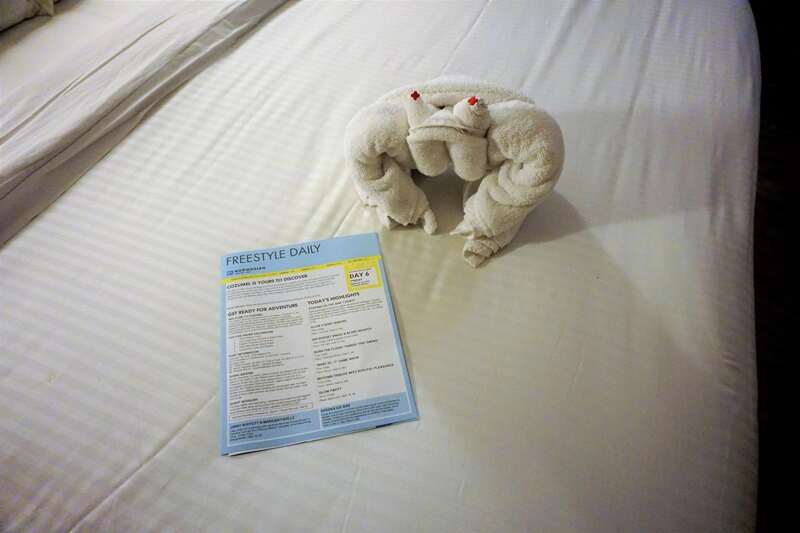 Coming back to the room, we found a friendly critter and the last day’s freestyle daily. BOO! Still, there was one more day to make the most of this amazing vacation. But, we would be losing an hour of sleep as we turned the clocks ahead an hour for day light savings one day in advance. Assumingly, to avoid any headaches on disembarkation morning. The last full day of the cruise was a sea day. 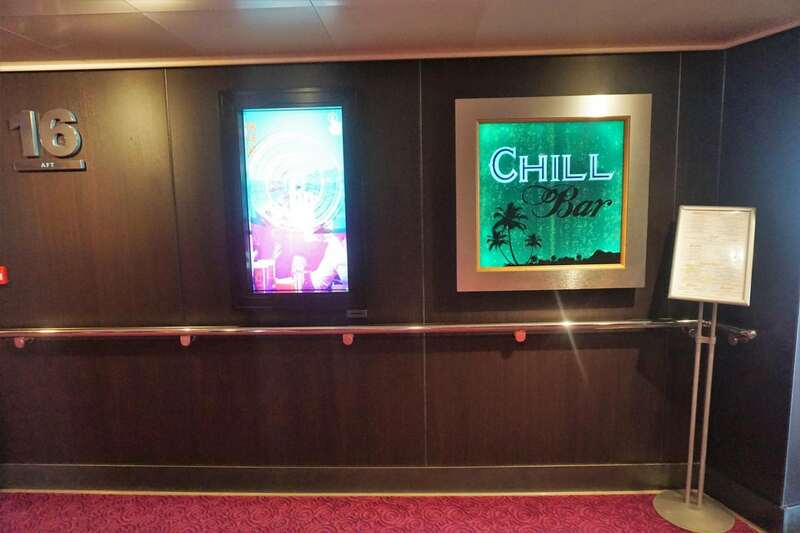 Throughout the cruise, we had gone through several time changes. So, even though we were up at 7am, it really felt like 6am for us. Nothing like not being able to sleep in on vacation. Of course, this meant we need some iced lattes, pronto. During dinner the night before, our hosts had told us they reserved a private ropes course session for our group at 9am. There was no way I was going to pass up the opportunity to have this outdoor deck all to ourselves. Slowly but surely getting ready, we got to the ropes course a few minutes late. Apparently, some of our travel party spent a bit too much time partying the night before, as we were among the few to make it to the course. Getting out there, and forcing a few of our fellow travelers to do the same, it was a great way to start the morning. Not wanting to go overboard (both literally and figuratively), I did not over exert myself on the course this morning. 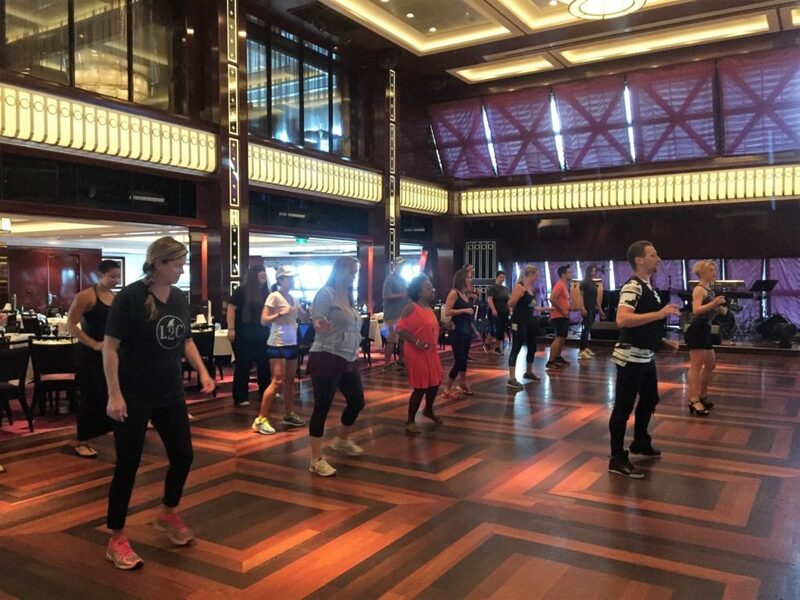 Our next activity for the day was a private dance class with performers from Burn the Floor. 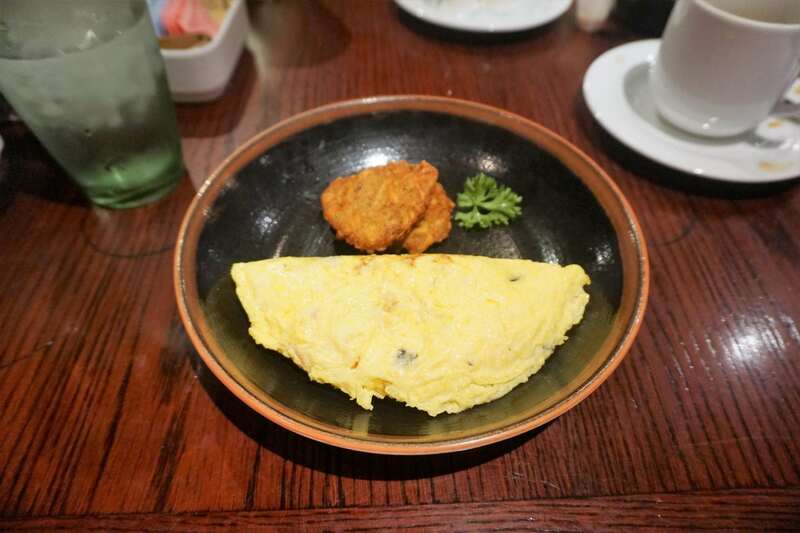 Finishing up about 20 minutes before that scheduled event, we had just enough time to squeeze in a custom made omelet at the breakfast buffet in Margaritaville. Yes, there is a small breakfast buffet in Margaritaville that is rather empty, at least on sea days when the clocks have been changed! Scarfing down breakfast, we were to the Tropicana Room for 10am to begin our 75 minutes of torture, I mean dance class. Actually, it was really fun as both of the performers were very generous in their grading of our skills. We learned how to do the cha-cha, and I still have a few of the moves down. I think I would do another dance class, if the caliber of teachers were the same. Even the Princess attempted at least a few minutes of instruction, before tapping out and opting to take embarrassing photos and videos of the rest of the group. Finishing up around 11:15am, we had a lovely, sunny day to do as we pleased. 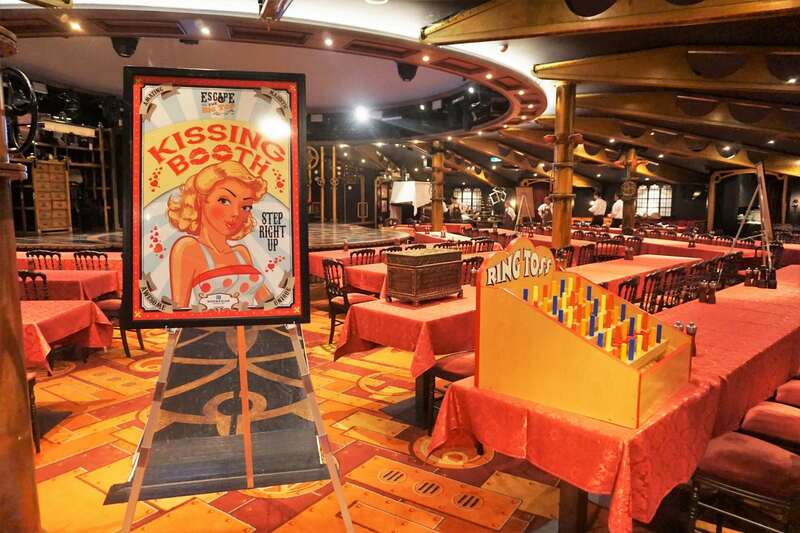 Earlier in the cruise, we booked the cruise line’s new escape room experience for 2:30pm. So, we had a few hours to kill before that game and our last official meetup with the group for Karaoke at 5pm. Wanting to be outdoors, but not necessarily in the sun, we made our way to the Waterfront. Finding some comfy chairs near the Sugarcane Mojito Bar, we relaxed until it opened at noon. Crossing it off our drink around the ship, we enjoyed our drinks and ocean views until about 1pm. 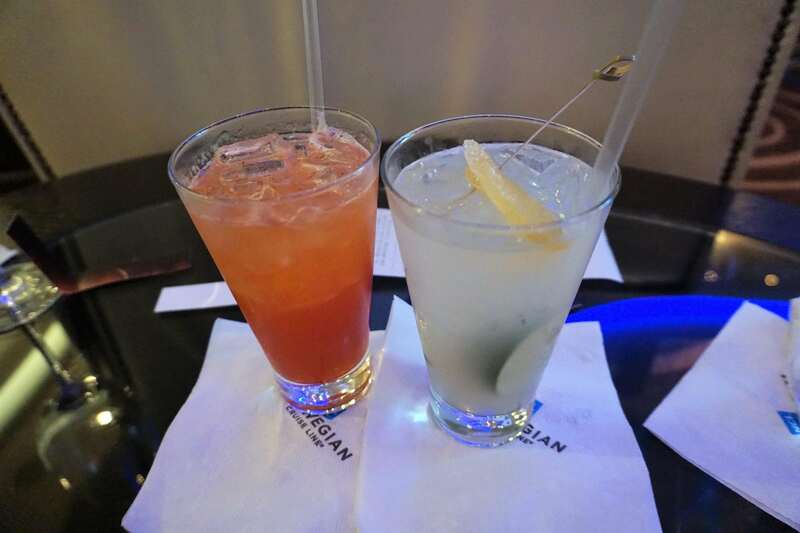 A Raspberry Guava mojito for the Princess, and I tried the Jalapeno Cucumber mojito. Now, it was time for some lunch. Reviewing the lunch menu at the main dining room, which was very similar to NCL Escape, we were on the fence as there weren’t many options that the Princess liked. When I finally mentioned making one last stop at Margaritaville for nachos and a salad, the Princess could not resist. Lucky for us, there were a few open tables left, so we got a nice ocean view during our hour-long lunch that was worth every penny! Following lunch, we made our way to the Illusionarium, home to the escape room. It was a bit chaotic checking in as the entertainment staff did not make it clear that you had to pre-register for the event. Wading through the crowd, we were led into the venue and met the other 6 players on our team. Unlike other escape rooms, there are actually 8 teams of 8 all completing the same puzzles, and the first team to correctly solve them all wins. Although a decent circus-themed concept with challenging puzzles, it was a bit less interactive than most escape rooms and too confusing with so many people in the room. Given our allotted 45 minutes, we came close to victory but fell short as another team was a few steps ahead of us. Still, we had a fun time. 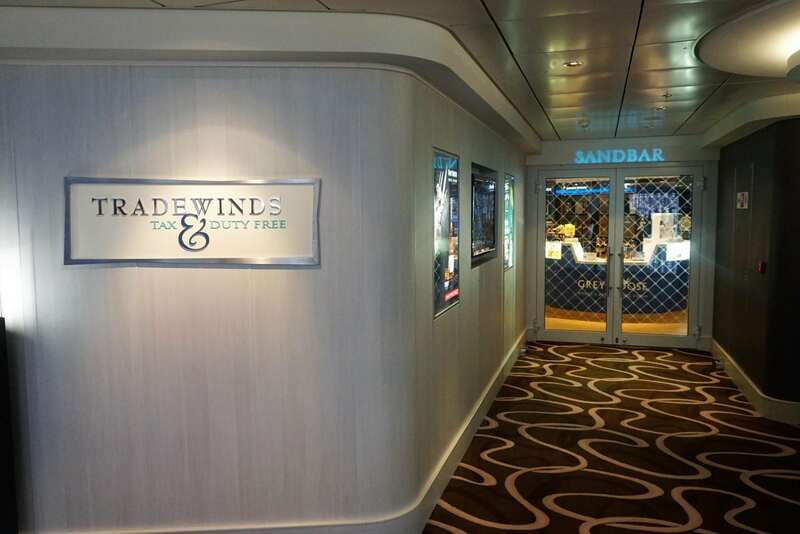 Being a rather “low-tech” escape room, it does not cost extra money to participate like some other cruise lines. 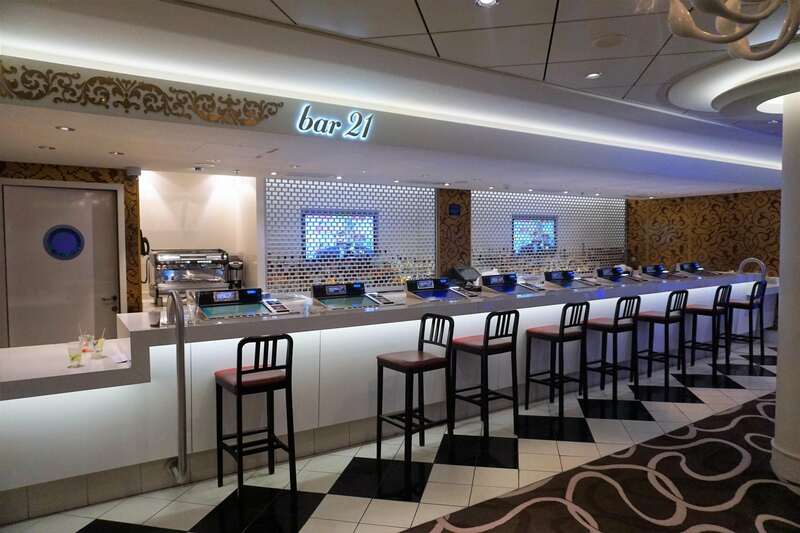 If this catches on, I can see NCL adding a more sophisticated experience to future ships and charging a small cover charge, which we would surely be willing to pay. With Karaoke looming at 5pm, we grabbed some iced lattes and headed back to the room to begin the awful task of packing. While we try to keep things somewhat organized, we needed some time to make sure our bags were evenly distributed as we did not have an ounce to spare in these 50lb suitcases. Where were we going to fit all this swag we acquired over the course of the week? Packing and getting ready, we were to Fat Cats for 5pm to learn that this was not a private event. Thank goodness, as neither one of us wanted to sing! Also, it was karaoke with a live band. 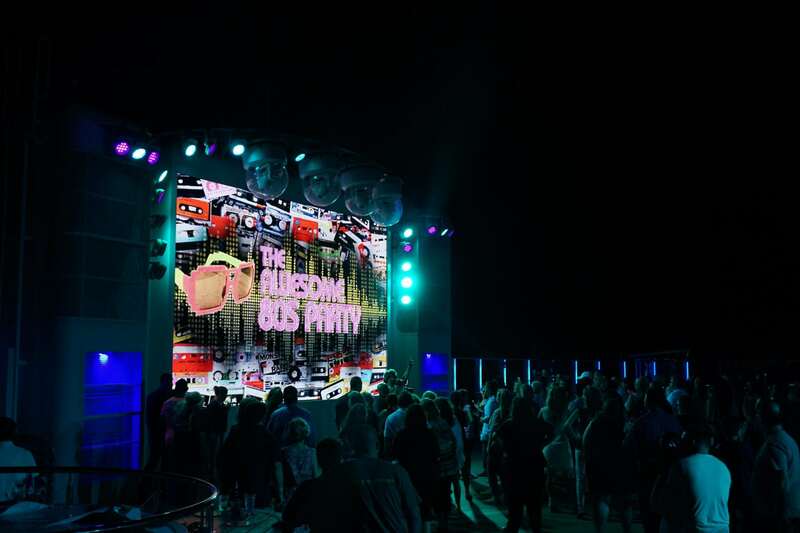 After witnessing a fellow cruiser do one of the best live karaoke performances ever on a cruise ship, and another one of our fellow social media influencers put on an equally impressive performance, no one else wanted to take the stage. Not so fast! Rounding up most of our group, we put on one heck of a Sweet Caroline performance as one of the last songs of the night. Always end on a (off key) high note. Ending right at 6pm, we had to scoot out for our dinner reservations (of course we did). Making the rounds to say goodbye, we mentioned to some folks that we should meet later on for one last drink. Most said okay, so we would meet up at 9pm for our final send off toasts. 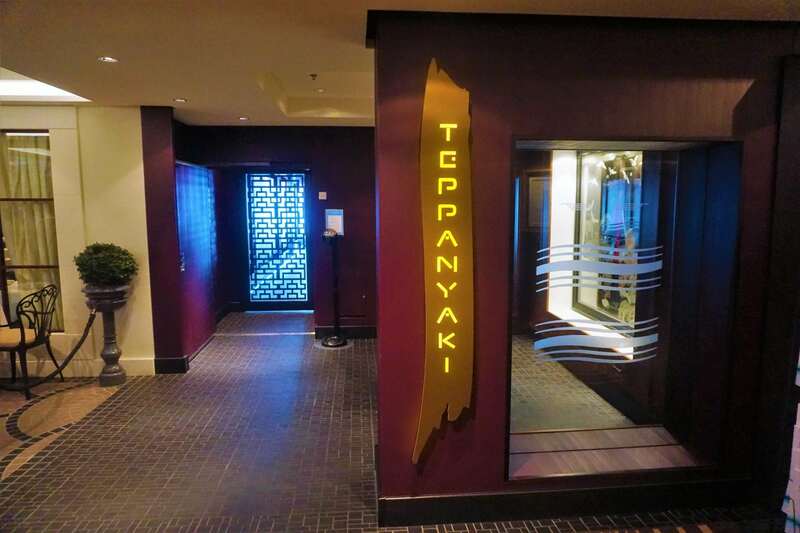 Our final dinner of the cruise was at Teppanyaki, one of our favorite restaurants on NCL. This go-round did not disappoint. Our chef Warren, and fellow table mates, made the dinner and show entertaining. Dinner lasted just under two hours. With our meetup scheduled for around 9pm, we had a few more bars to check off our list, but it was back to the room to finish packing first. Back down to the Ice Bar for 8:30pm, it was one of the only elements of the cruise that did not live up to our expectations. A rather small venue, which looks a bit more like a meat packing plant than a bar, the Princess could barely stand 10 minutes in the venue before calling it quits. I lasted a bit longer, mainly to get my money’s worth as it costs about $18 (with the UBP discount and service charge) per person. For that kind of money, I was going to finish my two drinks. With only five drinks on the menu, we tried four of the five. You do need to drink fast, as these cocktails will turn to ice if you sip them for too long. 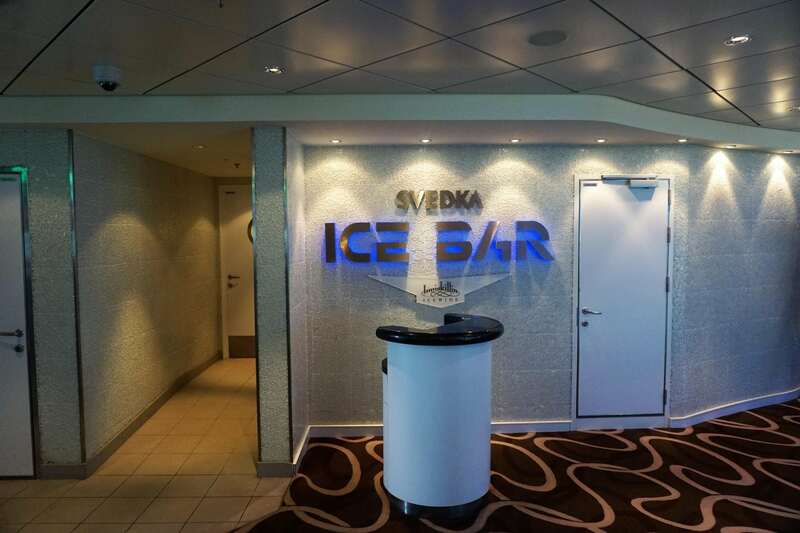 Escaping the Ice Bar with our limbs still intact, the final stops on our drink around the ship were the Mixx Bar on deck 6 and Bliss Lounge. Not eating at either Savor or Taste during the cruise, we never had the chance to stop at this rather busy bar. Getting there a little before 9pm, I ordered a negroni and the Princess her usual. Drinking about half of our cocktails, we arrived to the meet up about 15 minutes late. To our surprise, almost everyone showed up. The next two hours or so was time to talk, discuss shop, reminisce about a great trip, exchange contact info to stay in touch, and have a few more mojitos of course. As the group started to disperse, the Princess reminded me that we had to complete our drink around the ship at the Bliss Lounge. 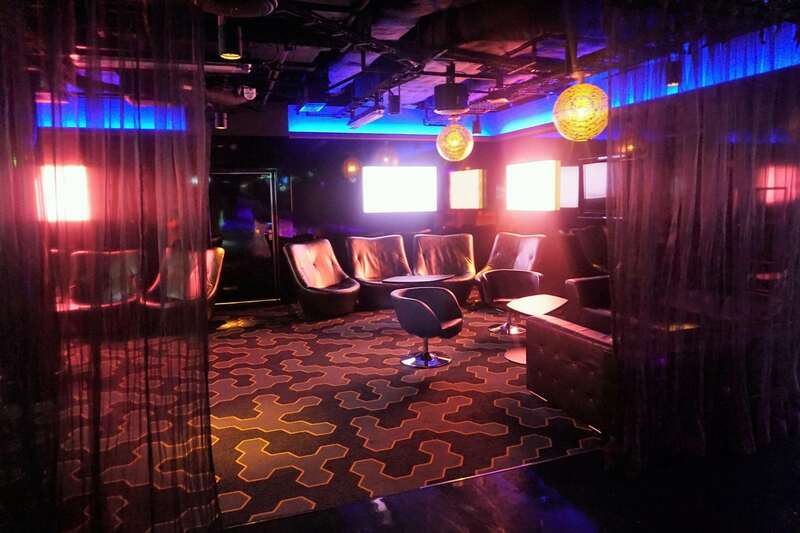 This nightclub opened at 11pm, and when we arrived about 11:15pm, we found the venue completely deserted. Besides the two bartenders, there was no one else in the place. I guess with so many great venues, no one needs a traditional night club. So, we didn’t stay more than 10 minutes. Taking our drinks with us, the Princess headed back to the room. I stopped to take a picture of the Ice Bar menu, when I got sidetracked by some of our remaining friends now living it up at the Sunset Bar. What was supposed to be a five minute final goodbye ended up being an hour dish session, mostly with the marketing and branding people from Margaritaville. Lets just say, when I got back to the room after midnight, the Princess was not happy! Is that the alarm already? 6am comes quickly when you have been drinking for about six straight hours during the last night of a cruise! For most cruises, we do the self assist checkout. For this cruise, it was scheduled between 7:30am and 8:30am; while on other cruise lines, this program sometimes starts as early as 6:30am. Up early, I could see that we were still pulling into port. 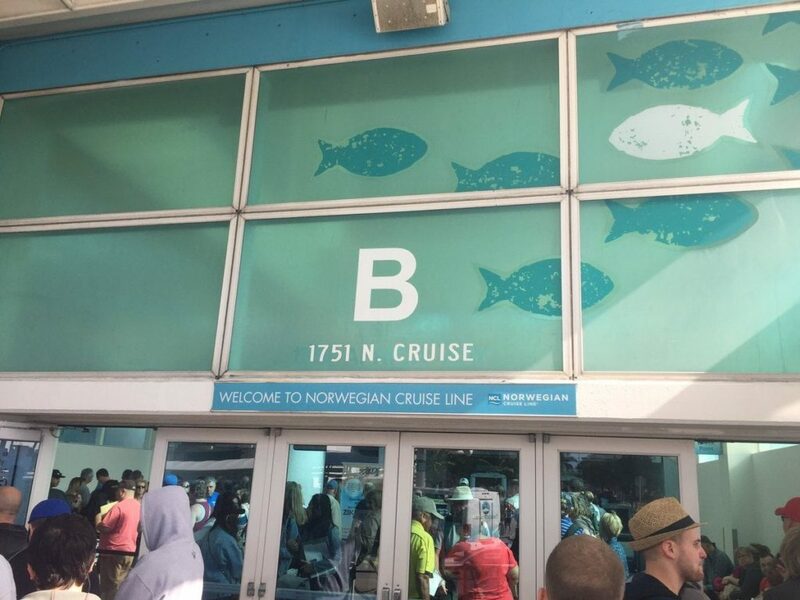 I guess NCL does dock later than other cruise lines. 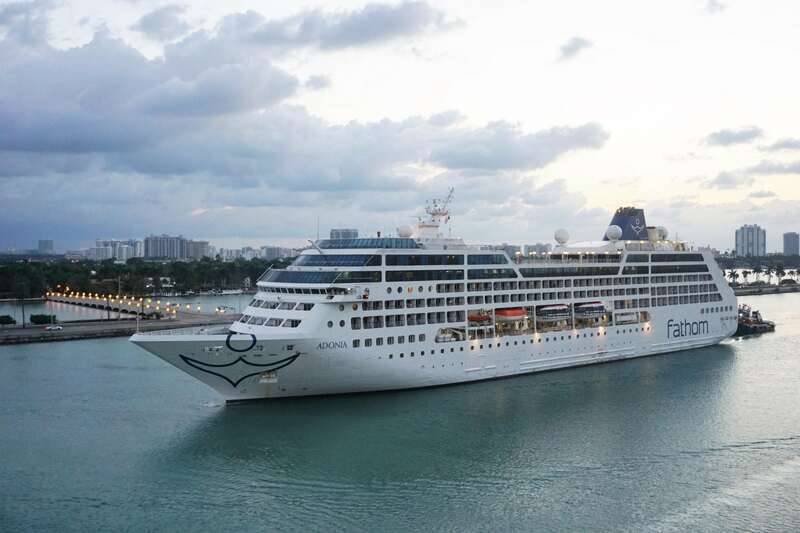 Once docked, we got to witness the Fathom Cruise Line’s ship, Adonia, make her approach into Port Miami. It was before 7:30am when I made my way down to Cafe Atrium for coffee, but I could already see a line forming for disembarkation off the ship. This would be a foreshadowing of the morning to follow. Of course, the Princess needed to get breakfast, so instead of hustling to the self-checkout line, we braved the masses at the Garden Cafe. Actually, the crowds were not as bad as we expected. 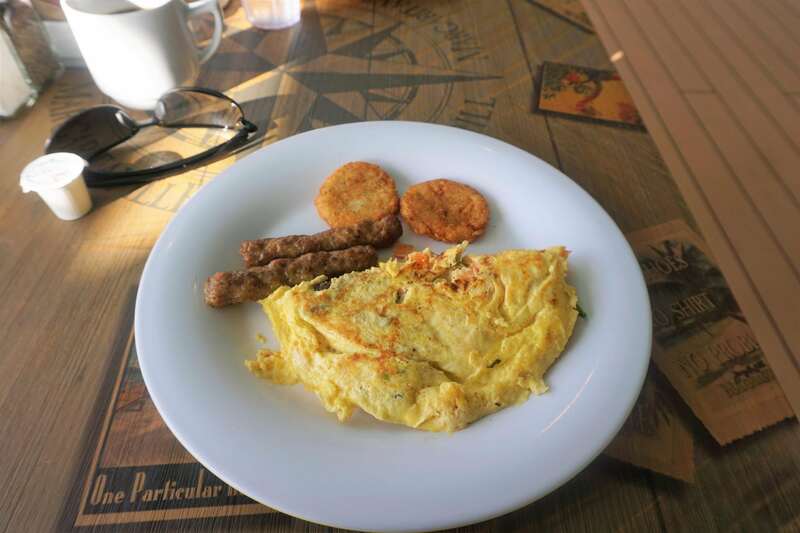 We easily found a seat and were able to get a few items, minus a custom omelet. After all the eating we did this cruise, I think we could manage. Back up to our room to get our bags and do a last survey of the cabin, we could see the line of people waiting at the elevators. I knew it was going to be nearly impossible to find an elevator that would be empty enough for the two of us and all our luggage. Grabbing our bags, we were to the deck 11 elevator lobby. Waiting what felt like an eternity, an elevator stopped with enough room to get the Princess on with one of our bags. My plan was to catch another elevator and meet her on Deck 7. Not wanting to delay our departure any longer, I decided to lug our additional 2 suitcases down the stairs to meet her instead. Well, that plan was spoiled when cruise staff would not let me continue down the forward set of stairs and rerouted me through Deck 8 to use the 678 Ocean Place staircase. Long story short, it would take about 45 minutes of snaking through the entire ship for me to be reunited with the Princess, who was actually further behind me in the line due to the location of where she exited the elevator. 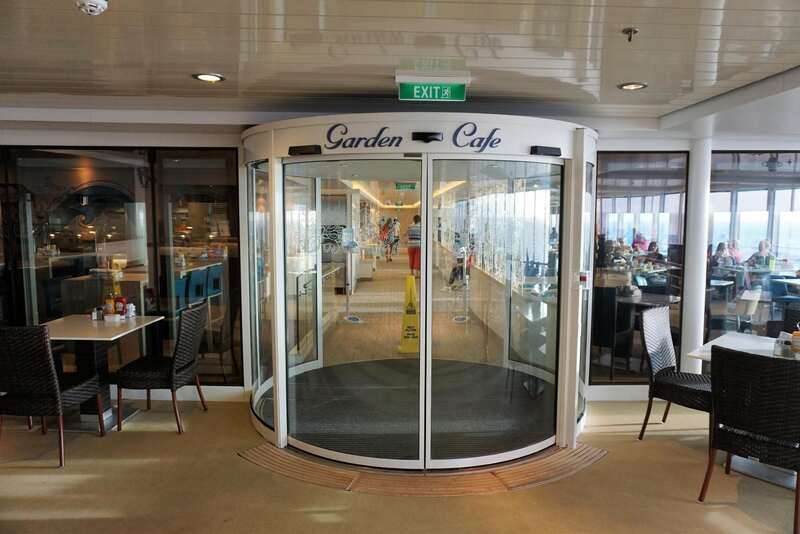 This was one of the worst dismebarkations we have ever experienced, rivaling our experience on Quantum of the Seas. Finally scanning our key card for the last time, from the ship through customs only took about 20 minutes. Luckily, because if we had to wait another hour in line, I might have had a meltdown! Getting to the taxi stand around 930am, we were to the Fort Lauderdale Airport in about 35 minutes. Checking our bags and getting through the longer than normal security line still took only about 30 minutes. With over 90 minutes to spare, and a packed terminal, it took another 30 minutes to find seats. Doing some social media and checking on the impending weather forecast that was calling for a potential blizzard back home, it was time to board the plane before we knew it. 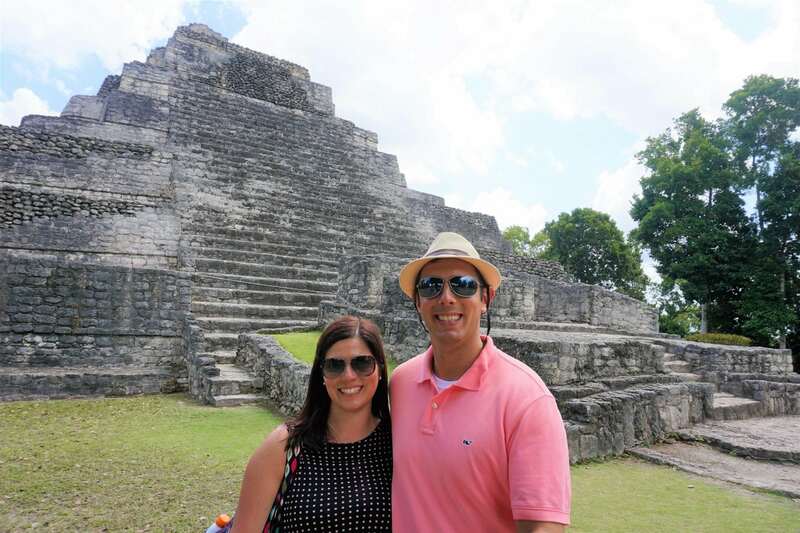 Unfortunately, given our late change in travel plans from our originally scheduled 6-day Carnival Vista cruise to this 7-day trip on Getaway, our flight home was not direct. We had a layover in BWI. Ugh, just another nuisance on our final day of the trip. The first flight arrived without issue. Then, it was time to hustle through that airport to get from Terminal B to our gate on the other end of Terminal A. We had just enough time to stop for a bathroom break and a coffee before it was time to board the short flight to Providence. Arriving around 6pm, we touched down to a rather busy airport. It is never that congested, especially on a Sunday night. Grabbing our bags and walking outside to the shuttle bus, we were greeted by frigid temperatures. And to boot, the Princess accidentally left her sweatshirt at one of the airports. We waited only a few minutes for the shuttle to take us to our car. Thankfully, it started, and we were on our way home. Arriving home an hour later, we were in no mood to unpack or come to grips with going to work the next day. Good thing we have another cruise to look forward to in only two months. 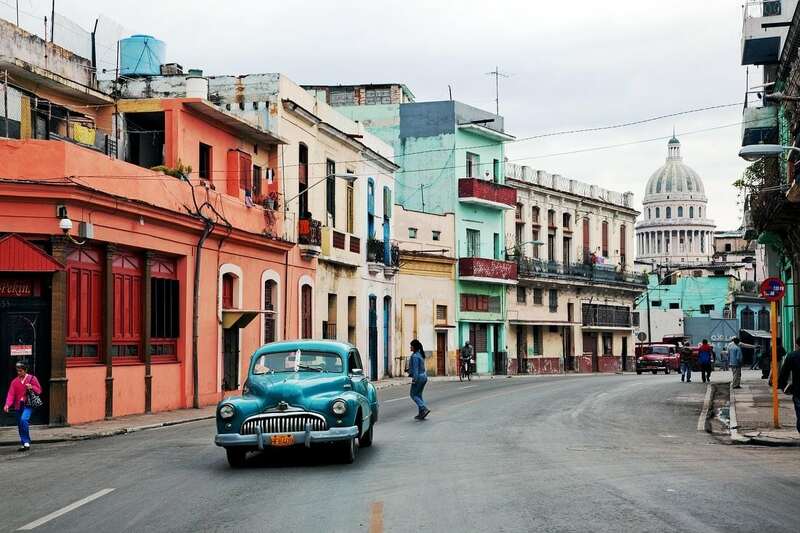 This one will also be with Norwegian Cruise Line, on their second cruise to Cuba aboard Norwegian Sky. 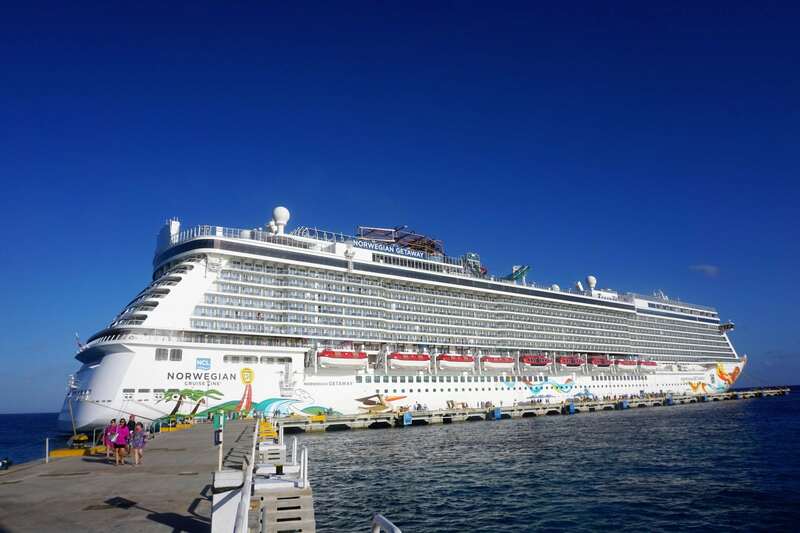 Have you sailed on Norwegian Getaway to the Western Caribbean? What did you enjoy about the ship and ports of call? 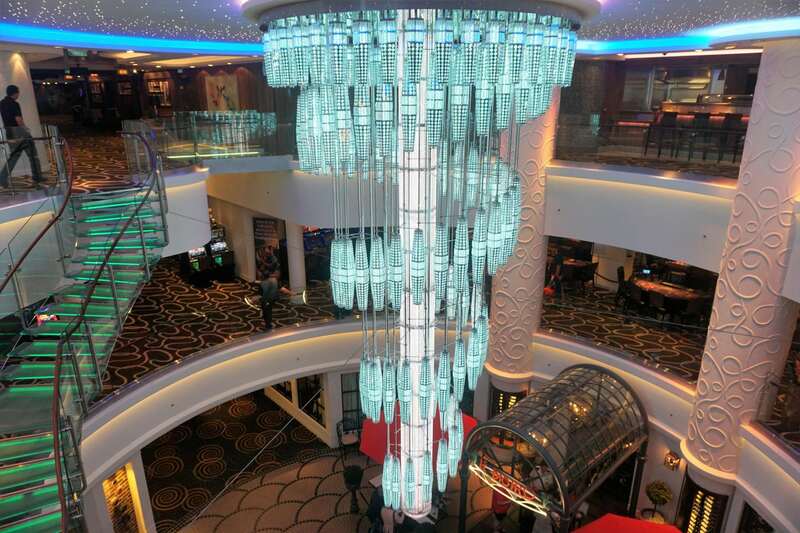 Drop us an anchor below to tell us about your experiences on this great ship. Just book this cruise for next month. We’re excited. Thanks for the review! Hi Nick, we are excited for you! Have a great trip, Getaway is a fabulous ship. Thanks for reading and the comment. We just got back from this cruise yesterday. We had a wonderful time and got to explore some places we would have never traveled to otherwise. Enjoy!